I’ve already posted airliner pictures at San Diego, Los Angeles, Chicago and New York, where the bulk of my photography took place. Here’s the first page in a series of “other” airports, beginning with those sprinkled across the western U.S. and Alaska, in no particular order. I’ve also included in a few shots taken by my late brothers, Bob and Bill, and friends no longer with us. Be sure to click on individual pictures for a larger view. Additional images were added to this page on March 5, 2017. 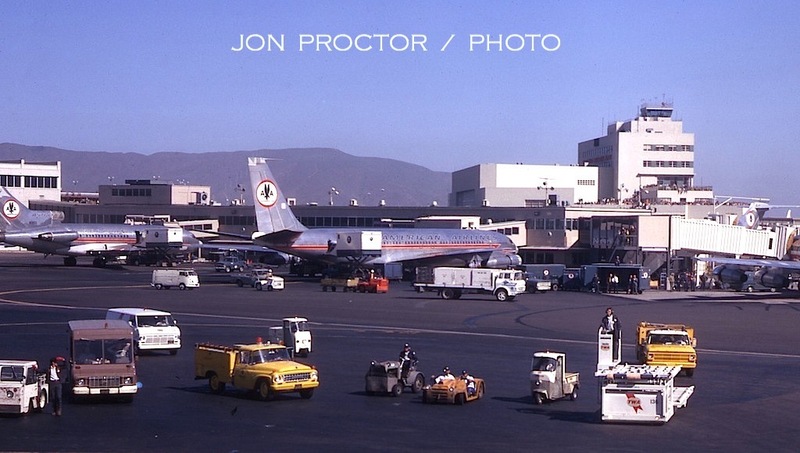 My first visit to SFO occurred briefly on August 27, 1961, a one-day, five-segment junket. I flew up from San Diego, via Burbank, on a PSA Electra, using a travel agent courtesy pass, then retuned on Western, via LAX. This rather grainy picture was taken from 720-047B N94143 as we left the gate, showing Electra N9746C about ready to depart, also for LAX, where I caught it to San Diego via Long Beach. A Pacific Martin 404 hides behind the turboprop. I came north again on July 8, 1962, and took these four pictures. Above, PSA Electra N172PS bought me there from San Diego via LAX. I had time to scramble up in the concourse before one of the pilots got off the airplane. At the adjacent gate, sister ship N175PS sits idle. The SFO observation deck, seen in the Western Electra photo above, offered great photo opportunities. TWA 1049G ‘Super-G’ Constellation N7103C, pulls out of the gate, bound for Los Angeles; too bad I couldn’t have hopped a ride on this airplane By chance, sister-in-law Ann Proctor was on board! Looking back to the east, we see the two PSA Electras shown earlier, along with Pacific Air Lines Martin 404 N40438. Returning to SFO in December, I caught the same Martin at the same gate. By now, the Four-O-Four markings had been removed. 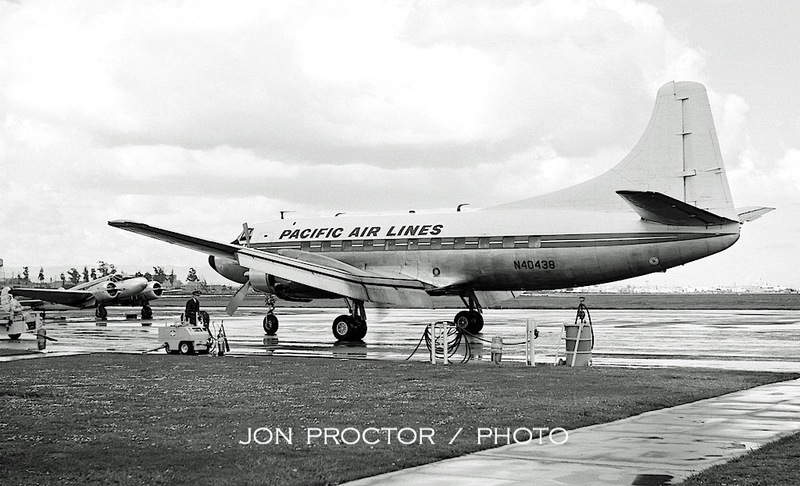 A day later I caught Pacific F-27A N2770R pulling into its assigned gate. 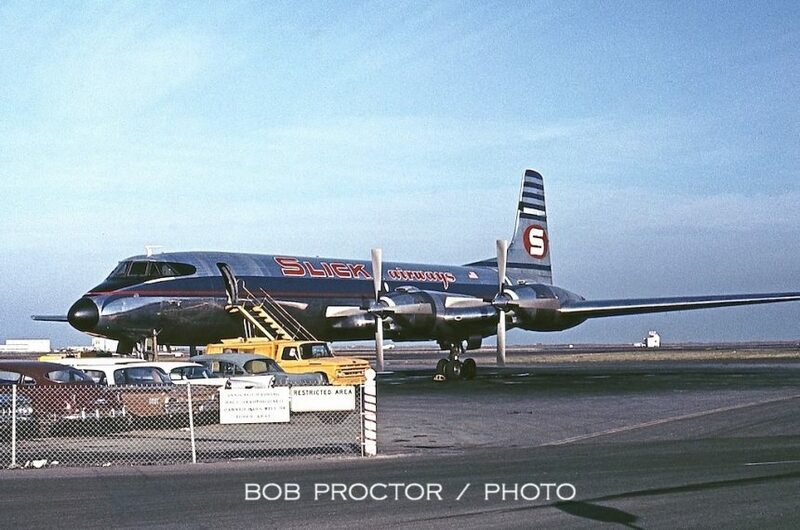 On May 7, 1964, as this same airplane was flying the short hop from Stockton to SFO, a deranged murderer shot the pilots, causing it to crash with the loss of all 44 aboard. 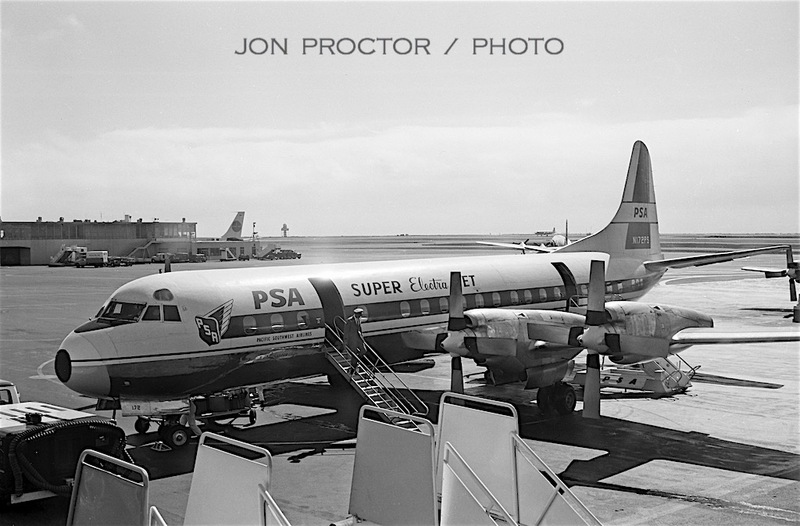 By March 10, 1963, when the next four pictures were taken, I was working for PSA in San Diego (details here), affording me unlimited passes. 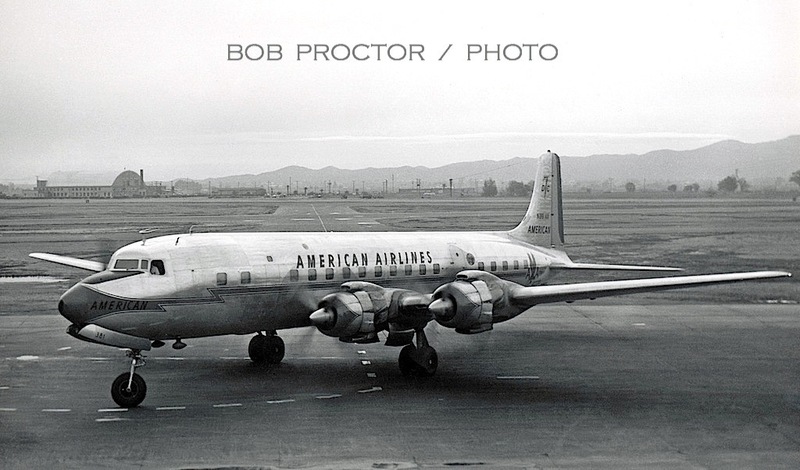 The airline only served SAN, LAX, BUR and SFO, so options were limited! 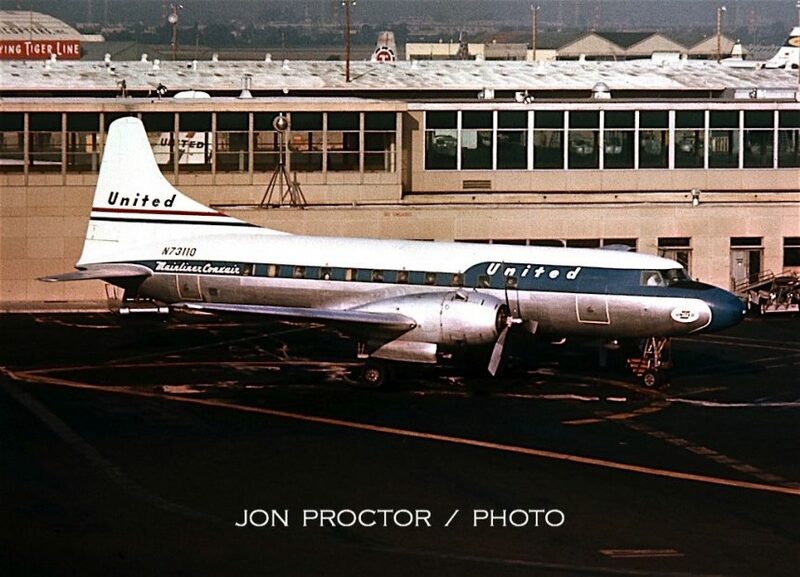 Above, three-year-old DC-8-21 N8025U, Jet Mainliner Annie E Johnson, sits at United’s circular, ‘pinwheel’ gate complex. 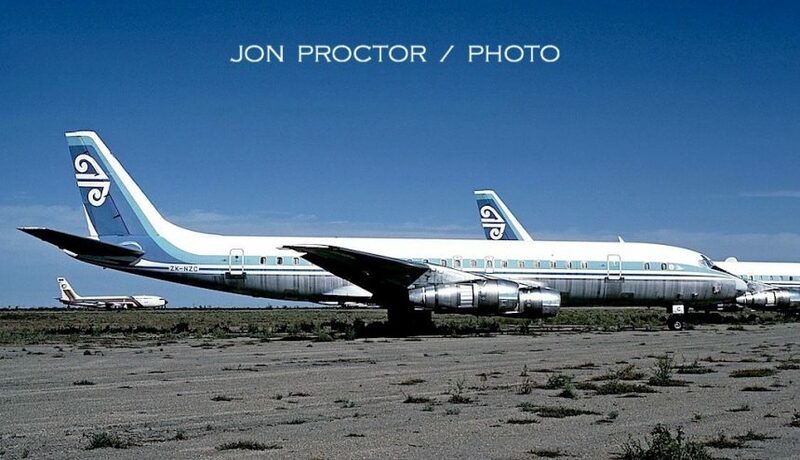 Having flown 18 years with The Friendly Skies, it was withdrawn from service in 1978 and broken up. 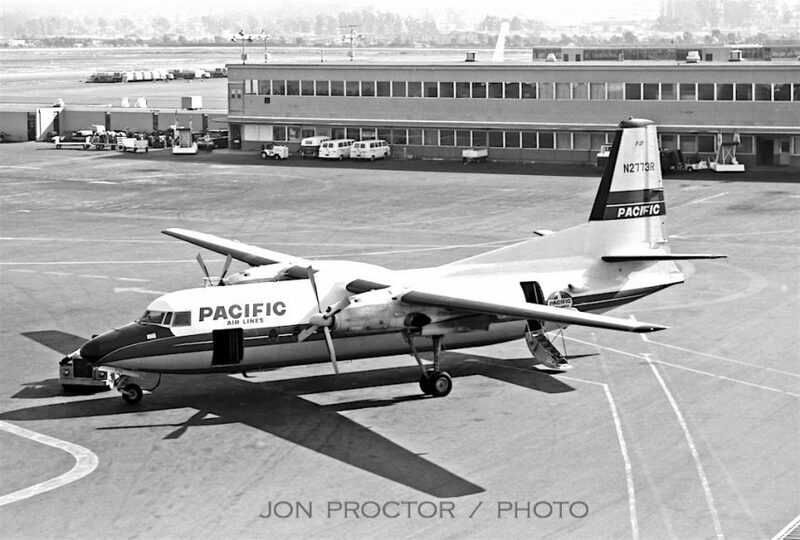 Another Pacific F-27A, N2773R, awaits customers. It enjoyed a better fate, migrating via mergers to Air West and Hughes Airwest before seeing duty with a variety of carriers. Ontario, California-based Air Cortez is the last operator of record. Having not ventured into the Pacific Northwest, West Coast Airlines was new to me when I spotted immaculate F-27 N2701 at SFO, its southernmost destination. Only later would I find great friendship with several WC employees. 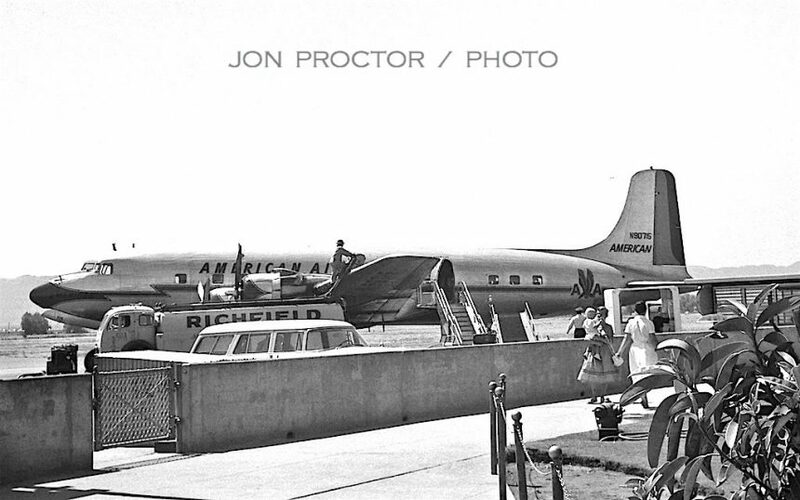 On July 4, 1963, I was out at the airport early after having spent a few days off in the Bay Area. An early overcast canceled out most of the sunlight, but I still caught a couple of pictures. 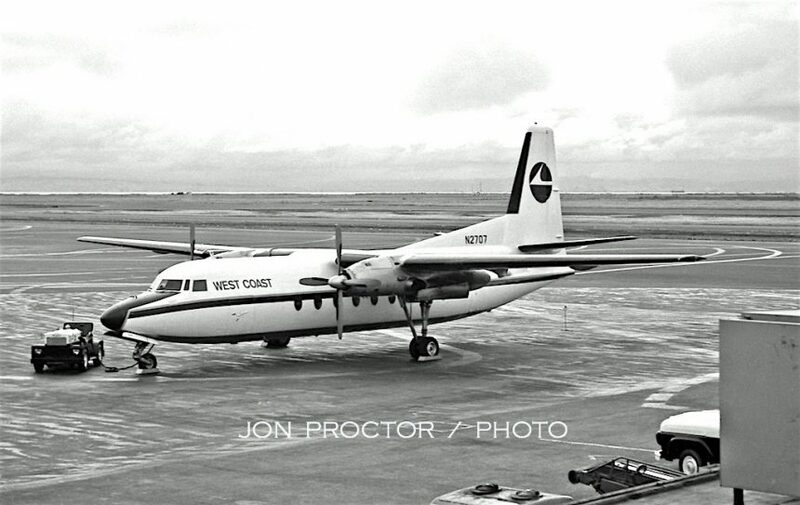 Here’s West Coast F-27 N2707 in the carriers then-new livery. It took some getting used to for me. This terribly grainy picture wouldn’t be worth of posting except for its content. 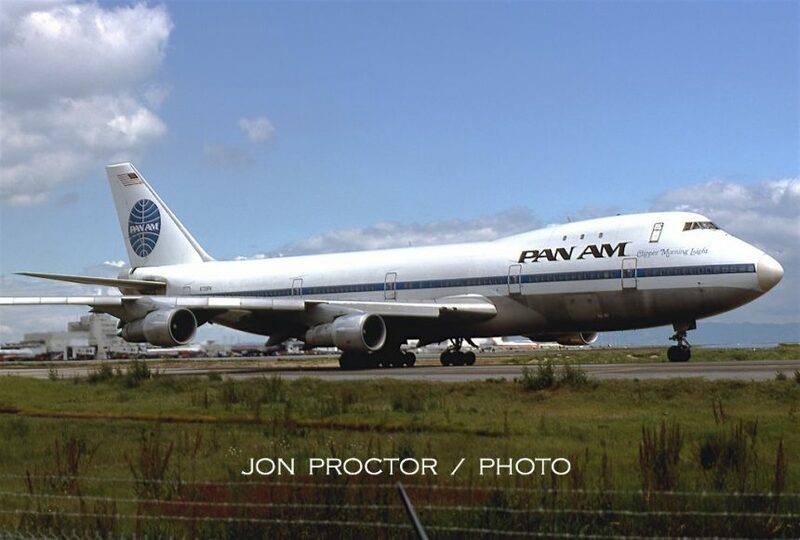 Pan Am had purchased 702-023B N7547A from American Airlines a few months earlier and not yet re-registered it as N780PA. I believe it was operating a service to Central America via LAX, but don’t have a period timetable to verify that. I do recall walking out on the concourse and boarding the airplane unmolested for a look-see; try that today and I’d be in jail! It retained a basic AA interior except for removal of the first-class lounge. Electra from Electra. I was heading to San Diego on September 4, 1973, aboard PSA’s N173PS, passing N175PS at the gate. It was my first and only SFO-SAN nonstop flight My logbook says “97,” meaning I got the 97th seat out of 98. The airline did not allow non-revs in the last seat, for reasons I never completely understood. Some said it was so a friendly gate agent wouldn’t leave a revenue passengers off in favor of a fellow employee. 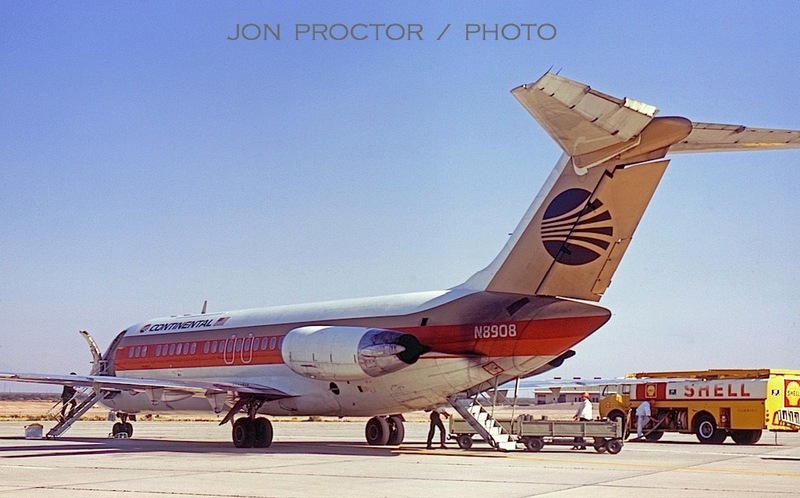 Gulf Oil of California owned this good-looking Convair 580, N98G, which brother Bob photographed. 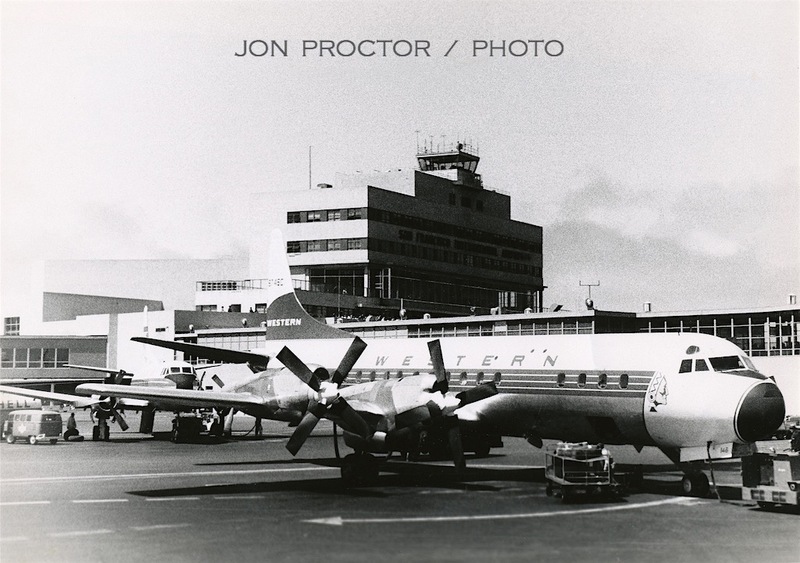 It was purchased new in 1957 as a Convair 440 and upgraded to turboprop power four years later. Founded in 1946, cargo operator Slick Airways began with C-46 Commandos, gradually upgrading its fleet with the DC-4s and Constellations. It later began operating the Canadair CL-44, an offshoot of the Bristol Britannia. An example sits at the cargo ramp in December 1963; unfortunately the registration is not visible. The company’s assets were acquired by Airlift International in 1966. Only 39 CL-44s were built. For years United flew Convair-liners up and down the West Coast on multiple-stop services. N73110 shows off its last color scheme, with slanted United titles and the oval logo on its nose. 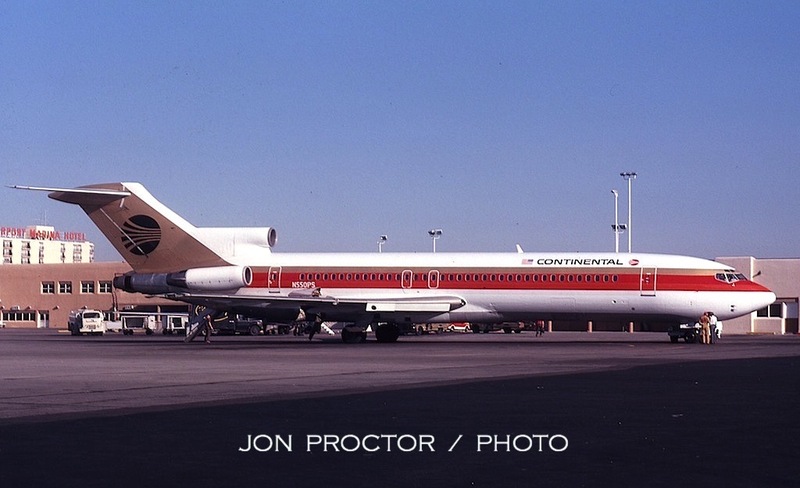 The carrier operated 75 Convair 340s without a single fatality, a remarkable record. Fourteenth off the assembly line and originally named Mainliner Detroit, N73110 was sold to Tex Johnston Inc. in 1968 and converted to -580 standards. Talk about the good old days. Kids hanging on the fence, watching airliners close enough to smell the Avgas! 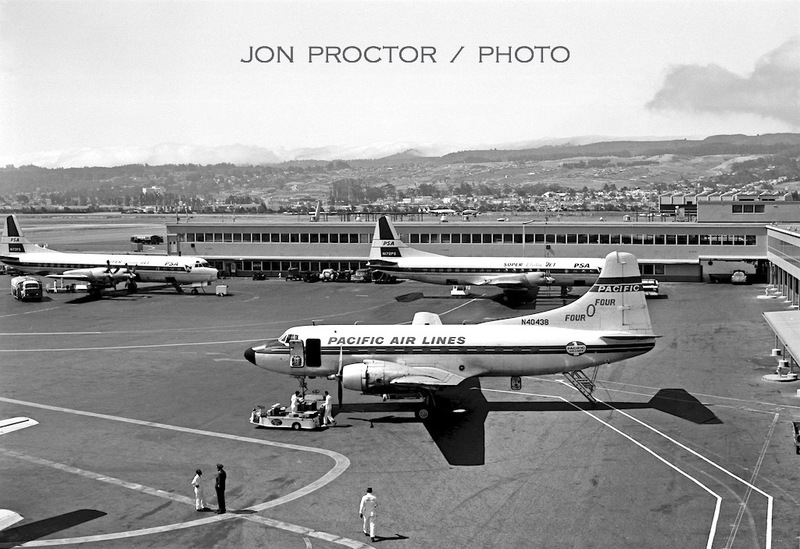 Cousin Dennis Brent was living in Santa Clara in early 1964 and San Jose (SJC) was the closest commercial airport. He would pick me up at SFO, but returning I took took the opportunity to get a Martinliner in my logbook. The short SJC-SFO segment was something like $10. 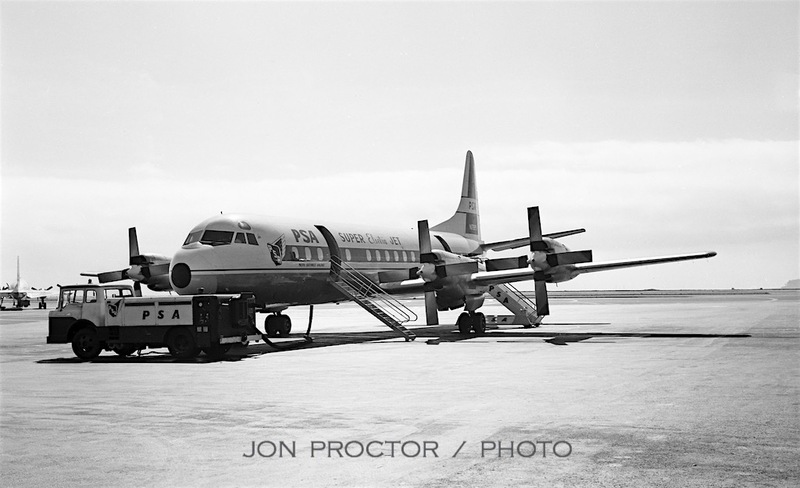 Above: Former Eastern Martin 404 N455A has just pulled into the gate, on January 25, 1964. 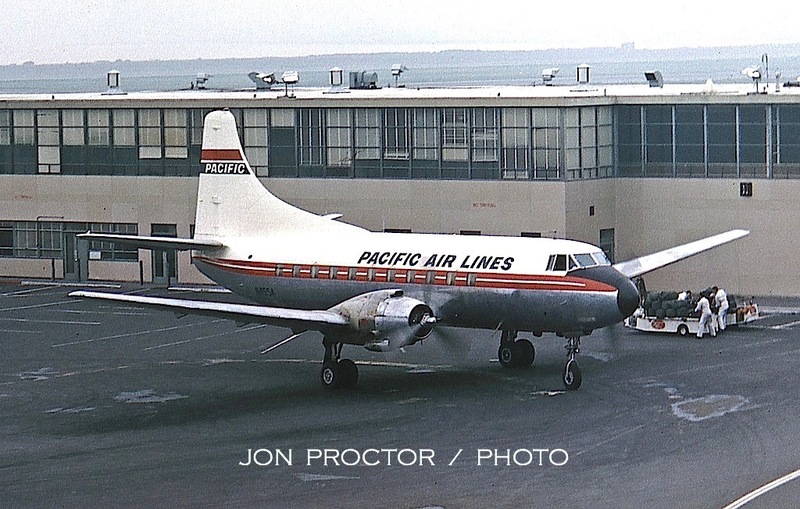 Two Pacific Air Lines ground agents handled the whole show, one escorting arriving passengers off the tarmac, while the other unloaded bags from the forward door; the No. 2 engine is left running for the brief station stop. Below: Later that same day, N455A departs from SFO. I carried two cameras, one for color slides; the other held black & white print film. A roll of Kodachome 25 was an expensive item back then! Two months later I repeated the trip and this time drew N40438, the former TWA Martin 404 pictured earlier. It is shown, above, arriving on a wet afternoon. Below: It looks like we were using a different gate, at he end of the terminal tarmac. A vintage Beech 18 sits to the left. 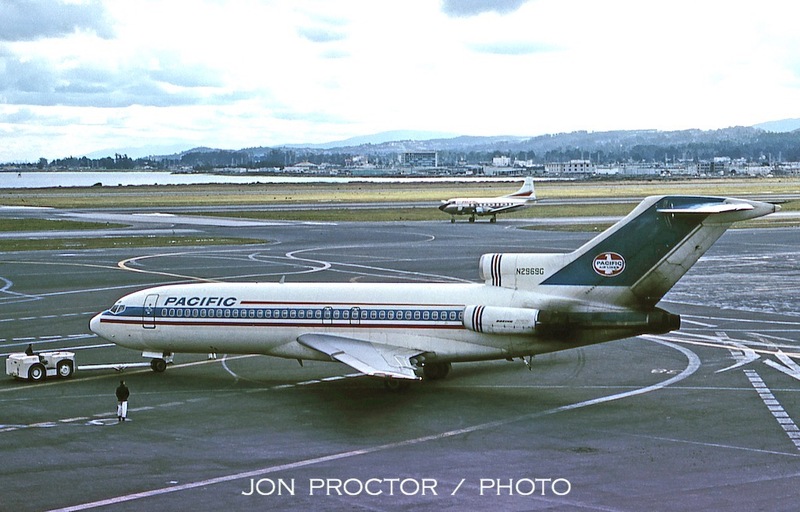 For whatever reason, Pacific seems to have gradually removed portions of its livery; note a bare tail, the third variation seen, with the registration lowered to a point below the window line. 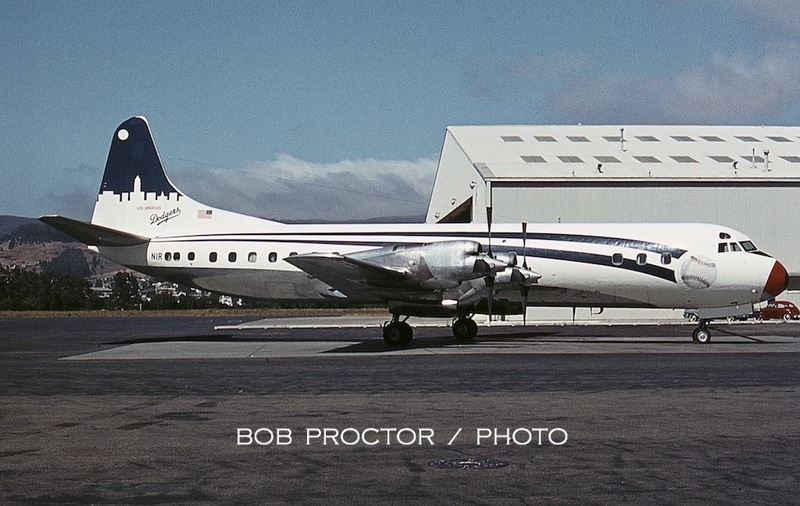 Back at SFO in June, brother Bob caught the Los Angeles Dodgers baseball club’s Lockheed 188C Electra, N1R, parked at a hangar while the team played at Candlestick Park. It looks like an American Airlines radome replacement was installed on a temporary basis. The Republican party’s national convention was held at the San Francisco Cow Palace in July 1964. 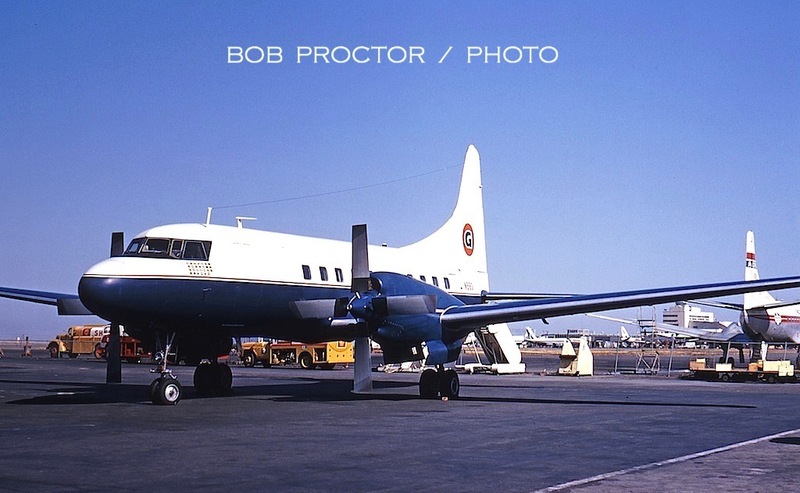 Bob photographed sharp-looking Lockheed 1329 Jetstar at the United hangar. A note on the slide mount says the government jet brought presidential candidate, Senator Barry Goldwater in from Arizona. Fast forward to January 1967 for this look at a Pacific Air Lines Boeing 727-193 being pushed back from the gate, with a company Martin in Pacific’s updated livery visible in the background. One of three of tri-jets operated by Pacific and then successor Air West, N2969G wound up on lease to Alaska Airlines and crashed on approach to Juneau, September 4, 1971. TWA performed line and periodic maintenance at SFO, as evidenced by these two jets at the company hangar. Above: 707-131B N796TW, above, looks ready for its next assignment. 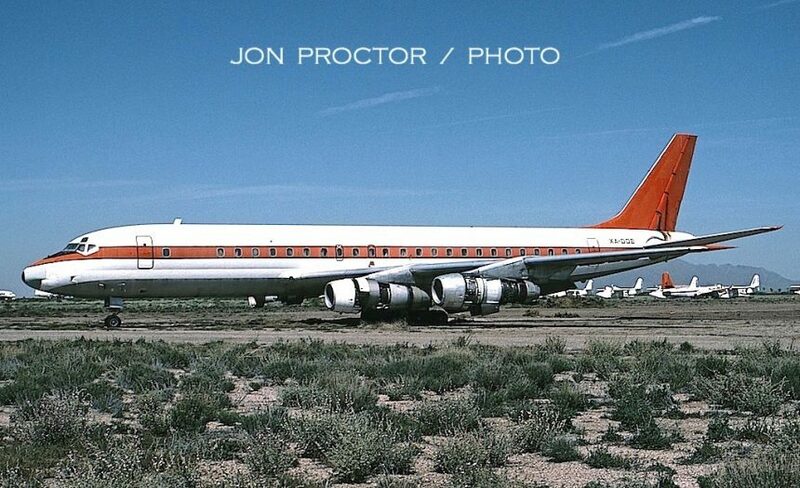 Below: 707-331C N15711 was delivered just two weeks before I caught her, on July 12, 1968. 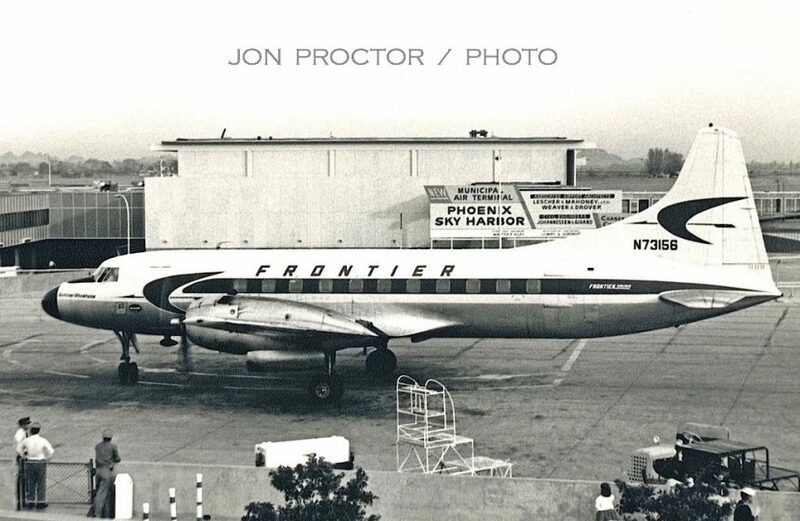 A pure freighter, it nevertheless had passenger windows … painted on! 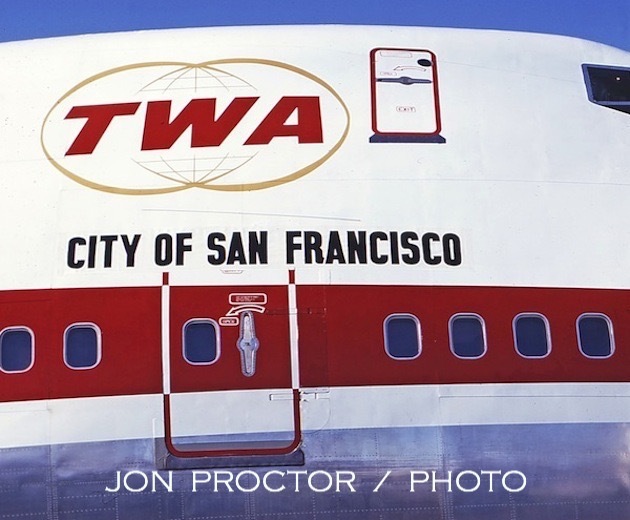 TWA Jumbo Jet service at SFO was inaugurated on April 5, 1970, utilizing 747-131 N93104, seen shortly before departure to New York, and bearing the name City of San Francisco, which was actually a paper banner removed after Shirley Temple Black christened the airplane with a bottle of champagne. I was lucky to get a seat on this nearly full flight. We stopped traffic with our departure, as evidenced by all the ground vehicles sitting idle during pushback from the gate. Even the observation deck is filled with onlookers, and I remember cars pulling off the Bayshore Freeway as we taxied by, en route to the departure runway. Here’s a good comparison of two different 707 variants. Above: “straight-pipe” 707-131 N733TW, and below: turbofan-powered 707-131B N747TW. The -131B fleet, with one brief exception, was used exclusively on domestic operations, so did not need the VHF radio “stack” antenna atop its tail. 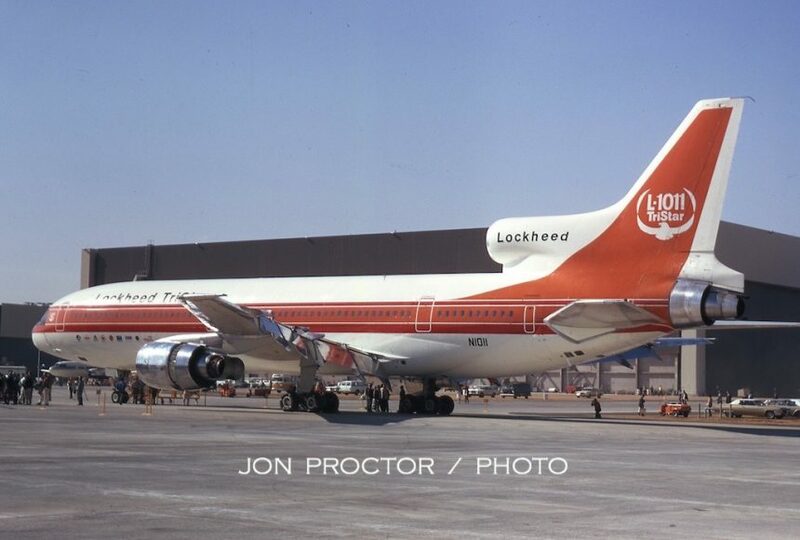 My good friend, the late Dean Slaybaugh, caught 747-131 N93119, barely three months old, as it turned onto the departure runway in January 1972. It was lost shortly after takeoff from New York-JFK on July 17, 1996, breaking the hearts of all TWAers. 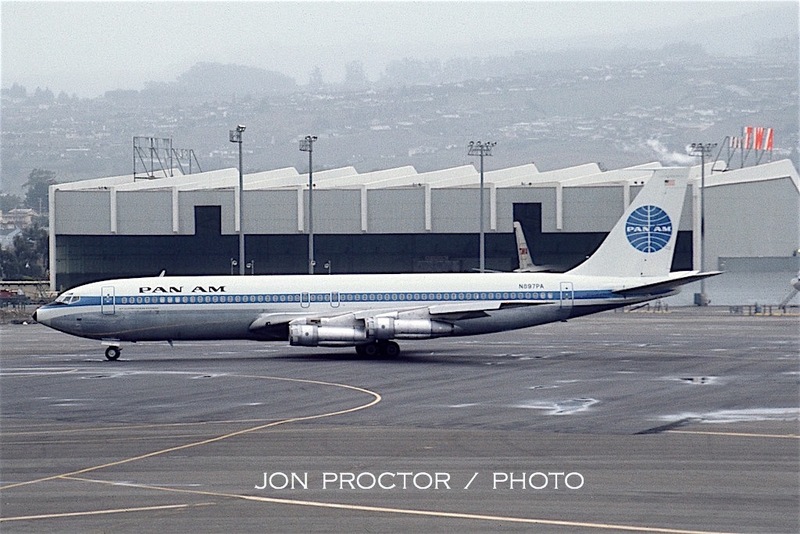 Febuary 6 was a foggy day at SFO when I caught Pan Am 707-321B N897PA, Clipper Ocean Express, leaving the gate. 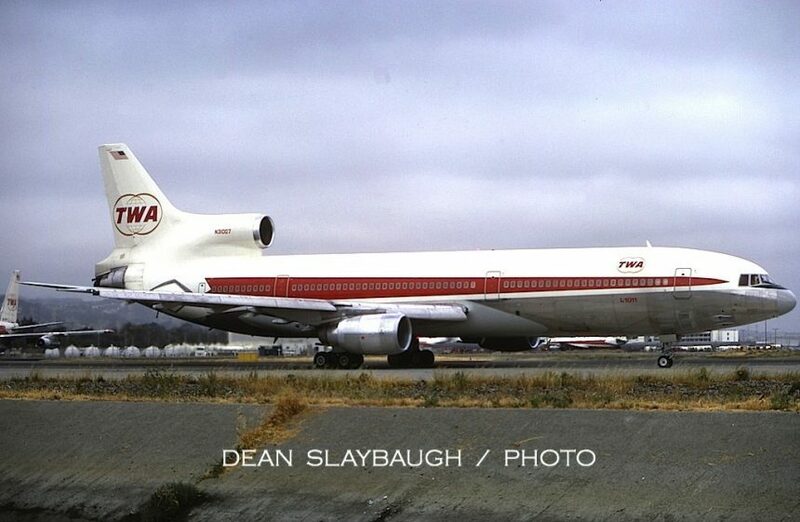 Dean caught TWA L-1011 N31001 in June, on a station visit prior to the type’s SFO startup. It sits adjacent to the company hangar; a variety of aircraft can be seen in the background. TriStar N11002 turns into the gate on July 16. 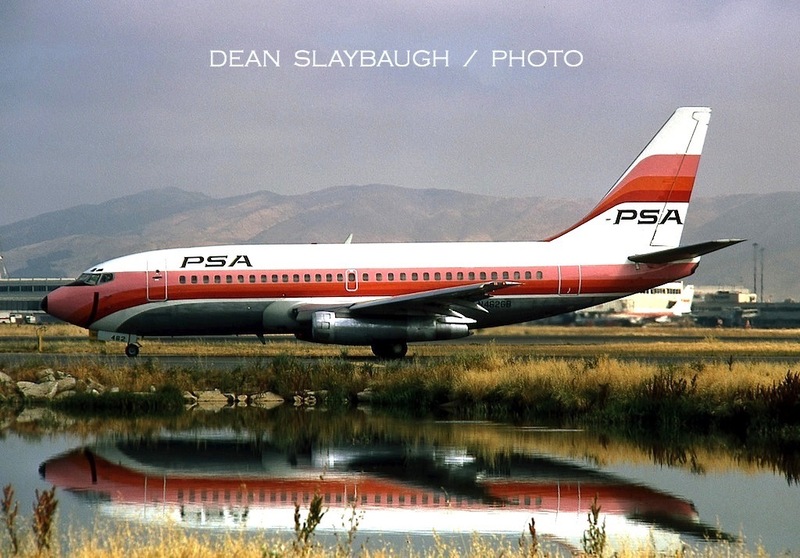 Dean also took this great reflection shot of PSA 737-293 N462GB in June 1973. 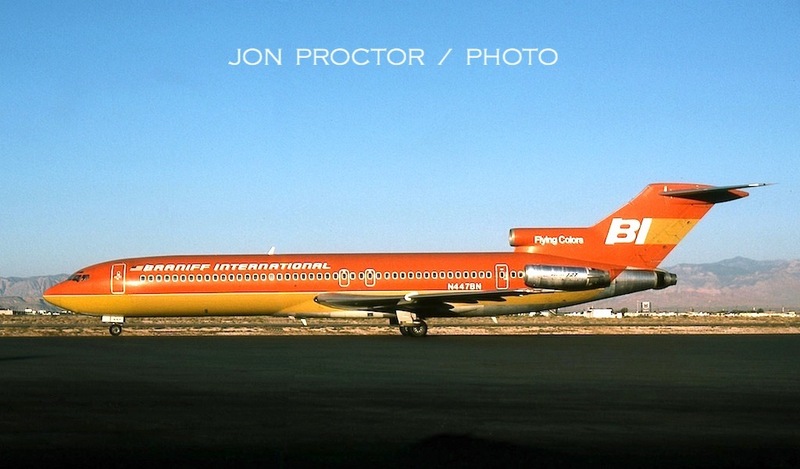 Twentieth off the assembly line and built for Pacific Air Lines, it was instead purchased by a leasing company and operated by Air California, sub-leased to PSA and returned to Air Cal, flown by American Airlines and even did a brief stint with the reborn Braniff. The Boeing twin was finally scrapped at Kingman, Arizona in 1994. 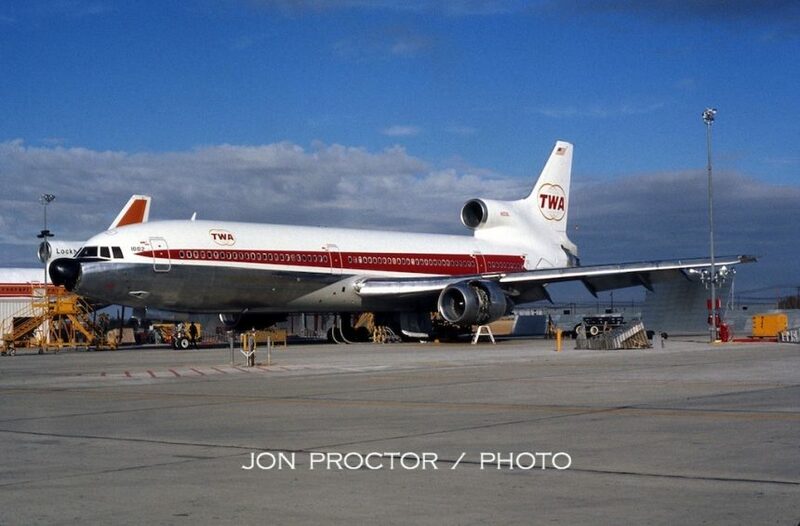 Here’s another of Dean’s shots, of TWA L-1011 N31007. On April 19, 1974, it burned at the gate in Boston when a coffee warmer pad, left unattended, caused a fire that consumed most of the cabin. The airframe was still intact but considered a write-off. TWA bought it back from the insurance company for parts and scrapped what was left. 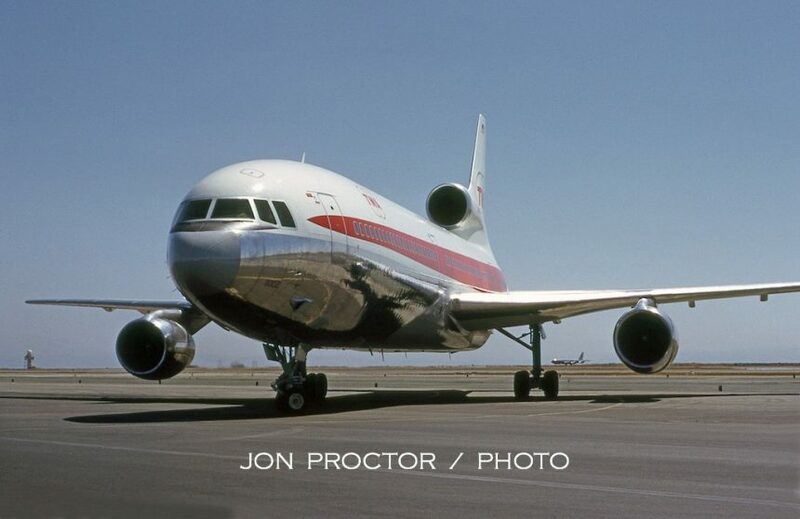 On June 6, 1973, I photographed Eastern L-1011 N309EA while it was on cross-lease to TWA for the summer months. 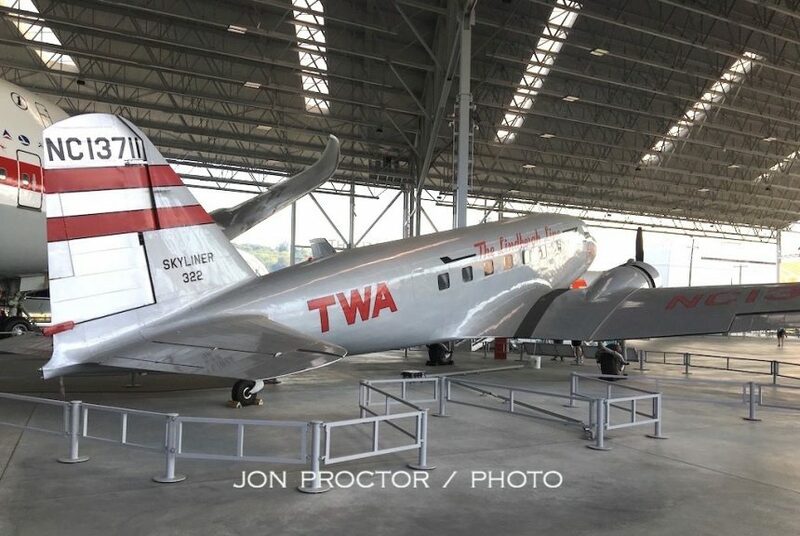 A small “Leased by TWA” sticker was applied on the fuselage, just behind the front boarding door. There’s quite a jump from the last image. I visited SFO April 4–8, 1978, with my friend Geoff Thomas. 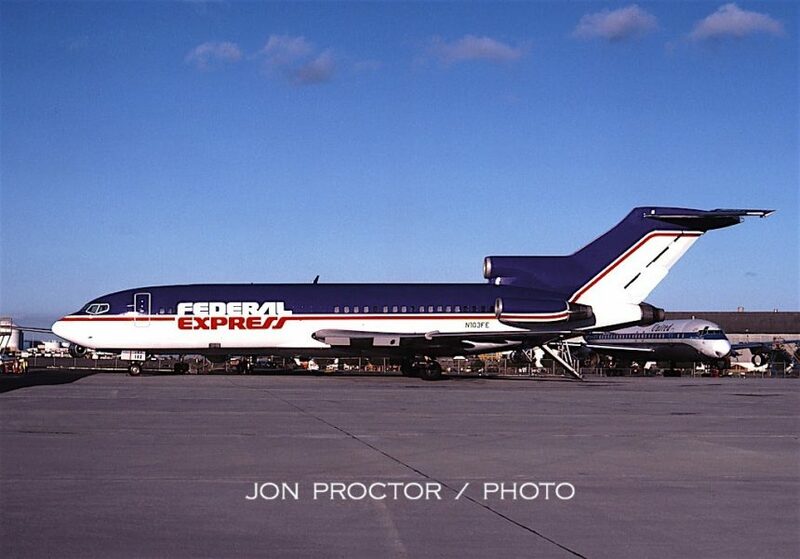 This was my first look at a Federal Express “big jet,” in the form of 727-22C N101FE, which had been operated as N4722C, a quick-change freighter, by United. FedEx acquired it in January. Over at United’s overhaul base, N103FE looks to have just been repainted. 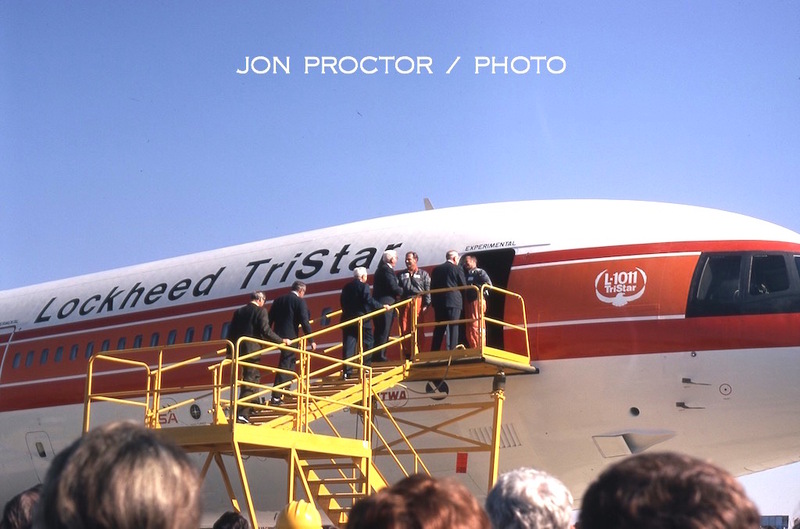 Records show the tri-jet was handed over to its new owner on April 5. 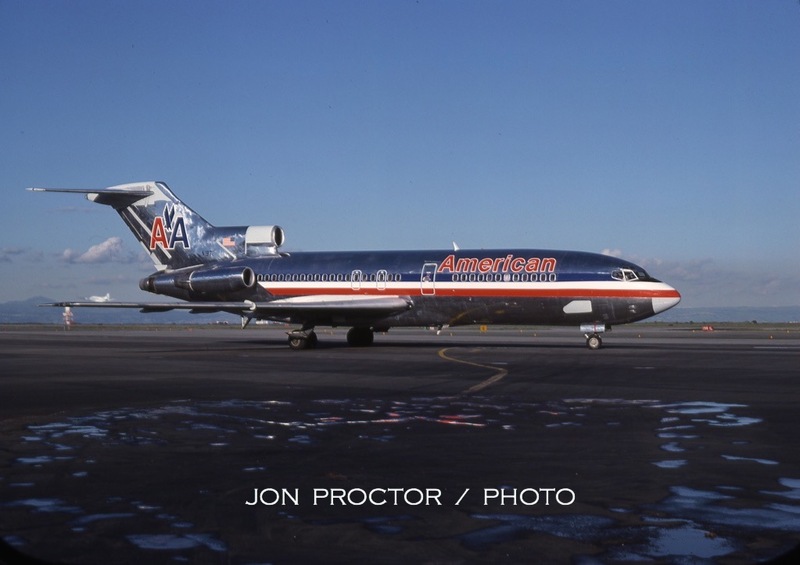 I will miss American’s polished-metal liveries. The sun was perfect for this portrait of 727-23 N1971. From nearly the same spot, we see TWA 727-231 N64322, about to leave the gate wearing the twin-stripe livery introduced four years earlier. Soot from engine reversers was later minimized by redesigning the devices, but until then, frequent tail washes were necessary. It looks like this airplane is overdue. N41016 shows “1011” markings on the No. 2 engine inlet, which TWA changed from “L-1011” at some point. Those marketing folks always had a new angle for advertising! There used to be a great shooting opportunity, just off the Bayshore Freeway, allowing pictures of aircraft about to turn onto the departure runway; here are three examples. First, PSA 727-214 N534PS. The newer type style looks awkward on the center engine inlet, a bit too high. But all the pictures I have show the same location. 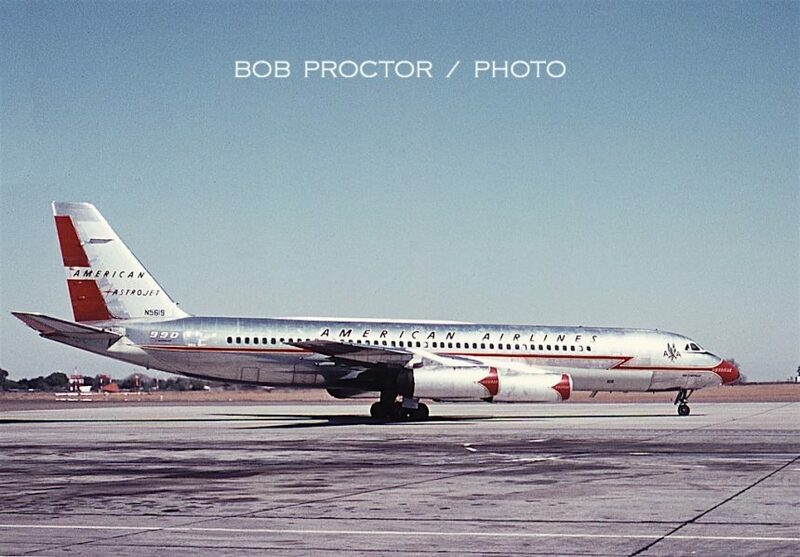 This airplane went on to fly for Eastern as N534EA, then the Trump N911TS and finally the USAir Shuttle. It was broken up in 1994. 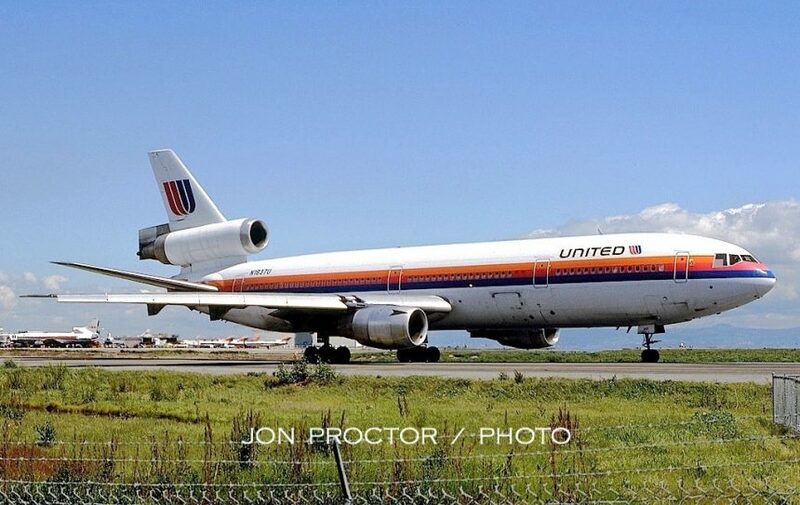 This United DC-10-10 was one of five leased to Delta for three years in 1972. 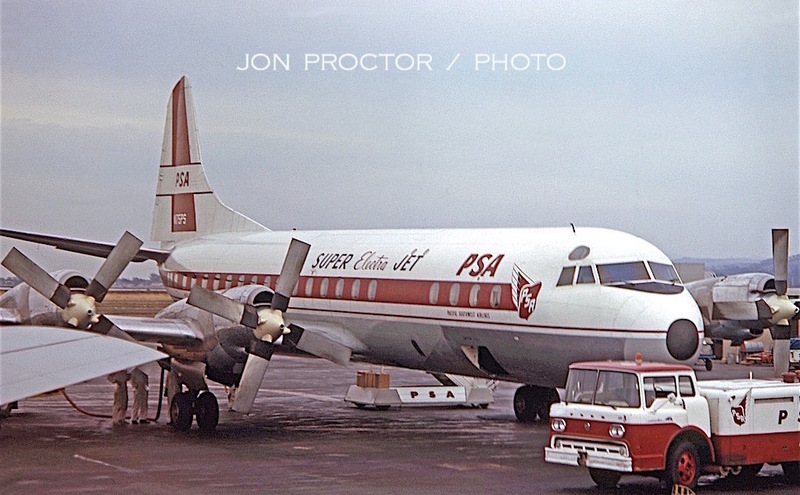 First registered N605DA, it joined The Friendly Skies in May 1975 as N1837U, and was later flown on lease by Canadian Pacific. FedEx picked it up in 2001, changed the tail number to N382FE and put into storage for planned conversion to MD-10 standards. Impacted by the events of September 11, it was instead parted out, at Goodyear, Arizona. Pan Am 747-121 N739PA Clipper Morning Light, later became Clipper Maid of the Seas, and was barbarically destroyed by sabotage over Lockerbie, Scotland, on December 21, 1988, killing 259 innocent passengers and crewmembers. I caught a few pictures at San Jose on October 20, 1984, from a great vantage point that allowed unobstructed photography. 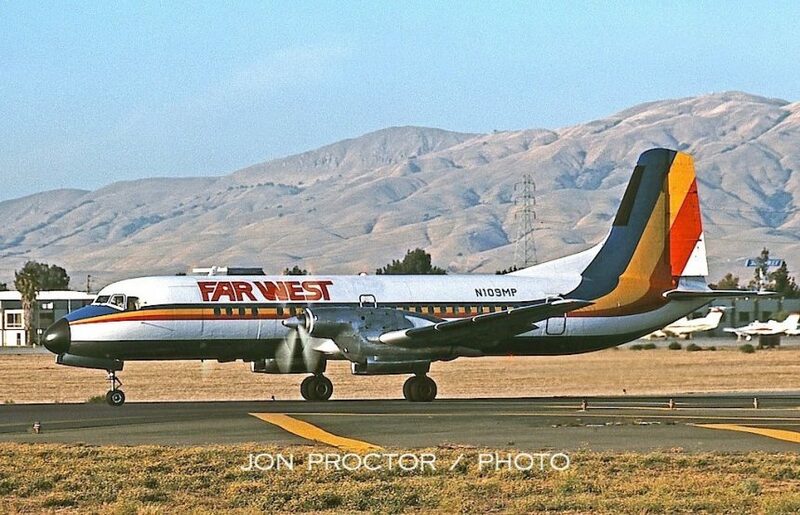 Fresno-based Far West Airlines only lasted four months. Its YS-11 wore basic Mid-Pacific colors with its own titles. 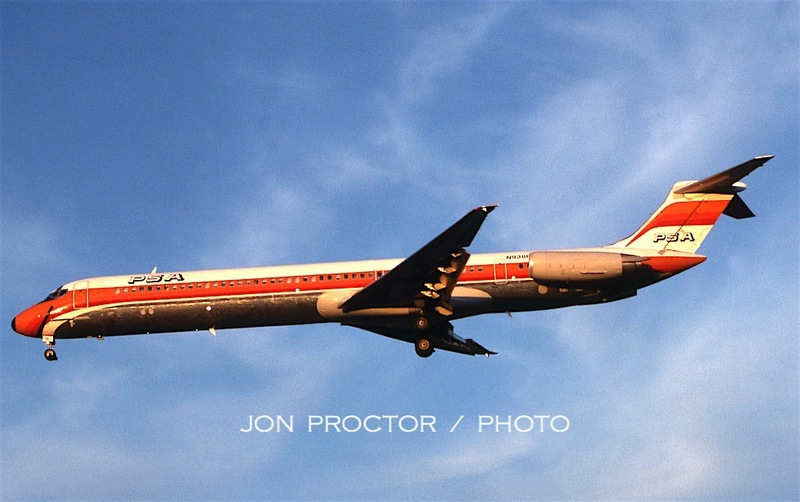 Piedmont Airlines operated the type back east but it was unusual to see out west. The airline folded a month later. United 727-22 N7027C begins its takeoff roll. 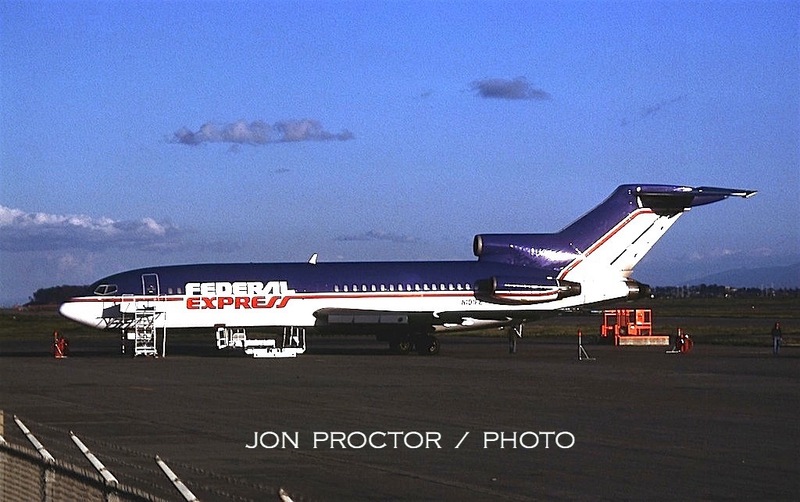 It was briefly leased to Alaska Airlines in 1980, then intended for FedEx as N161FE in 1990 but not taken up, and scrapped four years later. It was too dark for ground photos, but still good enough for this landing shot, of PSA DC-9-82 N938PS, named The Smile of New Mexico. 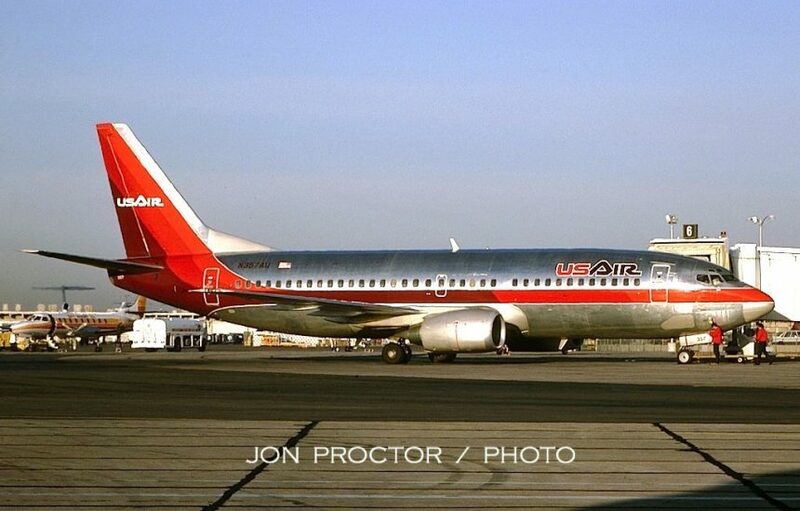 It migrated to USAir in 1988 as N814US. This seems like a logical place to stick in the only picture I ever took at Ontario, California, in 1965, where I was working TWA fog diversions from Los Angeles. I barely had time to shoot a pair of Bonanza F-27As, two Pan Am 707s and a United DC-8 freighter. 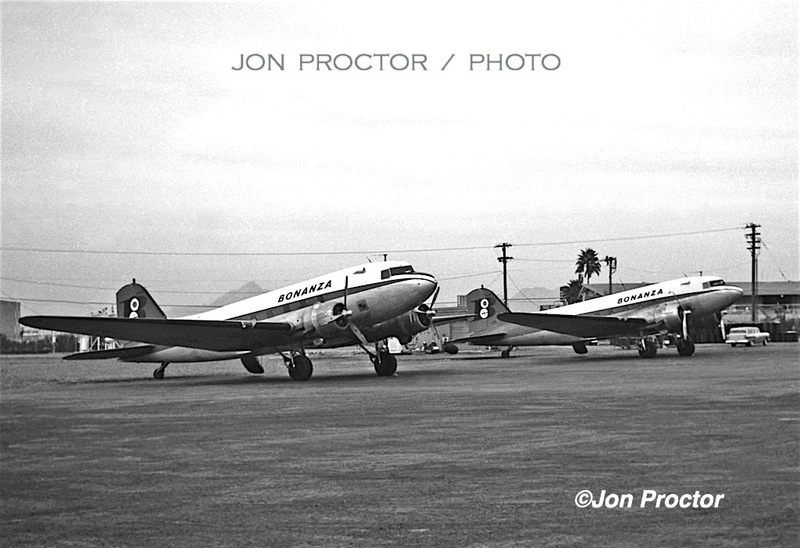 Bonanza was the only carrier operating scheduled flights to ONT, but this pair was also detoured from LAX; which on that morning continued to encounter below-minimum visibility. 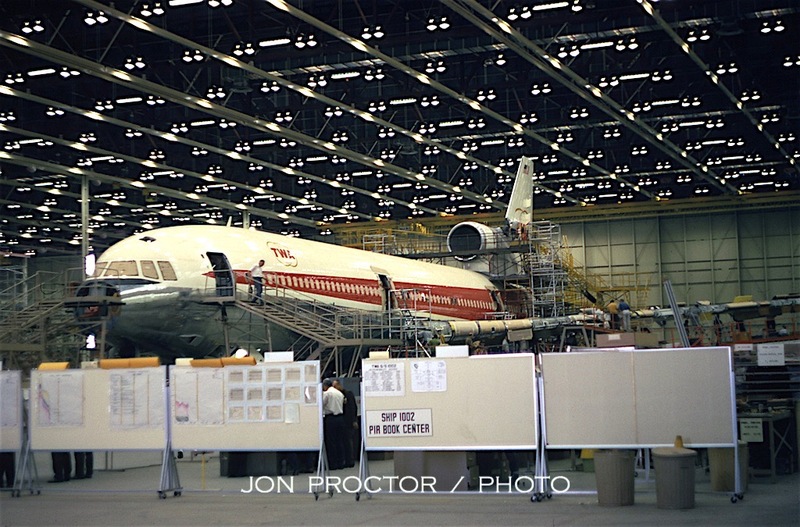 While involved with TWA’s L-1011 program, I visited Lockheed’s Palmdale factory several times, and did some picture taking when time permitted. 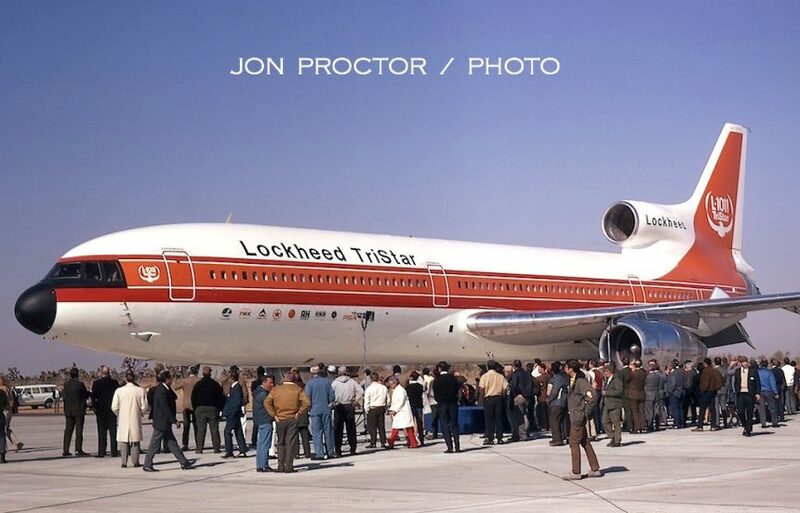 My first and most memorable experience there was to witness the type’s first flight, on November 16, 1970. 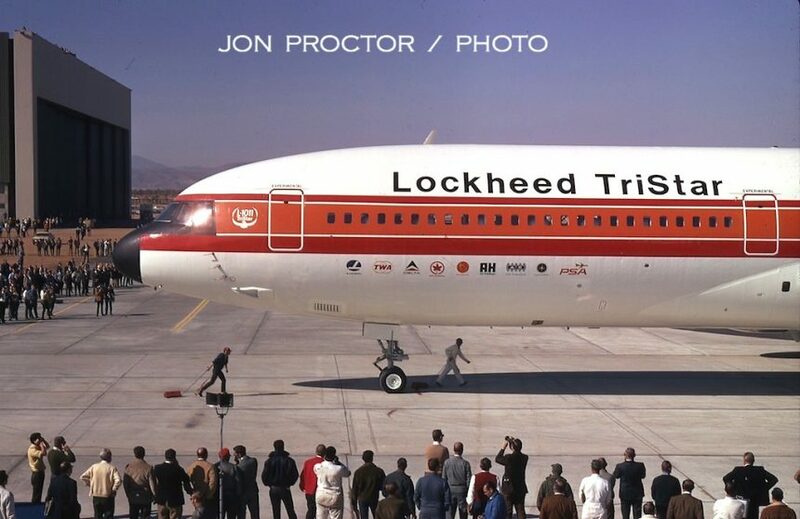 I was with the other invited guests, across the field, when a Lockheed photographer captured this image as the TriStar lifted off on its maiden flight. 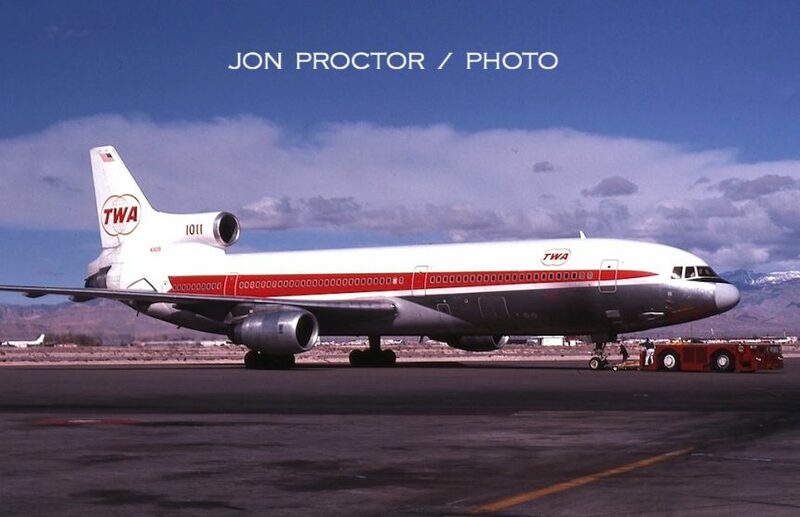 The film was quickly transported to a photo lab for development, allowing 8X10 prints to be handed out before the L-1011 returned to Palmdale! Project Pilot and Aircraft Commander Hank Dees was kind enough to sign it for me. Below is a sequence of five images I shot as the airplane returned from its 2-hour test hop. Co-Pilot Ralph Cokeley (standing in the doorway) is congratulated by Lockheed Board Chairman Dan Haughton. To the left, Aircraft Commander Hank Dees shakes hands with President Carl Kotchian. 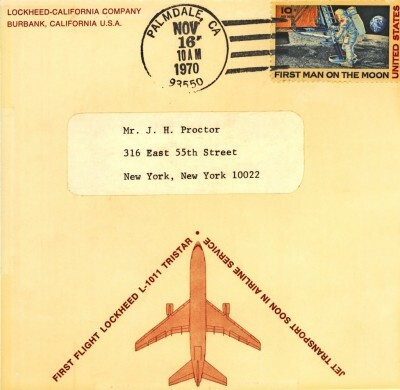 In the orange jumpsuit, Flight Engineer Glenn Fisher, logbook in hand, heads back to the Lockheed office. In the factory, Ship 1002, the first painted in an airline livery, is prepared for rollout. 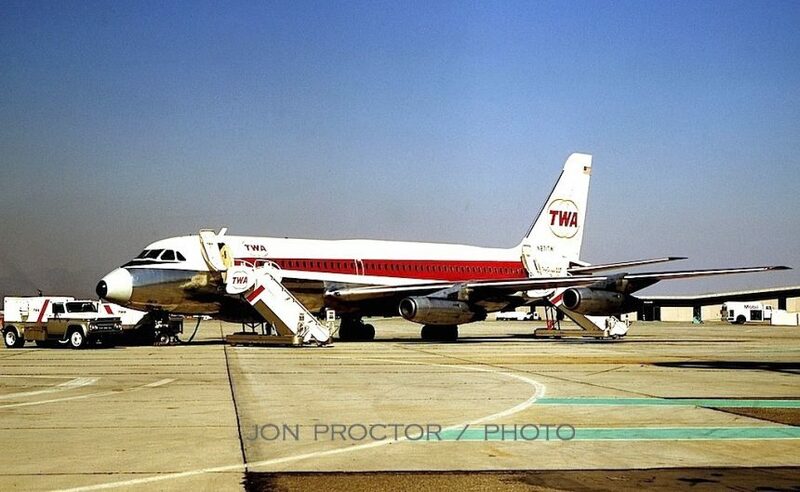 It was later assigned to Eastern and never flew for TWA. I took four pictures on February 4, 1972. Now for some confusing trivia: Ship 1002, seen earlier, was registered N31001 until TWA chose to defer early deliveries because of weight issues. Because that tail number was reassigned to Ship 1013, N1031L was applied to what later became N301EA when the airplane went to Eastern. Now stay with me. 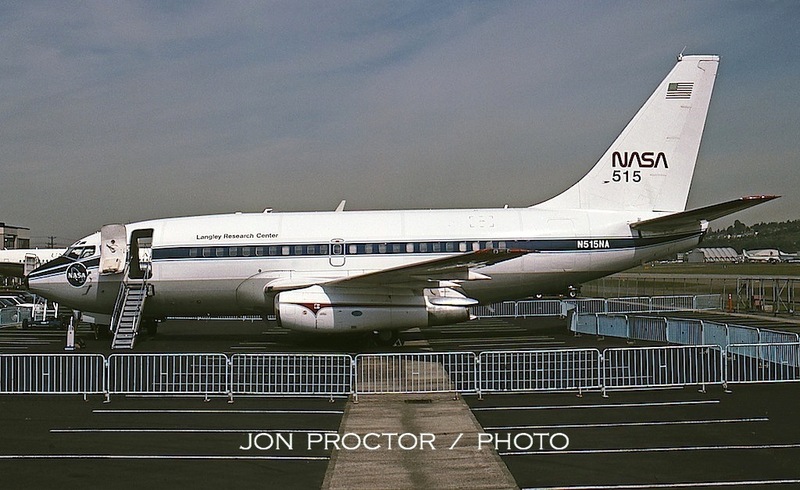 Here’s N301EA on Ship 1003, also used in the flight-test program. As the reg was given to Ship 1002, this airplane was later assigned N302EA. It wears promotional titles and logos applied for a sales tour. In the factory, Eastern’s N308EA appears to be next out the door. TWA’s second production TriStar, N11002, was destroyed during an aborted takeoff at JFK 20 years later. 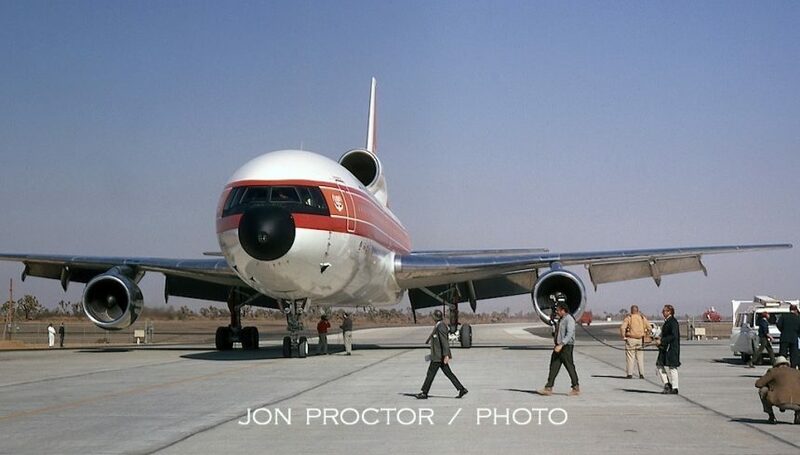 Bright and early on the morning of May 10, 1972, TWA’s first L-1011 flew away from Palmdale on its delivery flight. 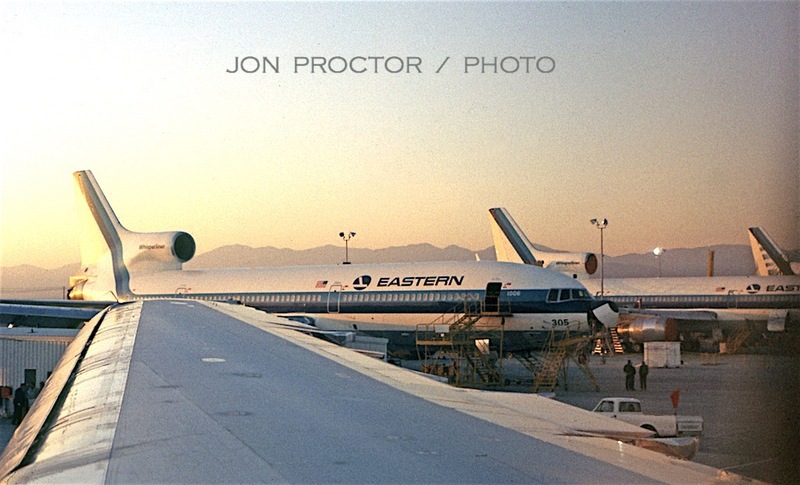 I caught this picture as we taxied past a lineup of Eastern TriStars, on the way to our departure runway. On board our flight were a group of in-flight management people serving as the cockpit and cabin crew, plus Lockheed technical instructors heading for training sessions with TWA maintenance personnel at Kansas City. 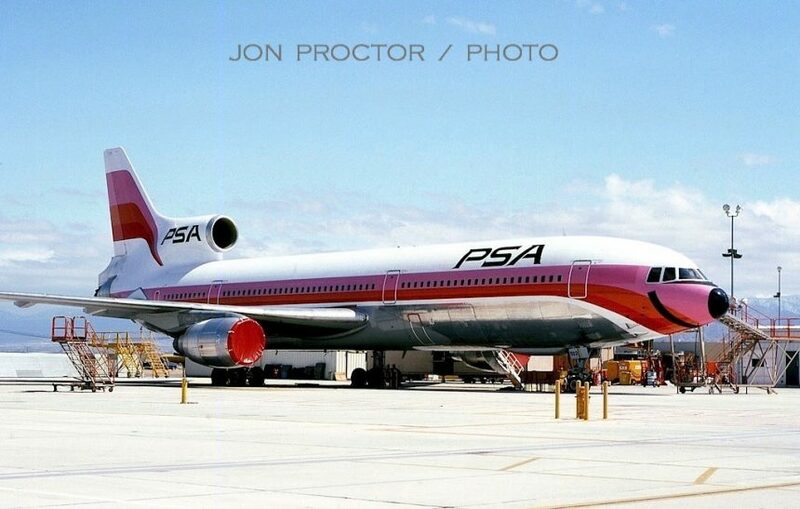 PSA originally ordered two L-1011s, plus delivery positions on three more, for use on its California routes and possible charter work. The second example, N10114, is seen parked on April 25, 1975, after the airline discontinued TriStar service March 31; it had only flown with the airline for six months. Click here to read my story on PSA’s less-than-profitable widebody operation. Here are three more images taken the same day. First, All Nippon Airways 11th L-1011, JA8512 (there was no JA8504) is readied for delivery. The Japanese carrier flew 21 TriStars over a 22-year period. 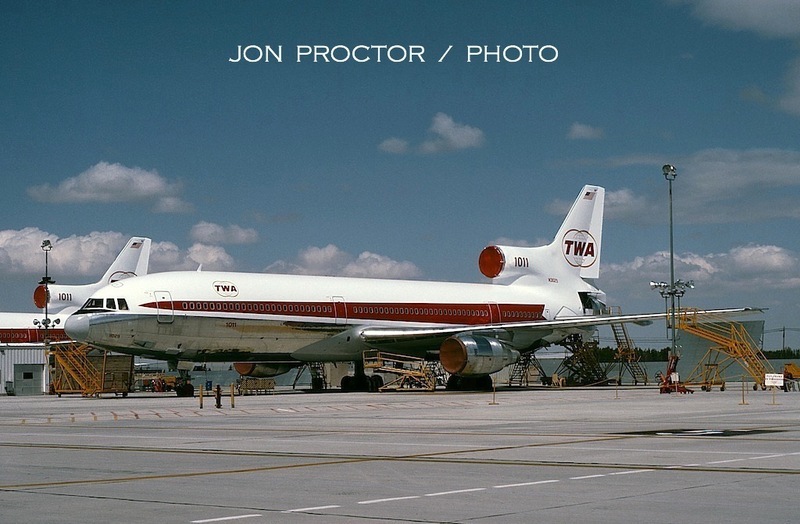 A pair of TWA L-1011s sat side by side on the flight line. Above, N31029, and below, N31030, Numbers 109 and 110 off the assembly line. Deferred delivery resulted in both sitting at Palmdale for another five months. 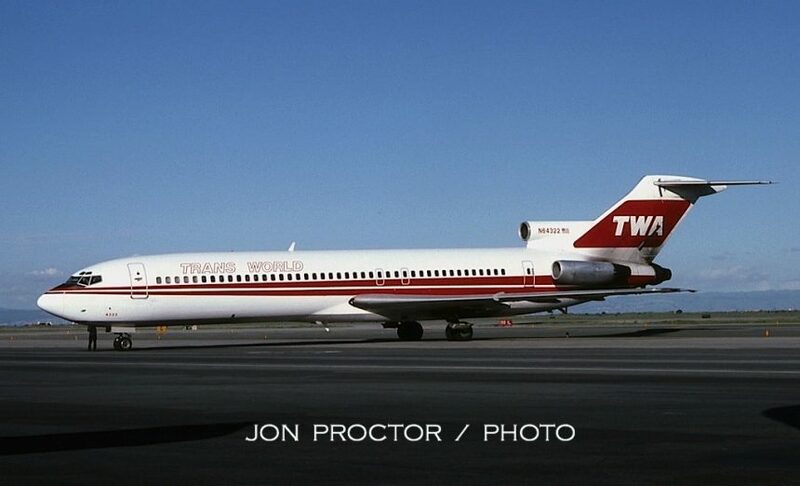 Another delayed delivery, N81027 did not enter service until four months after being handed over to TWA. 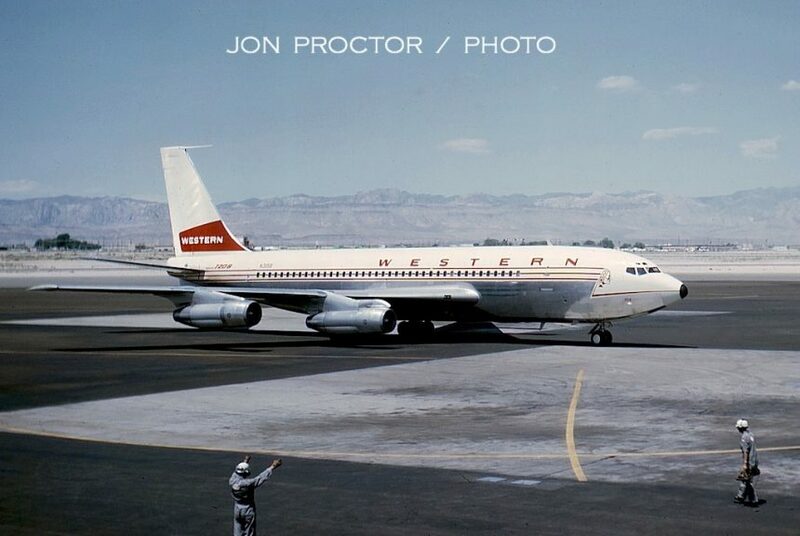 Above and below: Western FAN/JET 720-047B N3158 arrives at Las Vegas’ McCarran International Airport on July 26, 1965, perhaps from Los Angeles. A major 720B operator, WAL operated 27 of the type beginning in May 1961. 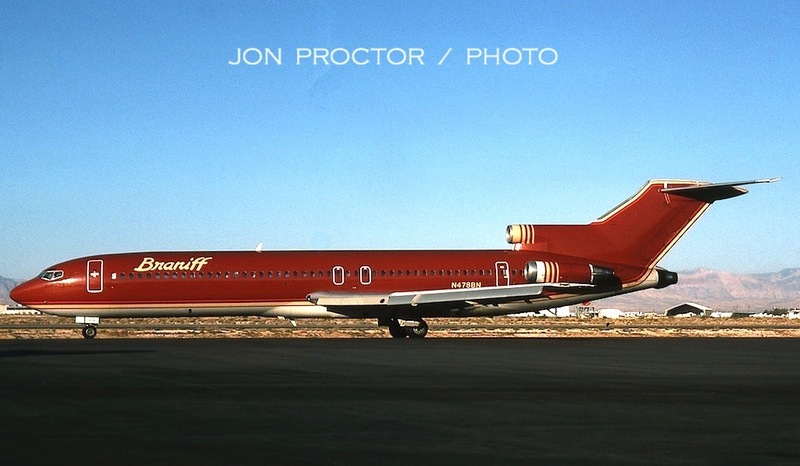 A trio of “straight-pipe” 720s were inherited with the 1967 Pacific Northern Airlines merger. The last 720B was withdrawn in January 1980. 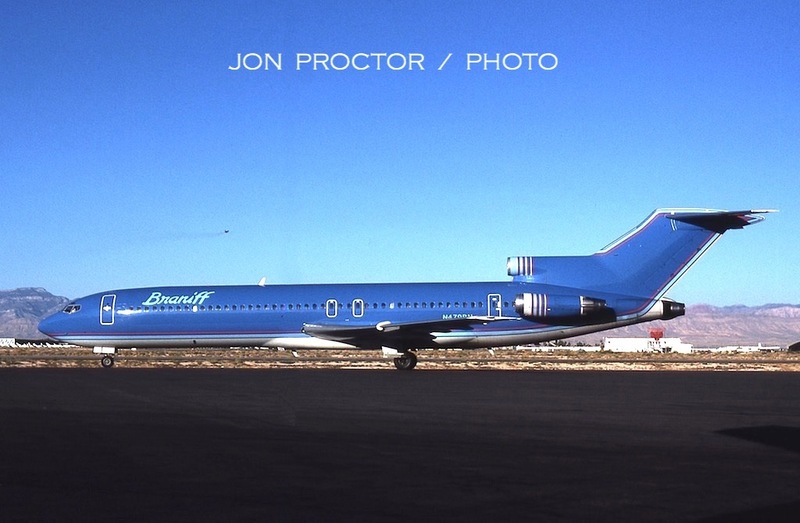 When United Air Lines opted for Boeing 737s instead of DC-9s, many delivery positions became available for smaller carriers, including Bonanza Air Lines. Its first pure jet, N945L, No. 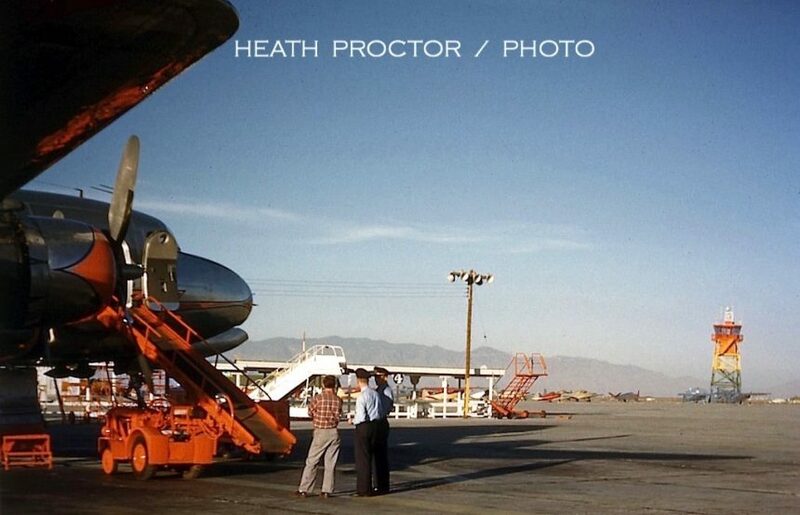 45 off the assembly line, pulls into the gate in June 1966; a company Fairchild F-27A sits in the background. 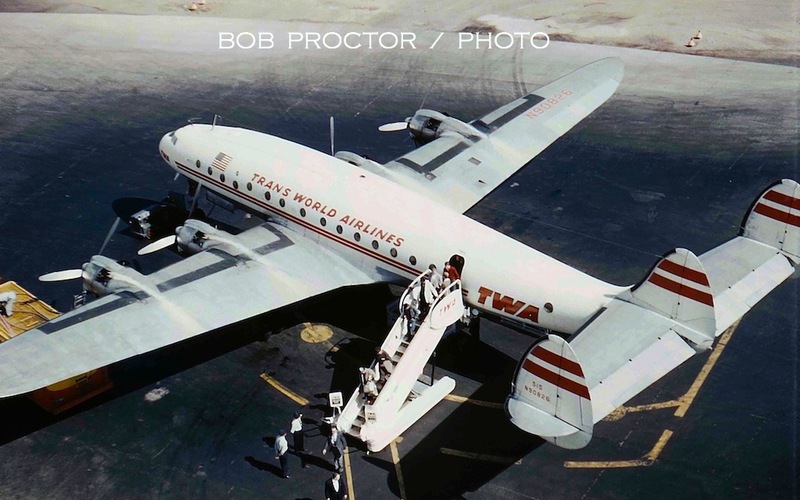 TWA was a major player at Las Vegas from its very beginning, first operating through Boulder City, and one of the first carriers to fly jets into McCarran. 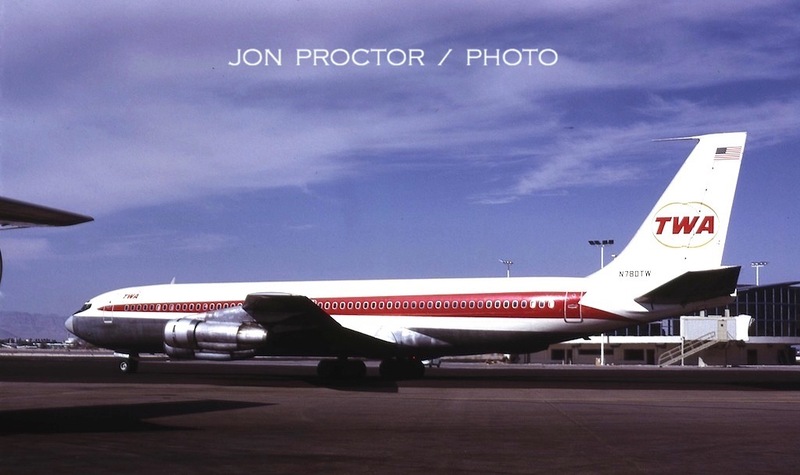 Boeing 707-331B N780TW leaves the gate on October 23, 1972. 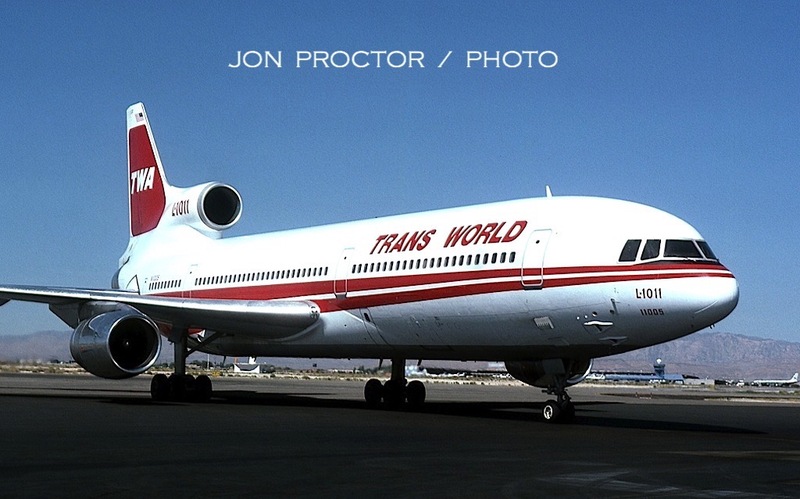 In spring 1975, TWA operated Flight 810, an L-1011 from Los Angeles to Boston with stops at Las Vegas and Chicago. I rode the first segment on April 7 and caught N31019 as it departed for O’Hare Field. 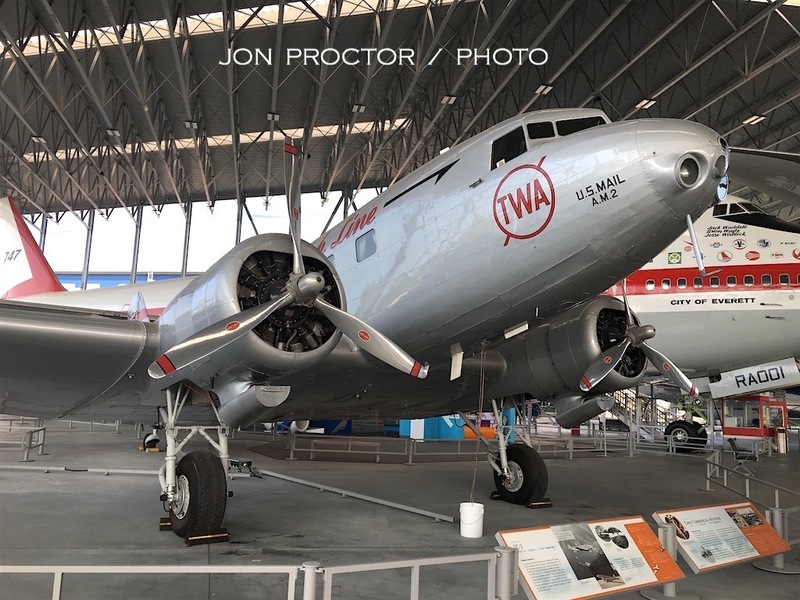 The same airplane now resides at the Wheeler Downtown Airport in Kansas City, part of the National Airline History Museum collection. Click here for more details. 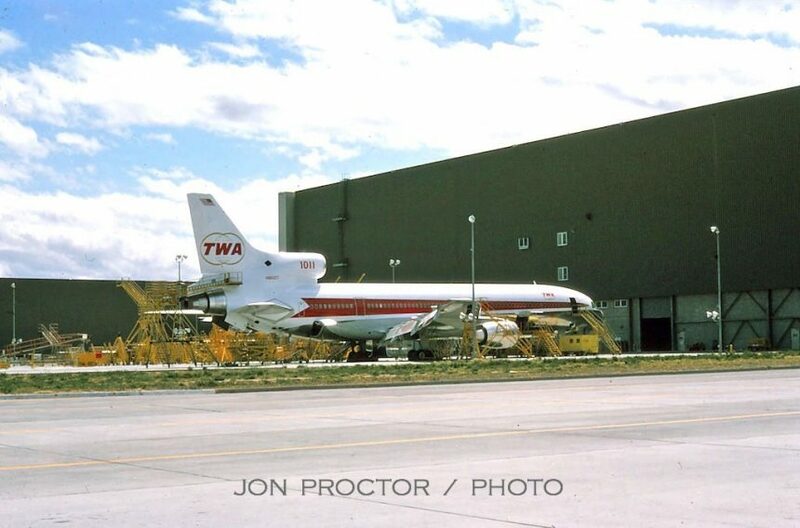 Well-worn TWA 707-331 N772TW, devoid of StarStream titles, rests at a non-Jetway gate on June 22, 1976. By then it had been relegated to charter work with an all-coach layout, bringing tourists to Tinsel Town as part of junkets organized by the Dunes and other strip hotels. 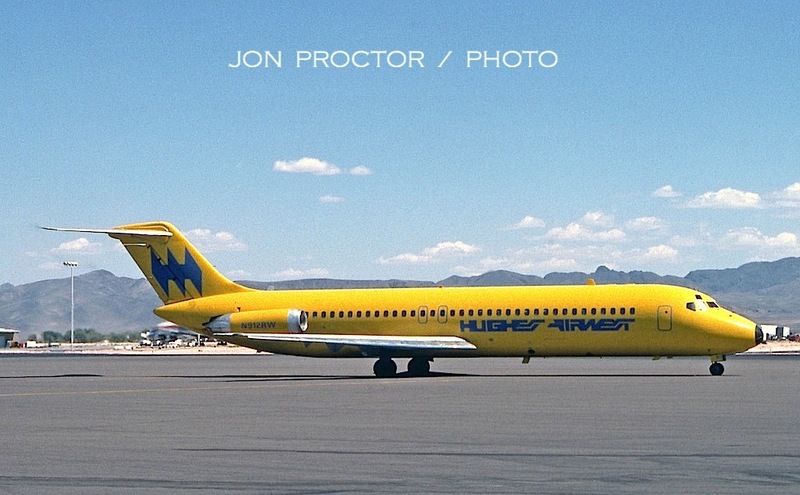 Just a few days later, I caught Hughes Airwest DC-9-31 N912RW in its bright, “Top Banana” livery. 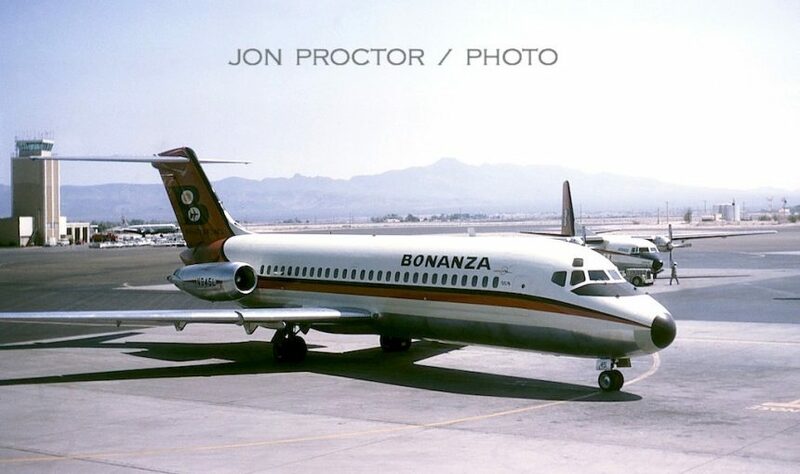 The carrier’s Las Vegas routes originated with Bonanza Air Lines, part of the 1968 three-way merger that formed Air West. 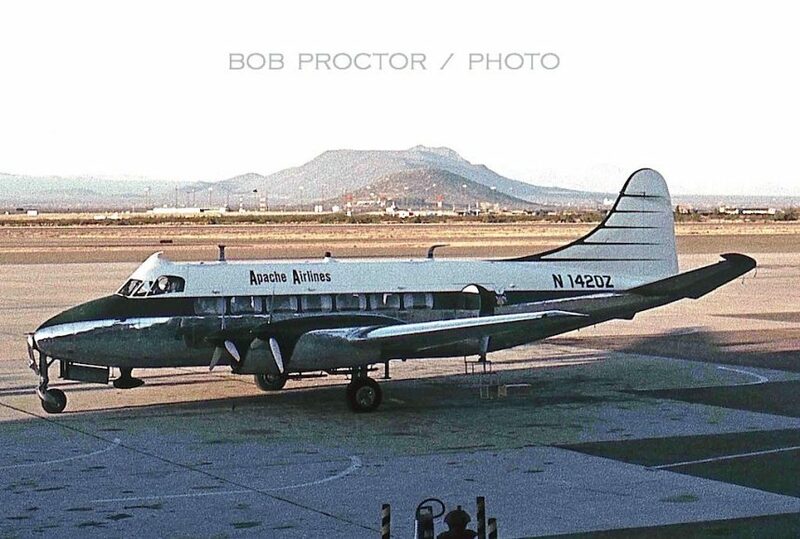 It was renamed Hughes Airwest when Howard Hughes bought the company barely a year later. Acquired in March 1976 from Hawaiian Airlines, N912RW migrated via merger to Republic and finally Northwest, wearing the same tail number. It was retired in 1999. Mackey International Airlines, not to be confused with the original carrier of the same surname, began Ft Lauderdale-Las Vegas-Los Angeles service in April 1980. I caught the company’s lone jet, ex-Delta DC-8-51 N821E, just two months later, in June, and the service ended in July. It looks like the No. 4 engine front nacelle piece had been replaced without repaint. 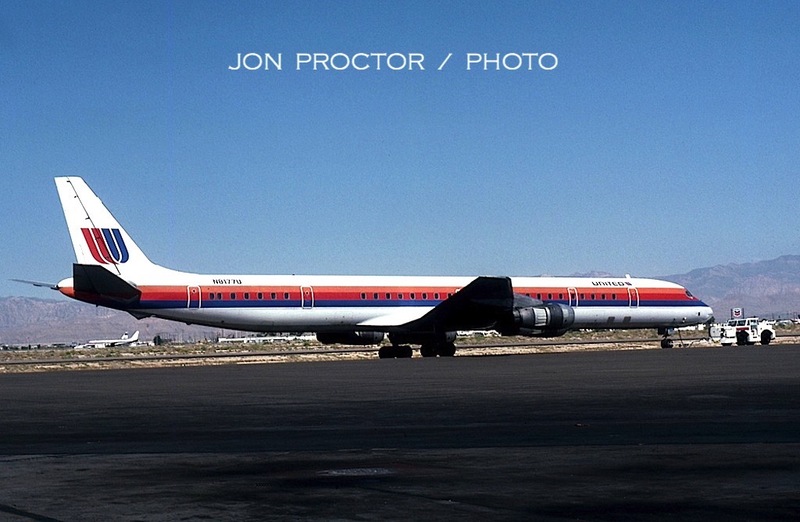 United DC-8-61 N8177U shows off its “tulip” logo scheme, also photographed in June 1980. The fuselage titles were later enlarged. First delivered to Eastern as N8768 and leased to JAL for two years as JA8057, United picked it up in 1977. It was converted to -71 standards with CFM engines six years later and sold to Emery Worldwide in 1998 for use as a freighter. 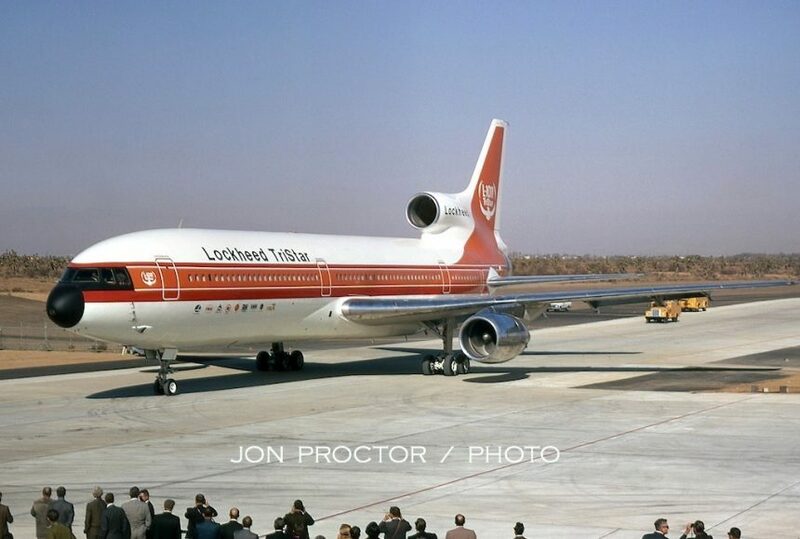 A month later, TWA L-1011 N11005 pulls into its assigned gate wearing twin-stripe colors. 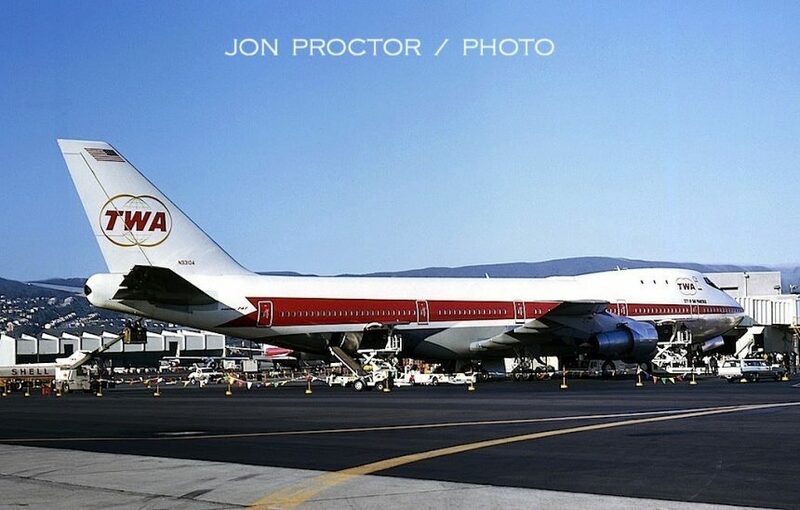 In October 1980 I worked a trip with a mid-morning departure from Las Vegas, giving me a chance to show up at the airport a little early, stand on the TWA ramp under a wing or tail, and shoot pictures in perfect sun with airplanes coming and going between overnight parking, gates and taxi for takeoff; it was a regular parade. 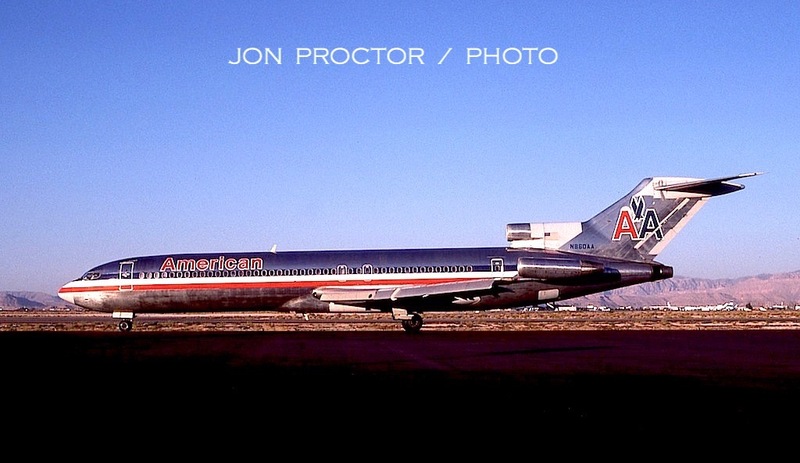 First off, American 727-223 N860AA poses in that nice low sun. Above: Continental 727-224 N69740 is seen under to to the gate. Below: N88711 taxis out for takeoff. 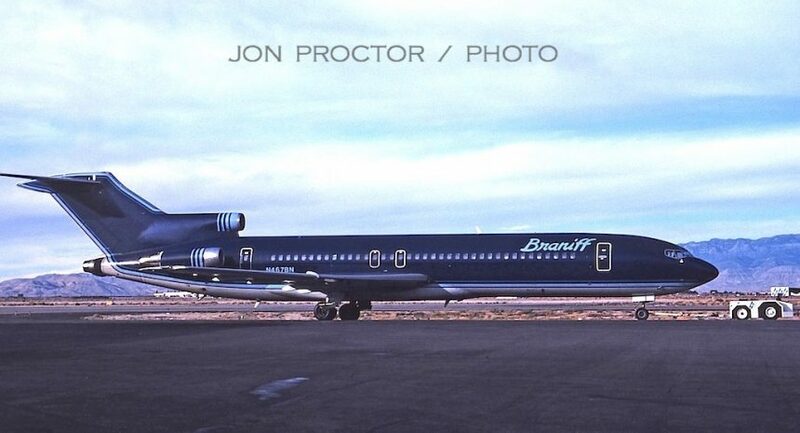 Braniff International had multiple morning flights, an ideal chance to catch many different liveries, all on 727-227s. 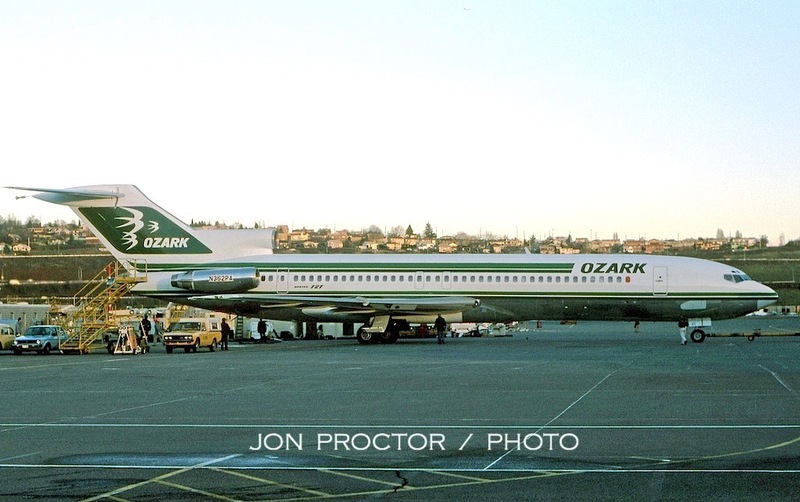 A pair of 727-227s still wore the older, two-tone colors. Above: N454BN in red/Aztec gold. Below: N447BN in orange/Aztec gold. Here come the elegant, Ultra colors, which seemed to change shades depending on the sun. N455BN appears in Chocolate Brown. One of my favorites, Mercury Blue, on N467BN. N478BN, also in Terra Cotta. Finally, N479BN decked out in Light Blue. Western 737-247 N4501W heads for the departure runway, probably one of many daily flights to Los Angeles. 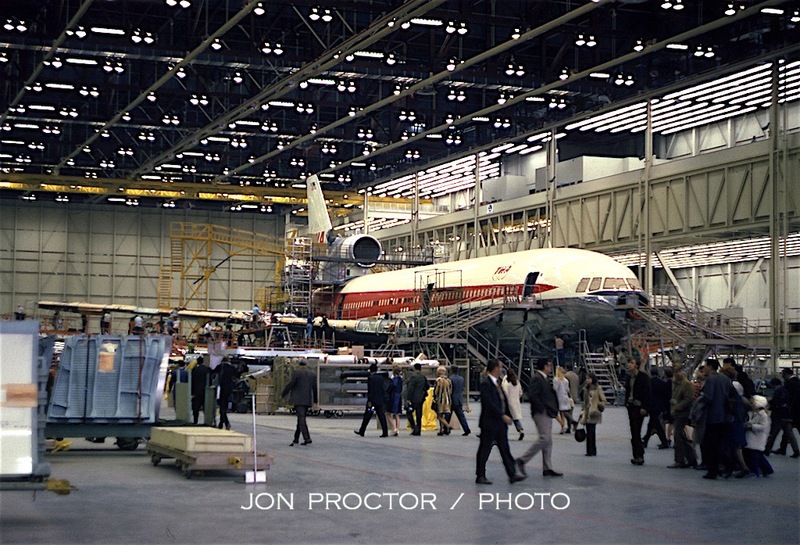 This particular Boeing twin, 33rd off the assembly line, was delivered in June 1968. 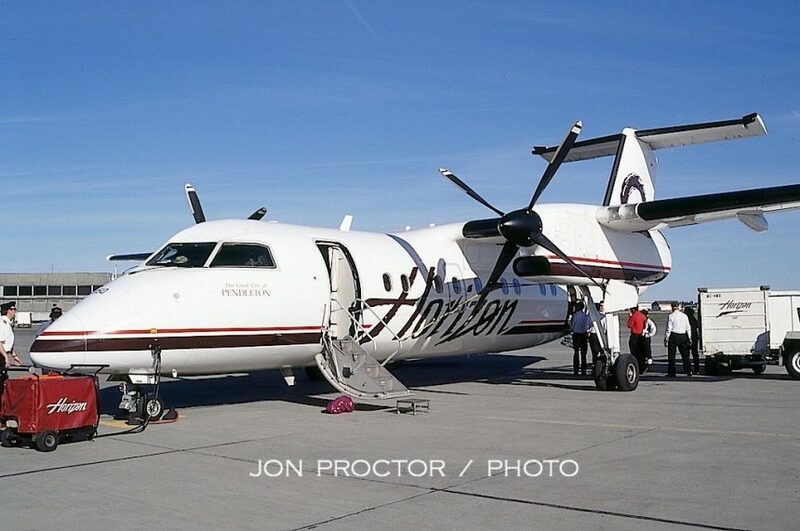 After nearly 13 years with one owner, it served several companies and was finally broken up at Tucson in 2004. 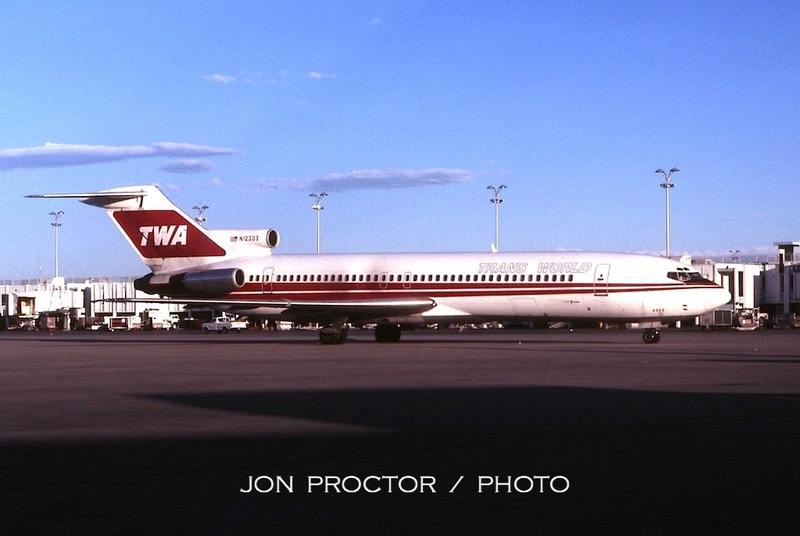 Pictured in December 1980, TWA 707-131B posed for me as it left the gate. 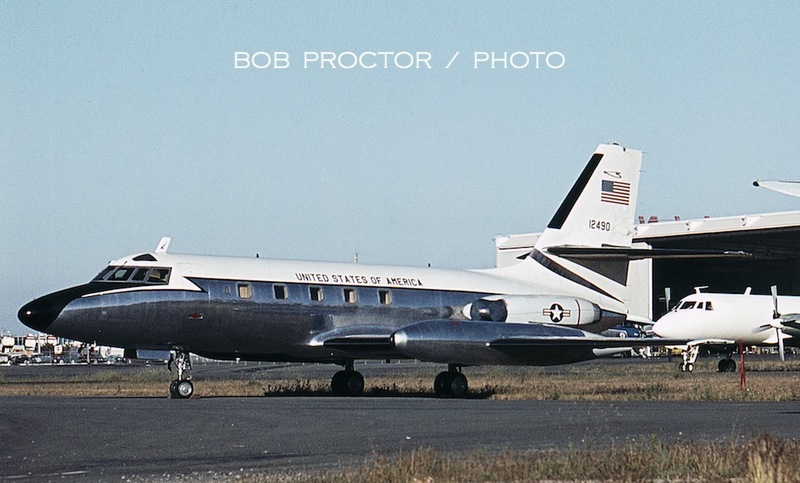 The airline’s -100 series turbofan Boeings lacked the HF radio “stack” antenna atop the tail as they were assigned domestic routes and not part of the Civil Reserve Air Fleet (CRAF) for call-up use by the military. N16738 was one of the last -131Bs acquired, in 1968. Looking over the wing of an L-1011 in November 1982, I caught most of old-timer 707-331B N773TW, again in the early morning sun. 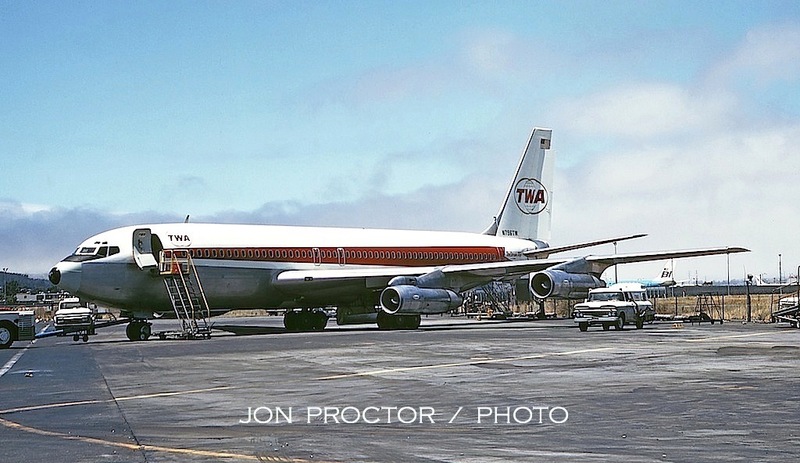 She joined TWA in March 1963. 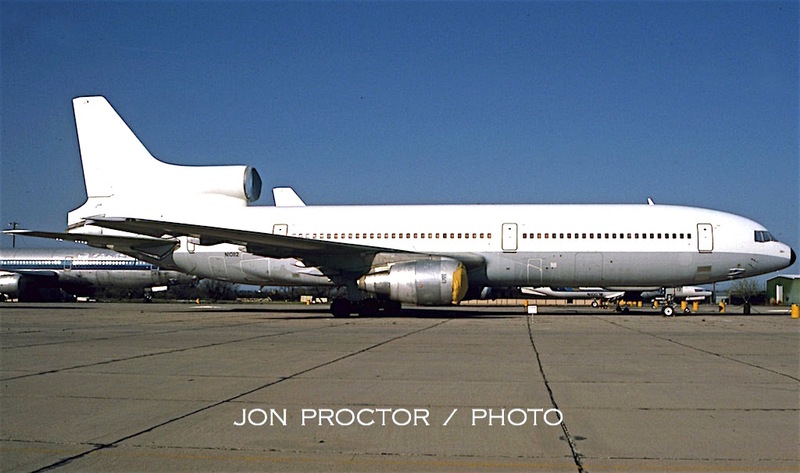 Like N16738 above, the Intercontinental Boeing was sold to the Boeing Military Aircraft Company, and scrapped after its engines and other parts were used to upgrade US Air Force KC-135E tankers. 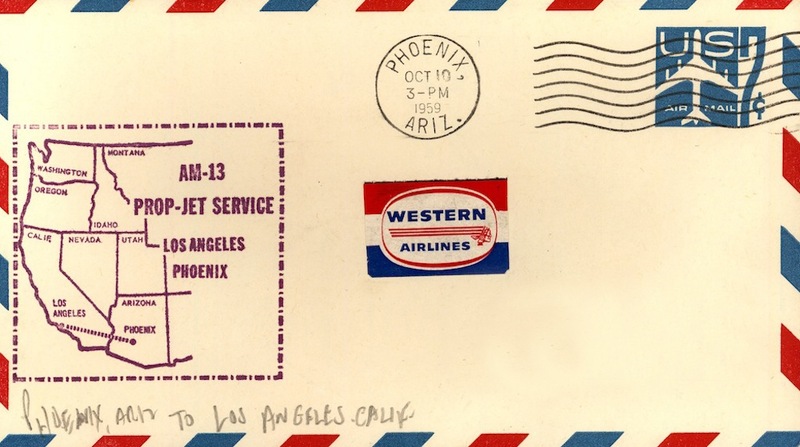 Arizona – We begin at Phoenix-Sky Harbor Airport. You may have seen this shot before on another page of my website, but I post it here as it’s my first picture taken at PHX. 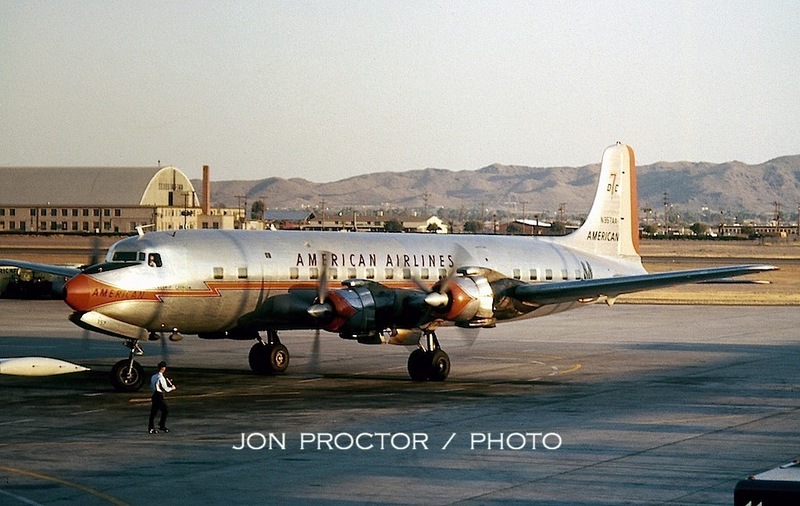 I was riding American DC-6 N90715 from San Diego to Chicago via Sky Harbor, on August 31, 1959. Brother Bob Proctor was living in Phoenix and caught some classic images at the airport in 1959. Apparently American 707-123 N7501A, Flagship Michigan was in town on a training flight or perhaps a diversion. Either way, its No. 2 engine receives attention, with the airplane parked away from the terminal. 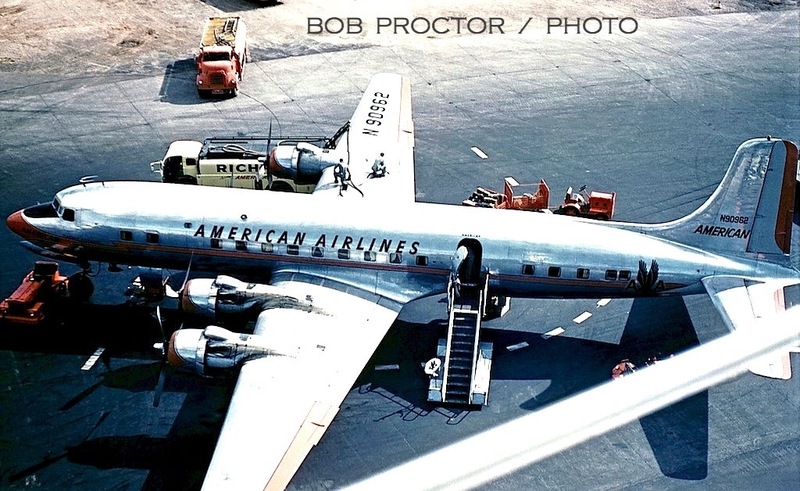 Passengers and visitors could get up close and personal with airliners in those days, including American DC-6B N90755, being readied for departure. A catering truck gets in the way a bit, but it’s still a nice shot, especially with a TWA 1049G ‘Super G’ Constellation approaching an adjacent gate. 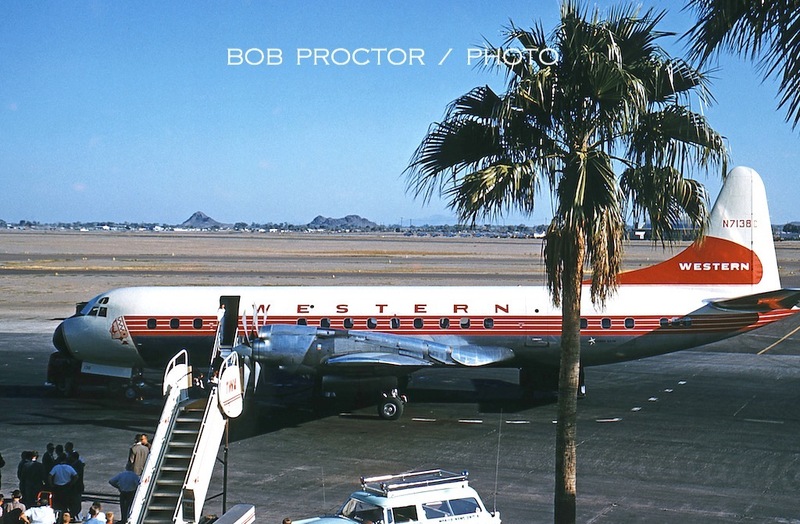 Bob was at the airport October 10 to witness Western’s inaugural Electra service at Phoenix. Passengers board N7138C in the late-day sun, bound for Los Angeles. 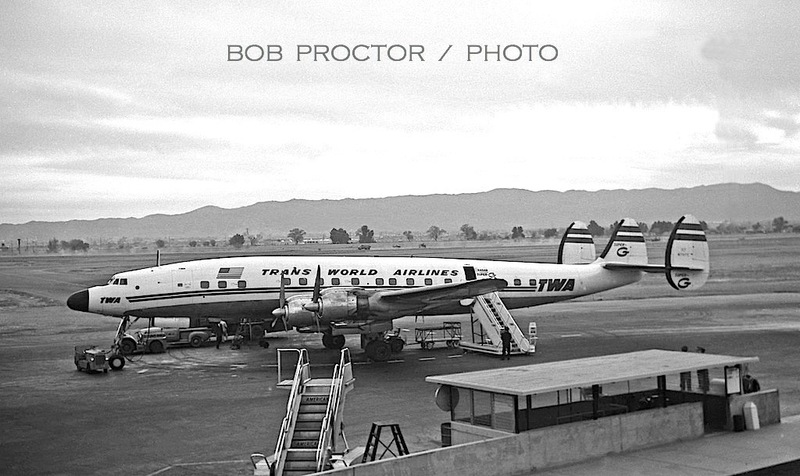 Western station personnel leave the area as a ground agent waves the Electra from the gate. Falling into line behind a Bonanza F-27A, N7138C heads for the departure runway. 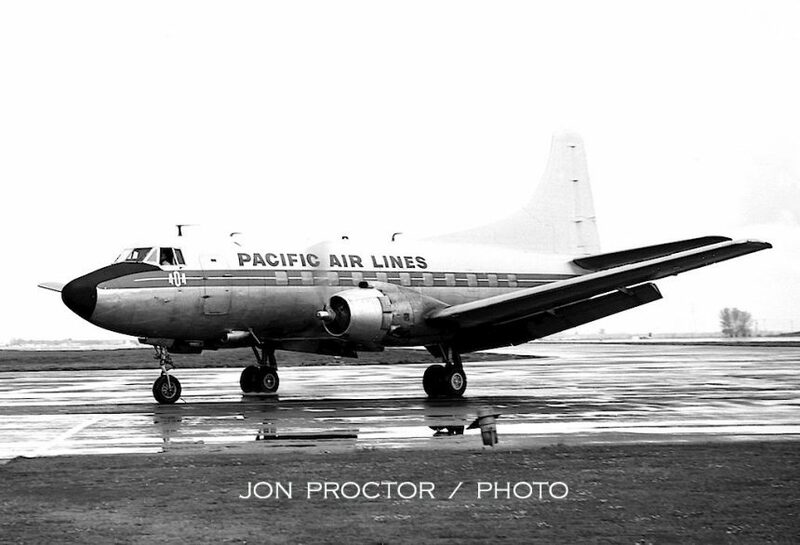 Always elegant-looking, TWA 104G Super G Constellation N7107C looks good, even in black & white on an overcast day. Parked and up for sale, two Bonanza DC-3s made redundant with the introduction of F-27A Silver Darts a year earlier. 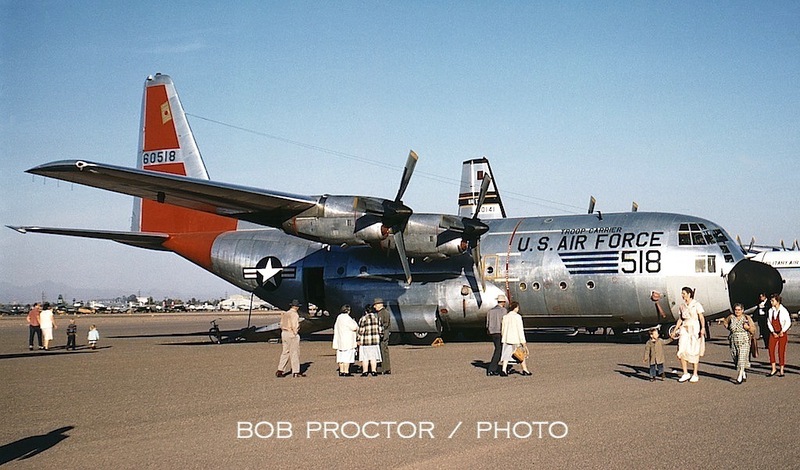 An open house event at Sky Harbor included featured military aircraft, such as this Lockheed C-130 Hercules. 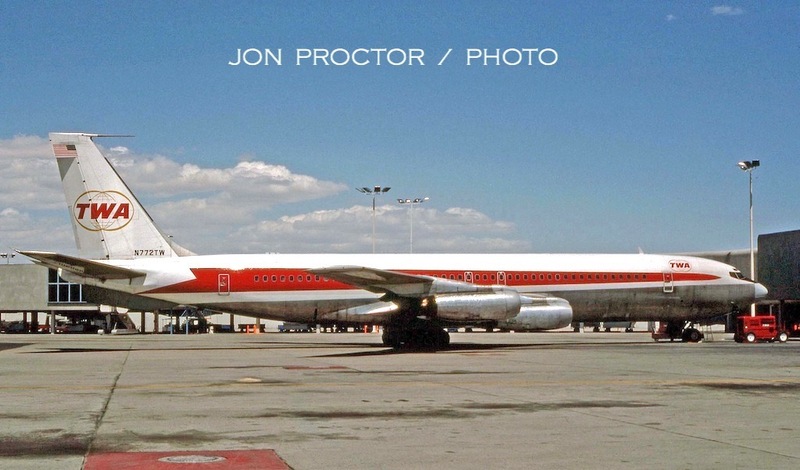 DC-8-11 N8038D, appearing in house colors, was fourth off the assembly line and part of the flight-test program. Upgraded to DC-8-12 and later -21 specifications, it became N8003U with United Air Lines. The airplane was donated to Project Orbis (https://www.orbis.org/) in 1980 and became N220RB. 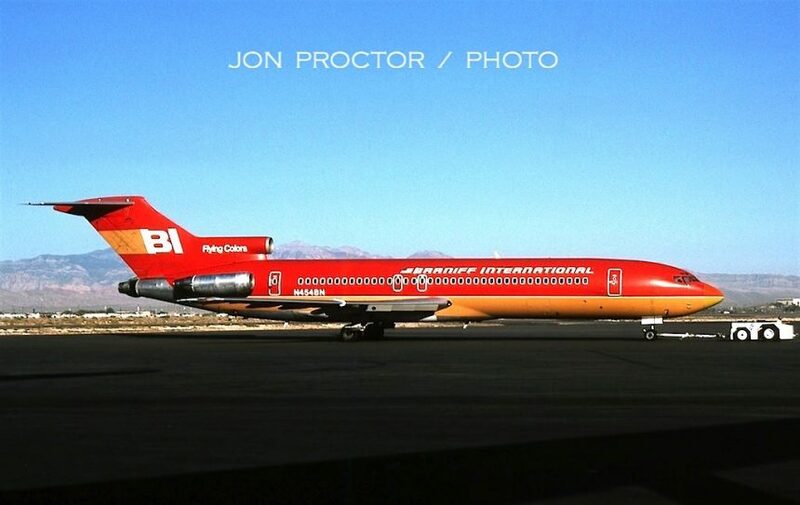 It was finally retired in 1994, replaced by a DC-10. The Phoenix observation deck offered great airplane spotting and photography. My first color shot from that vantage point remains my favorite. American DC-7B N357AA, Flagship Georgia, comes to a halt at its assigned gate in the late-day sun on December 29, 1960. Moments later I ran down to catch Flight 63 to San Diego, on 720-023 N7536A; its wingtip is barely visible to the left. My logbook says it set a speed record for that segment: 38 minutes! Back to five images from brother Bob. 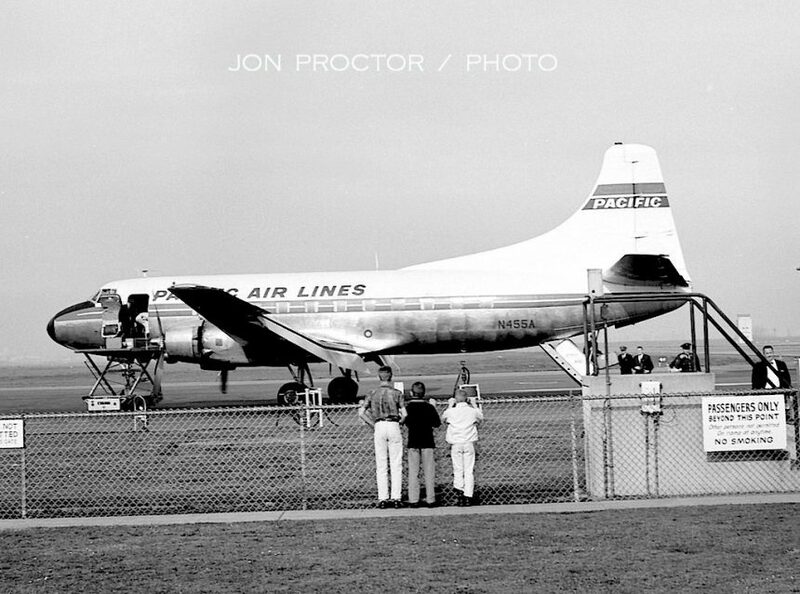 American DC-7B N381AA pulls into the gate, with a Royal Coachman logo behind the passenger door. 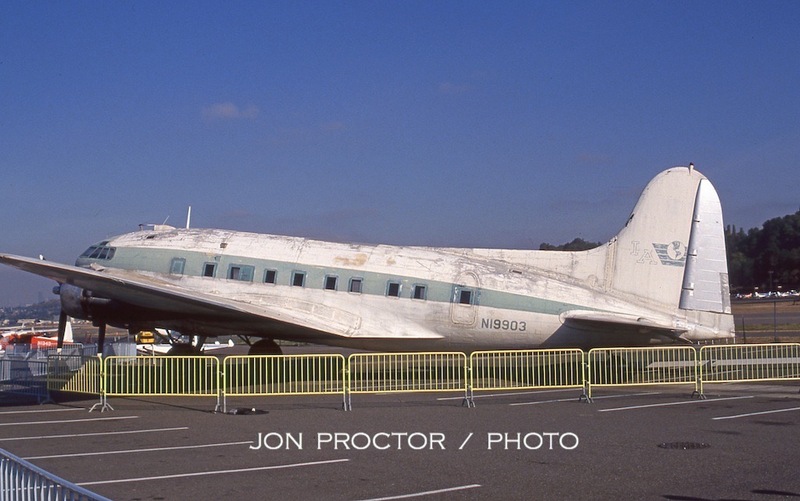 This airplane survives today, now residing at Municipal Airport in New Smyrna Beach, Florida, where it will hopefully open as the DC-7 Grille restaurant; click here for details. Bob wangled a visit to the control tower in June 1960, to capture these unique images, unfortunately taken in high sun, but still interesting. 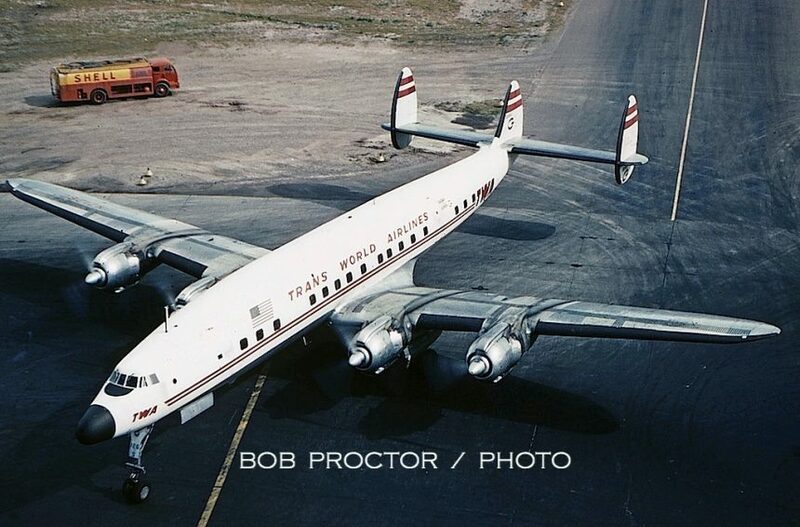 1049G Constellation N7126C, originally Star of Inverness, flew less than 10 years with TWA, its only operator, before scrapping. On the other hand, N90826 saw duty for more than 14 years. Star of the China Sea and the last original 049 built, it was delivered in May 1947 and flown until the end of 1961. 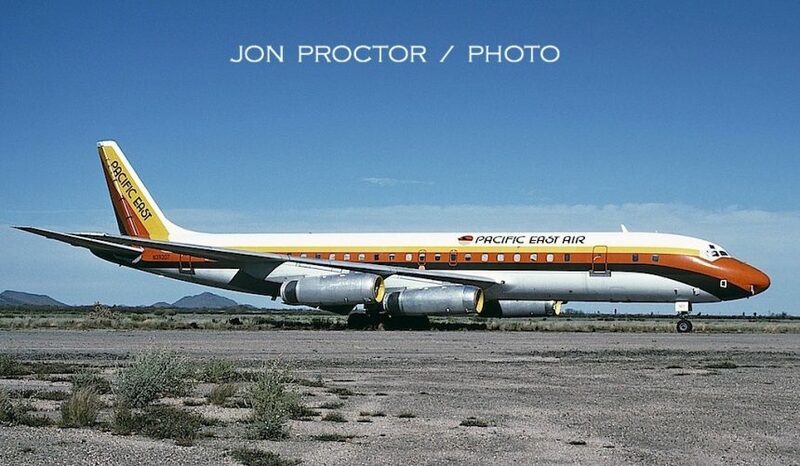 By then, jets were taking over the lion’s share of the airline’s principal routes. 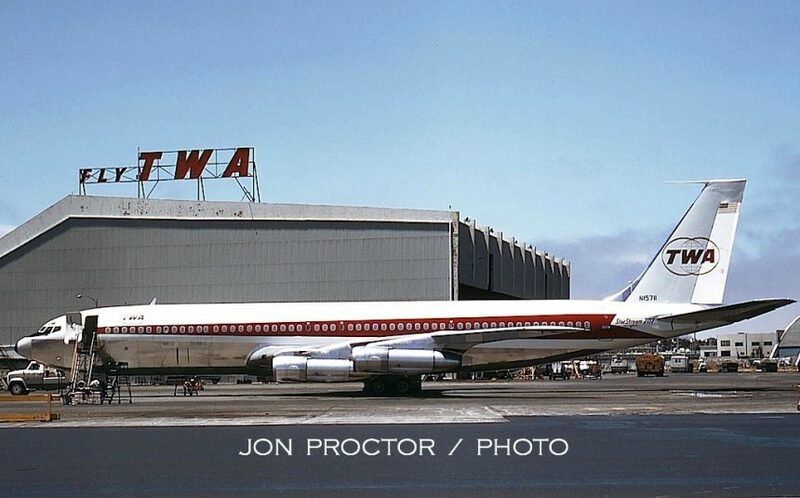 Unlike the later-model 749 Constellations, TWA retired the 049 fleet rather than install weather radar that became mandatory on January 1, 1962. 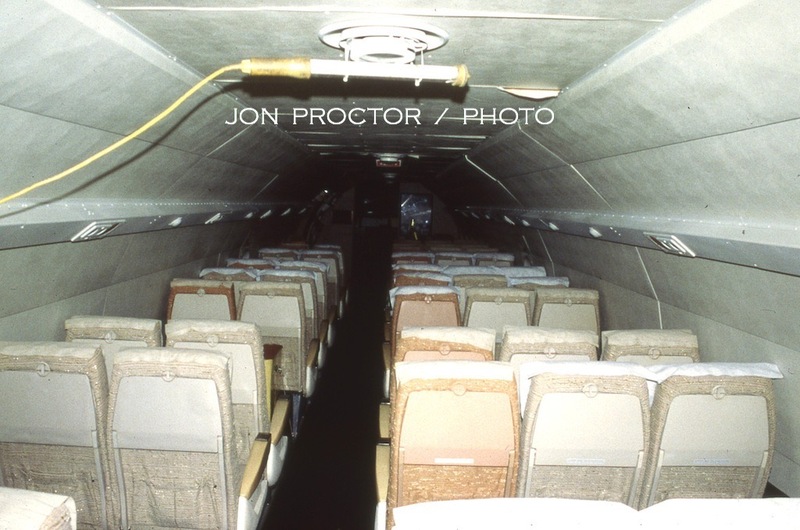 The type’s fuselage shape required a step down in the cabin at the prop line, evidenced in this picture by the window arrangement. 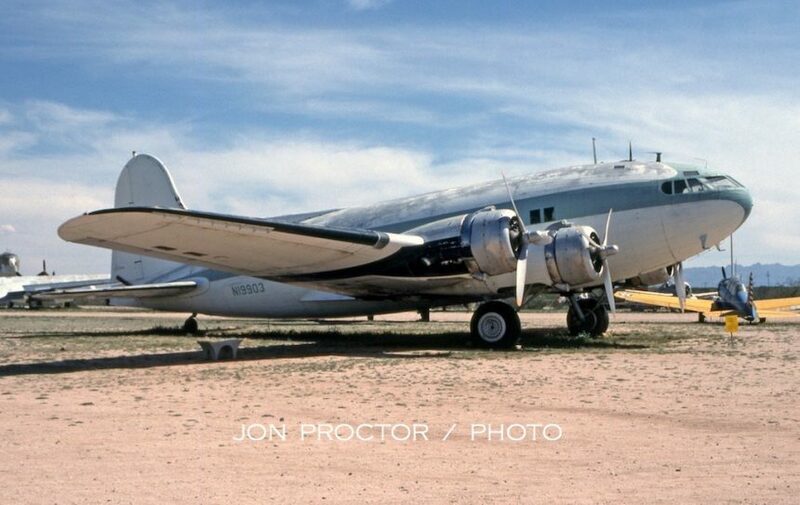 N90962, Flagship Tucson, was first operated by Continental Airlines, then leased by American in 1958. 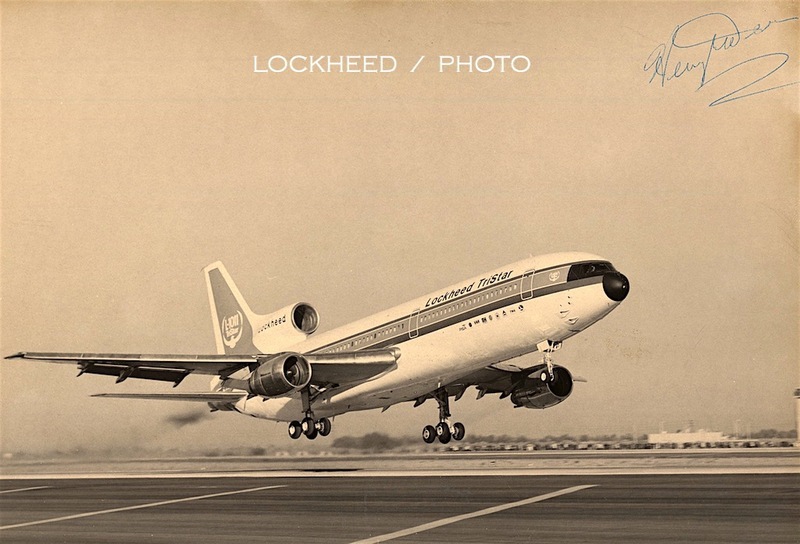 Purchased a year after this picture was taken, it quickly changed hands again, becoming 9K-ABA with Trans Arabia Airways (later to become Kuwait Airlines) in October 1961. 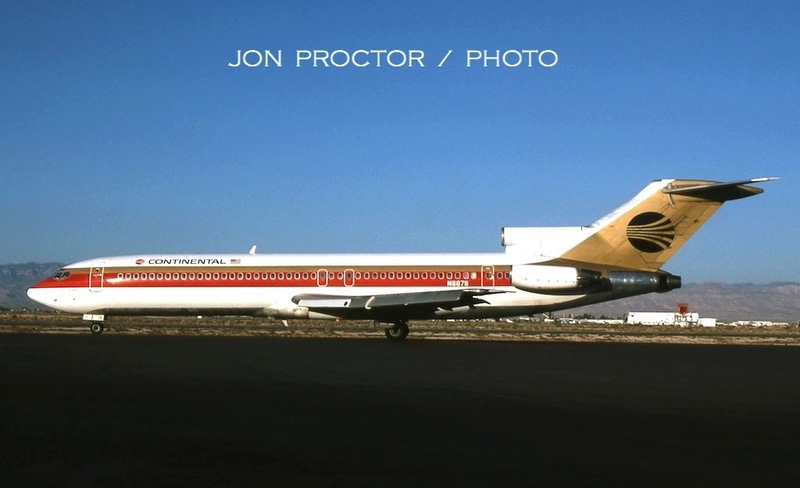 Alia Royal Jordanian flew it as JY-ADH from 1968. It was retired in 1972, and broken up at Amman. 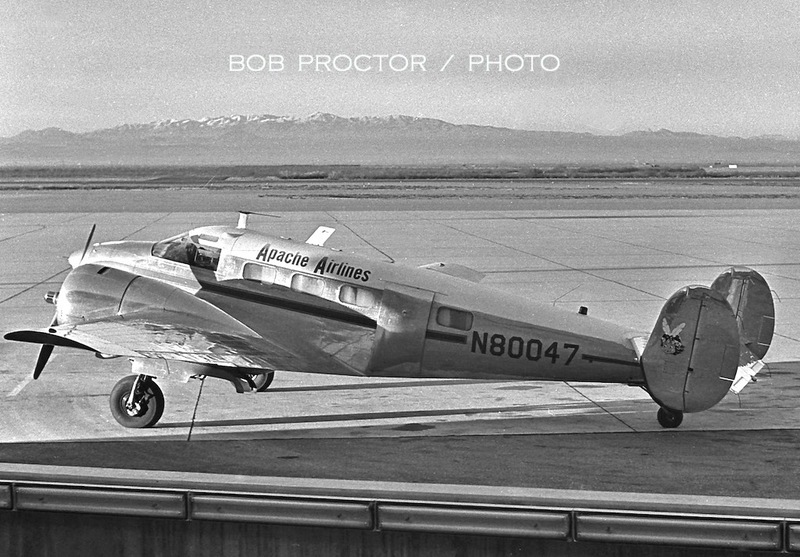 American did not regularly fly Lockheed 188 Electras out West, but a few made appearances as equipment substitutions on their way to and from Burbank for LEAP (Lockheed Electra Action Program) modifications to repair a fault that resulted in two fatal crashes. It appears that N6135A may have developed some kind of technical issue with its No. 4 engine, causing a delay at Sky Harbor. The then-new terminal expansion is under way in this December 28, 1961 shot of Frontier Convair 340 N73156, Sunliner Shoshone. 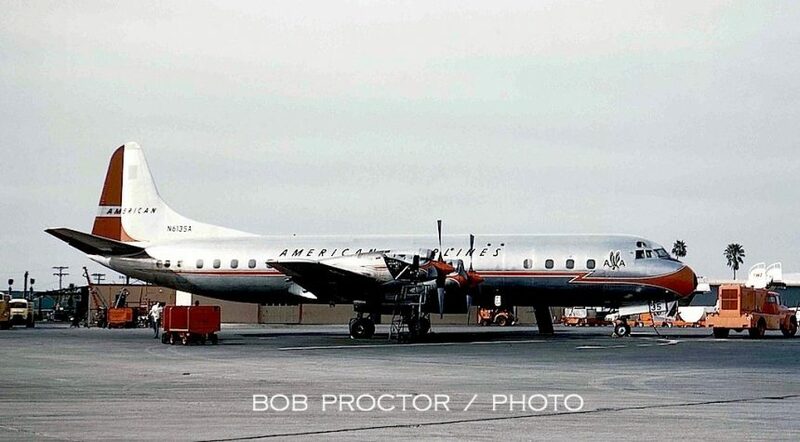 Originally built for Pioneer Airlines, it instead went to United in 1954, then Frontier five years later and was converted to Convair 580 turboprop standards in 1965. Another of Bob’s images; I wish he hadn’t used Agfa back then as it didn’t replicate colors very well, but I’ll forgive him for this one, of American Convair 990 Astrojet N5619, leaving the gate on October 3, 1962. It still hadn’t received upgrades to 990A standards that included an extension of the engine nacelles. You can compare the color quality difference that Kodachrome produced in this late-day observation deck image featuring American 720-023Bs N7529A and N7546A, which I snapped on May 1, 1963. Arizona Air National Guard KC-97s are visible in the background. 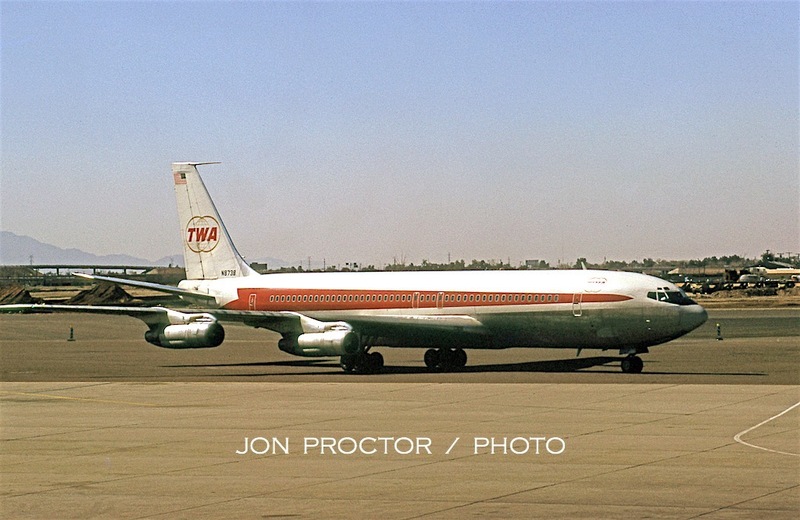 Passing through PHX on February 19, 1973, TWA 707-331B N8738 posed for me in the mid-day sun. 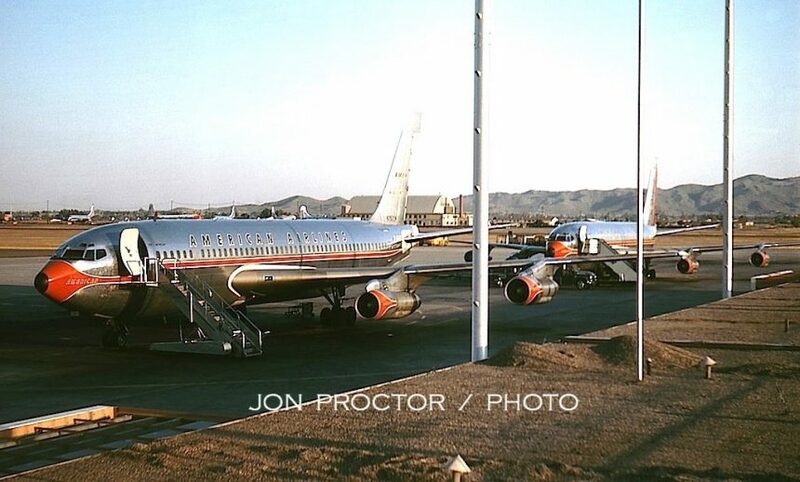 It wasn’t until June 1, 1984 that I caught a few more pictures at PHX. 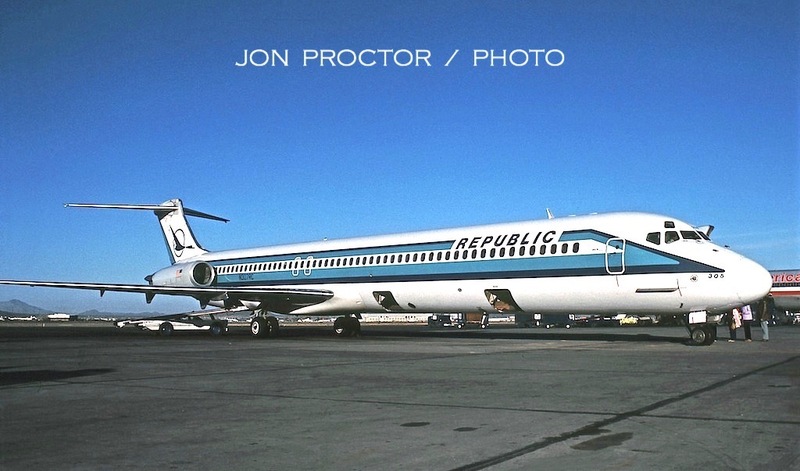 By then this Republic DC-9-31 was nearly 11 years old, having started life with North Central and then repainted after the 1979 merger. 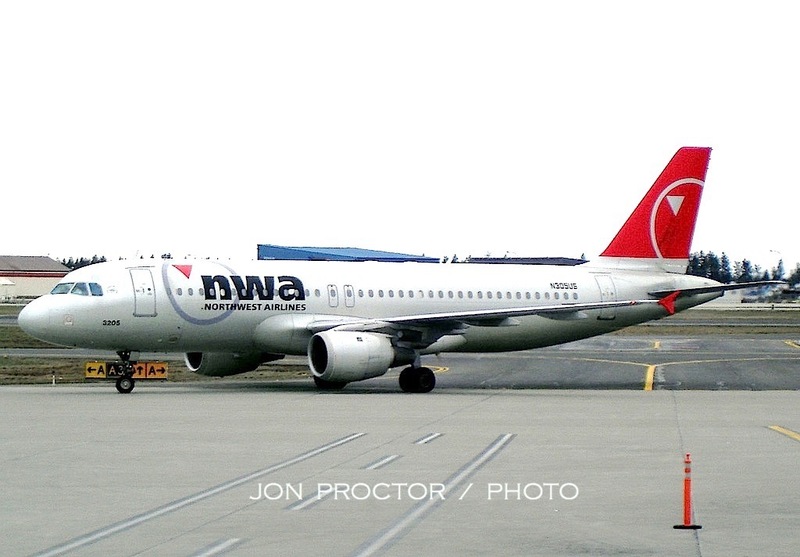 Upgraded to DC-9-32 standards, it went on to Northwest with that merger while keeping its original tail number, N940N. The venerable workhorse was finally retired, still wearing NWA colors, on July 10, 2008, three months before completion of the Northwest/Delta Merger, and ferried to Marana, Arizona. With 86,196 hours and 79,853 cycles on its airframe, the twin-jet was granted a well-earned retirement after 35 years. It was finally deregistered in 2013 and parted out. You may be able to win bar bets with this picture. Most people will tell you Southwest has never operated any aircraft type other than the Boeing 737; wrong! For 18 months beginning in January 1979, a single 727-200 was flown by the company. Then, starting in September 1983, the Boeing tri-jets began supporting rapid route expansion. Eventually six ex-Braniff 727-227s arrived on lease, wearing titles on the fuselage instead of the tail. 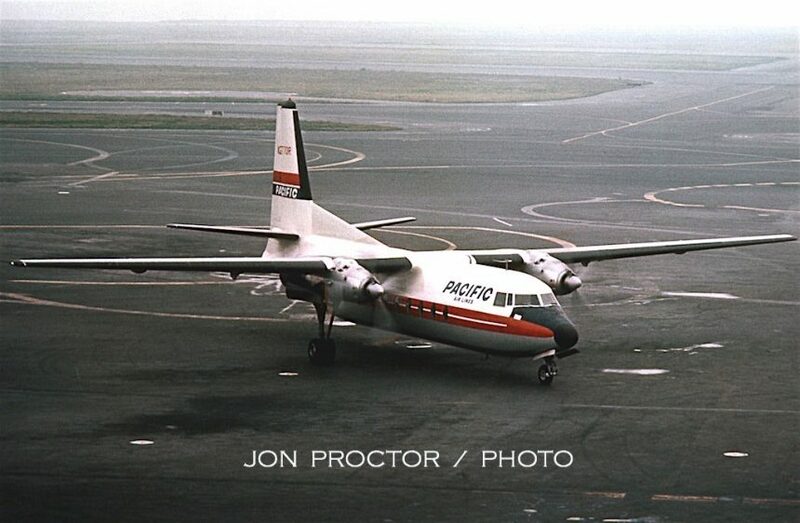 N563PE, photographed on June 1, 1984, reveals that the airplane went to PeoplExpress from Braniff. Sufficient Southwest 737 deliveries allowed the type’s withdrawal by the end of 1985. The more familiar 737-2H4, in this case N64SW, taxied by my camera February 6, 1985. 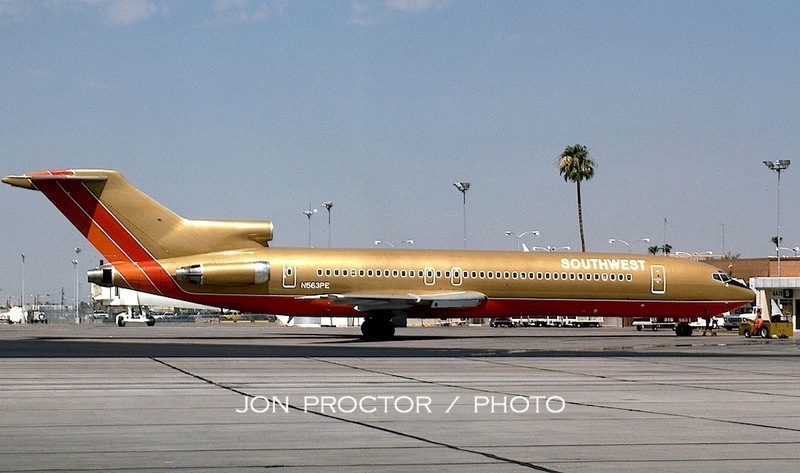 This trusty Boeing twin served 22 years with Southwest. On that same morning, newly delivered USAir 737-3B7 N357AU is about to depart as Flight 14 nonstop to Pittsburgh – quite a long leg for Fat Albert – and on to Washington National Airport. Now it’s on to Pinal Airpark at Marana, Arizona, just north of Tucson. Built as an Army airfield during World War II, it was used mainly for pilot training. The field later became a major airliner maintenance and repair center, also providing aircraft storage and demolition. For some time enthusiasts were granted almost unlimited access to MZJ, complete with guided tours and photo opportunities but the event of 9/11 lead to its nearly total isolation. 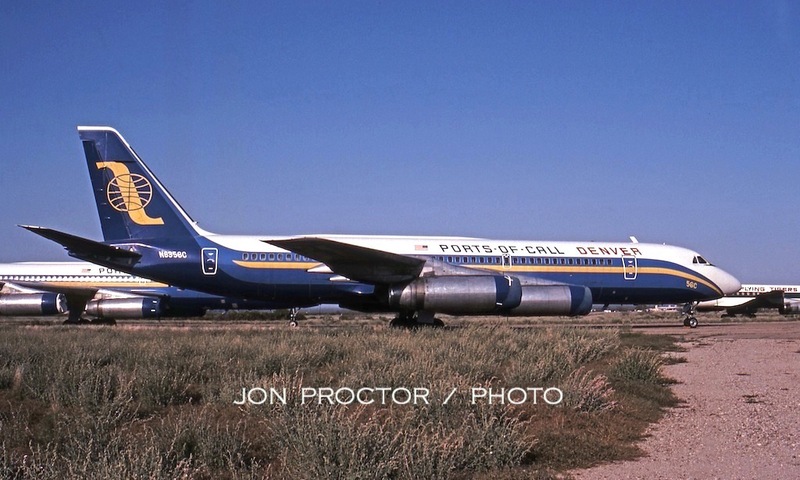 We begin on March 22, 1985, with this image of Denver Ports-of-Call Convair 990A N8356C. The travel club acquired seven 990s off the second-hand market, including two used solely as spares sources. The last three airplanes were retired in December 1984 and ferried to Marana. Two, including 56-Charlie, were broken up there in 1986. 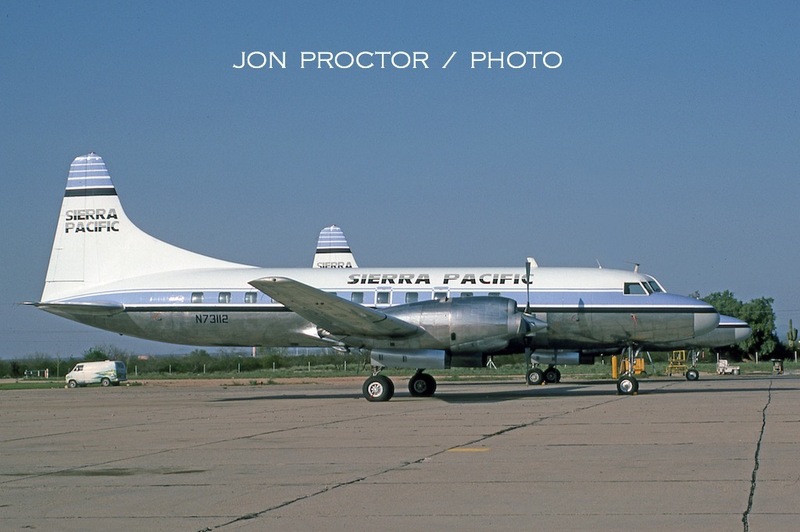 During its propliner days, Sierra Pacific operated five Convair 340s and a dozen -580s, including the pictured N73112 plus an unidentified sister ship. They appear in immaculate condition, perhaps on short-term storage or just parked while awaiting periodic maintenance. 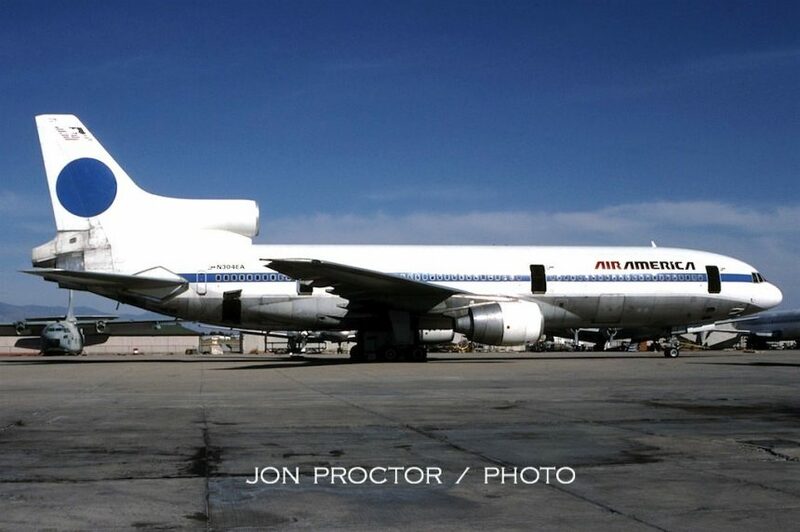 PSA L-1011 N10112 is most definitely in storage, devoid of its livery while awaiting settlement of a lawsuit after the airline returned its two TriStars to Lockheed. 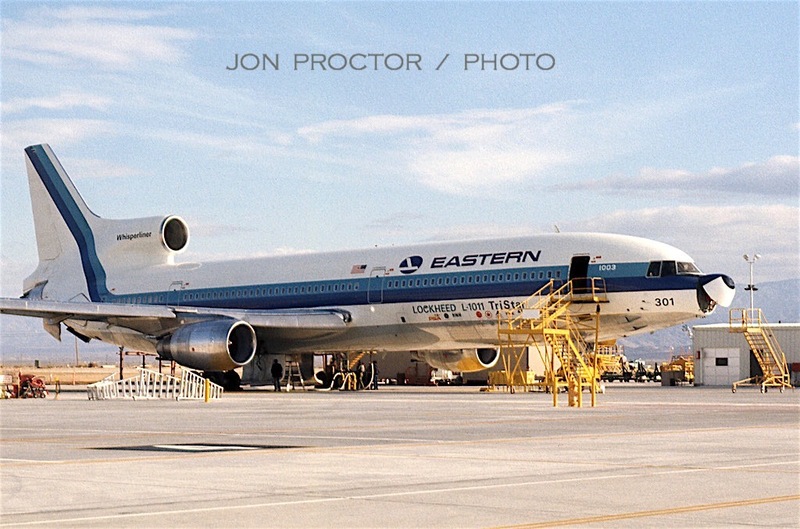 A second PSA L-1011, with titles, is visible behind Eastern L-1011 N306EA. Along with N371EA (formerly N307EA) in the background, the pair had been sold to Aviation Sales Co. a few months earlier, and stored. I got back to Marana on March 19, 1987 and caught four more pictures, beginning with Ecuatoriana 720-023B HC-AZP, named Galapagos. 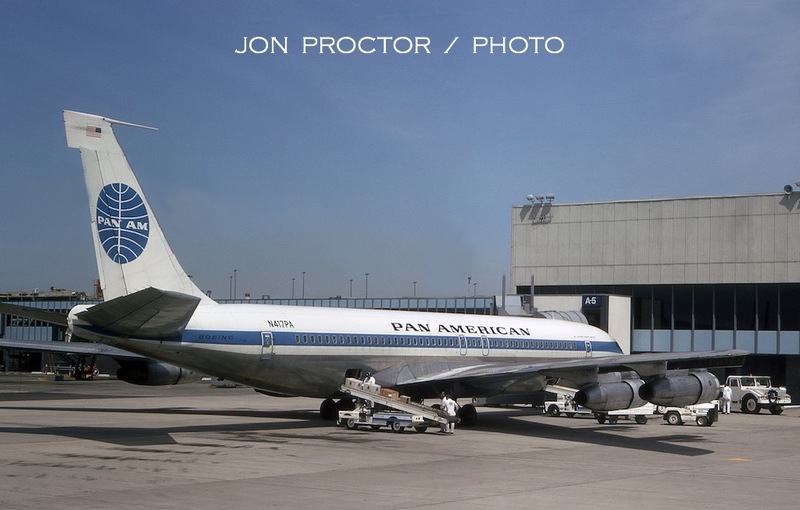 It began life with American Airlines as N7550A and served as N781PA with Pan Am before the Ecuadorian carrier bought it in 1975. The Boeing was cut up here in May 1988. One of Air New Zealand’s first jets was DC-8-52 NZ-NZC. Along with NZ-NZE in the background, it avoided the scrapper’s torch at Marana and went on to fly for several other carriers. 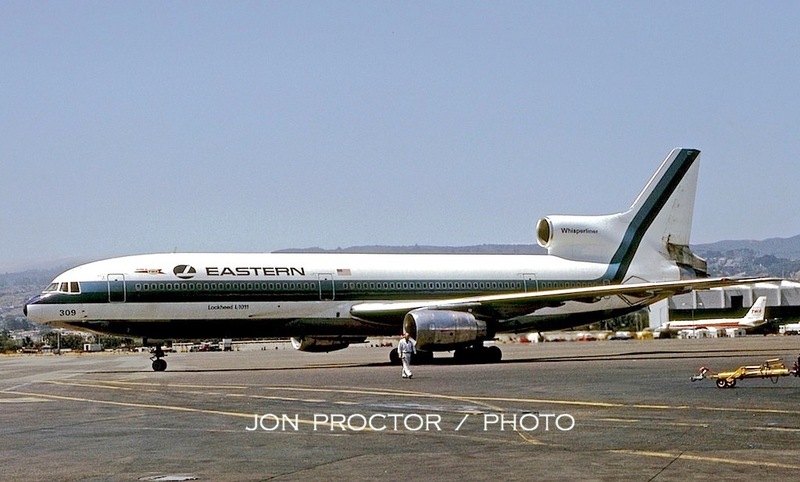 A “child of Deregulation,” Pacific East Air began flying DC-8s between Los Angeles and Honolulu in 1982, with $99 one-way fares. 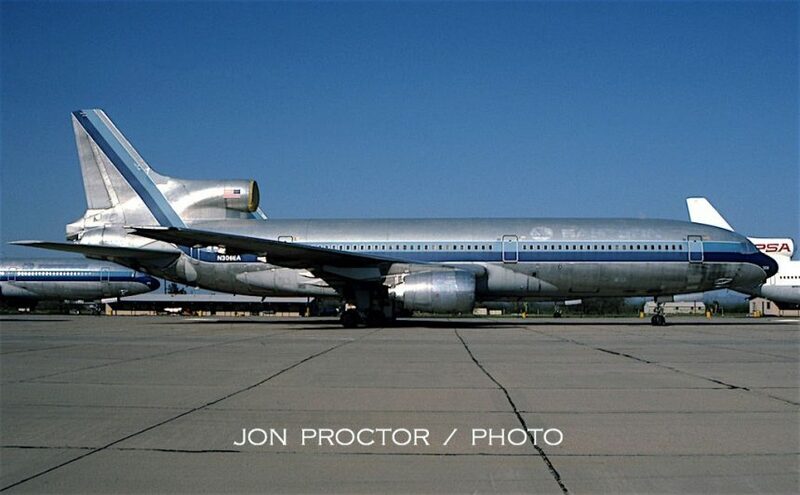 It even leased a DC-10 briefly, and expanded to other routes. Less than two years later the company was bankrupt and out of business. DC-8-62 N39307, an Alitalia original, was turned out to pasture in the Arizona desert, re-activated with MGM Grand Air in 1990 then converted to cargo for Trans Continental Airlines. 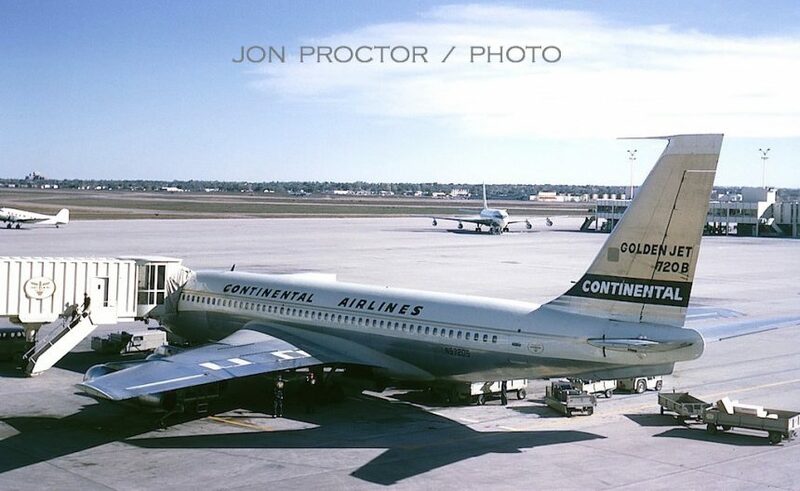 Its last operator, on lease, was Continental Cargo Airlines. Registered 9G-REM, the freighter crashed on landing at Kinshasa on October 16, 1999. American Airlines picked up two ex-TWA 747SP-31s about this time, for its newly awarded Dallas–Tokyo route authority. Following major refurbishment in Hong Kong, the pair received finishing work at Marana. N601AA is the former N57202. When MD-11s took over, it was sold to the Kazakhstan government and later operated on lease to several operators before storage at Luxembourg in 1999, where it was scrapped in 2002. 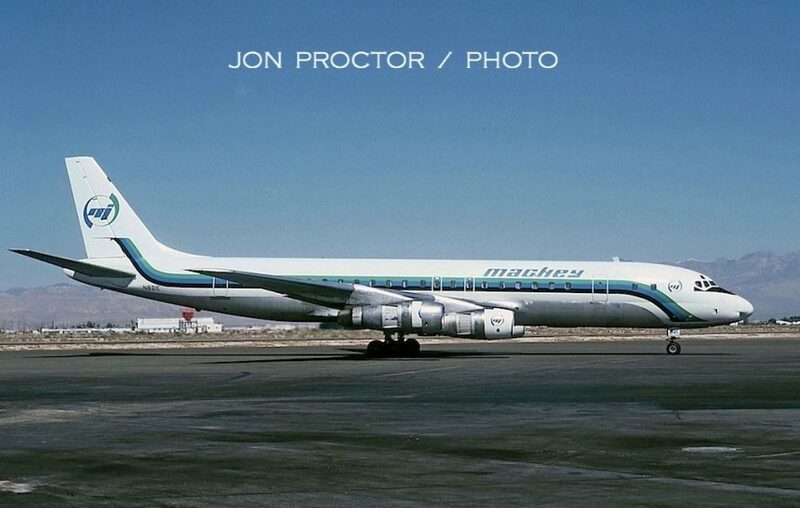 I got back to Marana for my final visit on March 23, 1990, and caught the prototype Douglas DC-8, which served many masters. N8008D was refurbished after the flight-test program and leased to National Airlines, then sold to TIA-Trans International. 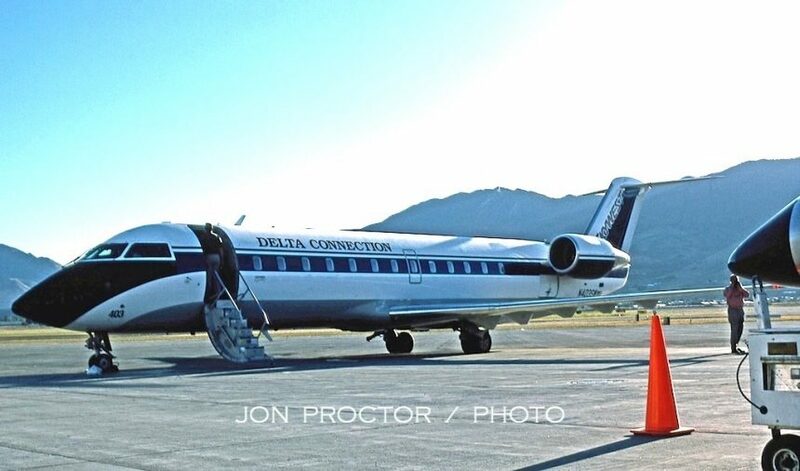 After leases to Canadian Pacific and Lufthansa, Delta rescued the airplane in 1967, then sold it 12 year later to FB Ayer, which in turn leased it to Aeromexico. 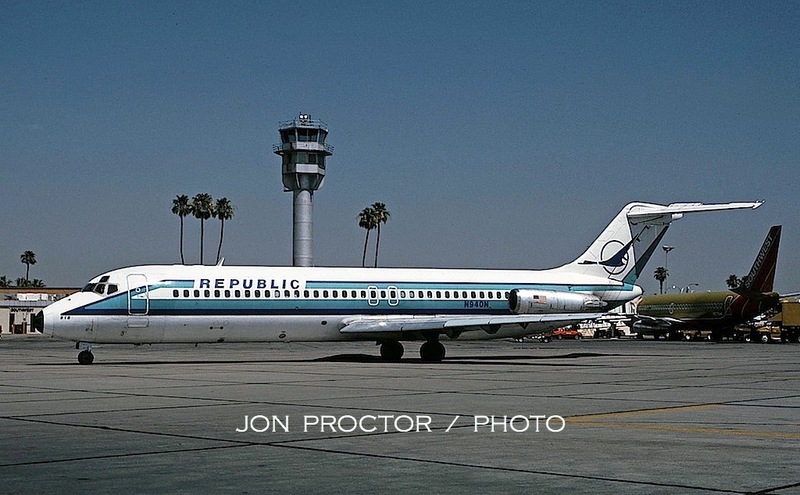 Named Quintana Roo, the jetliner was finally withdrawn in January 1982 and stored at Marana, with 60,918 hours on its airframe. 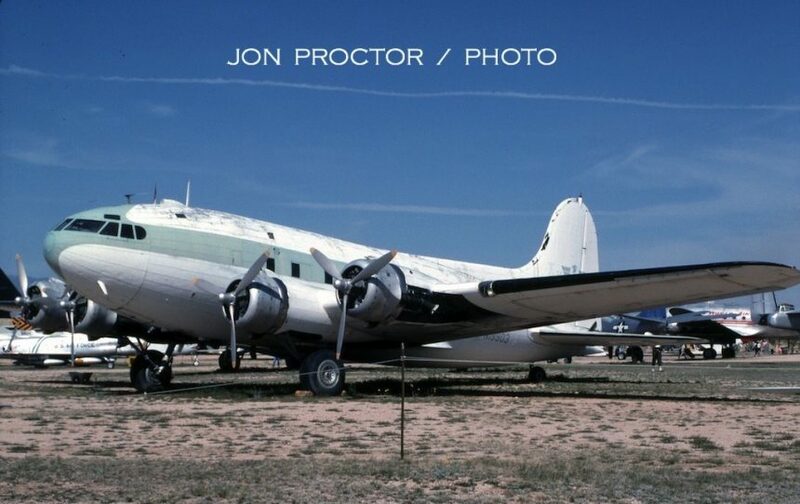 There was talk of preserving this historic airplane, but in the end it was cut up and never left this spot in Arizona. 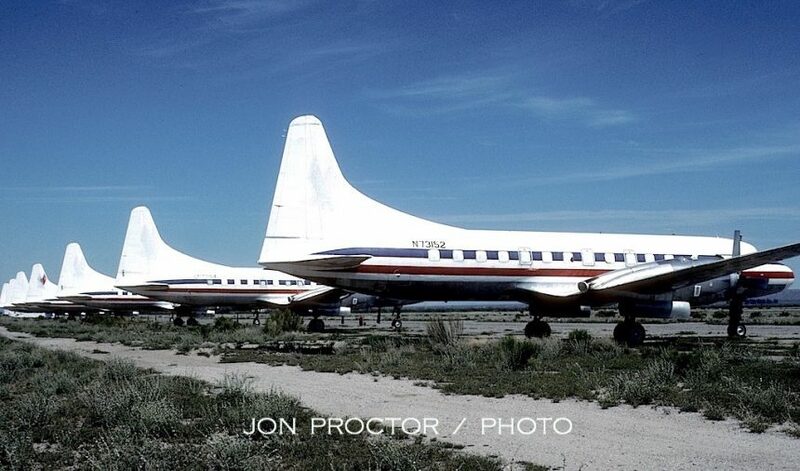 A gaggle of ex-American Eagle Convair 580s await their fate. 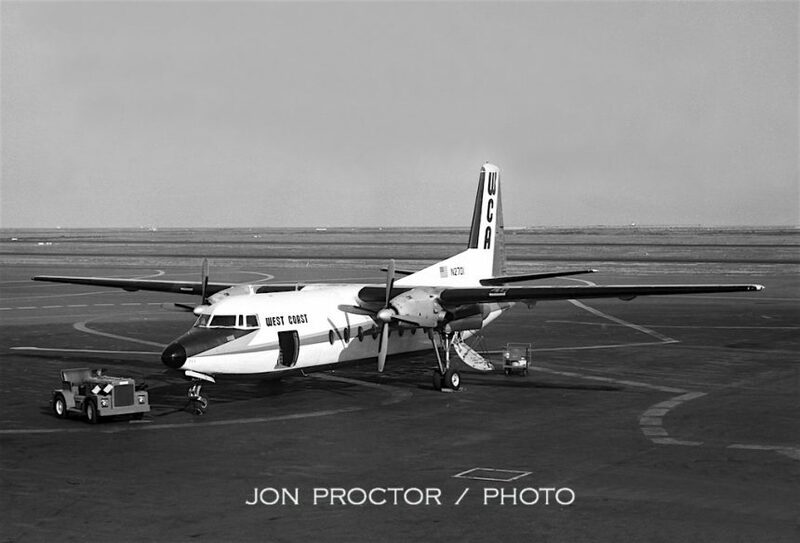 From the basic -340/-440 design, the type’s conversion to Allison turboprops extended its life almost indefinitely; several still fly today. N73152, in the foreground, escaped the desert a year later, bought by TAM Bolivia. Reassigned to the Bolivian Air Force in 1995, it crashed on takeoff at Trinidad, Bolivia on February 22, 2005. 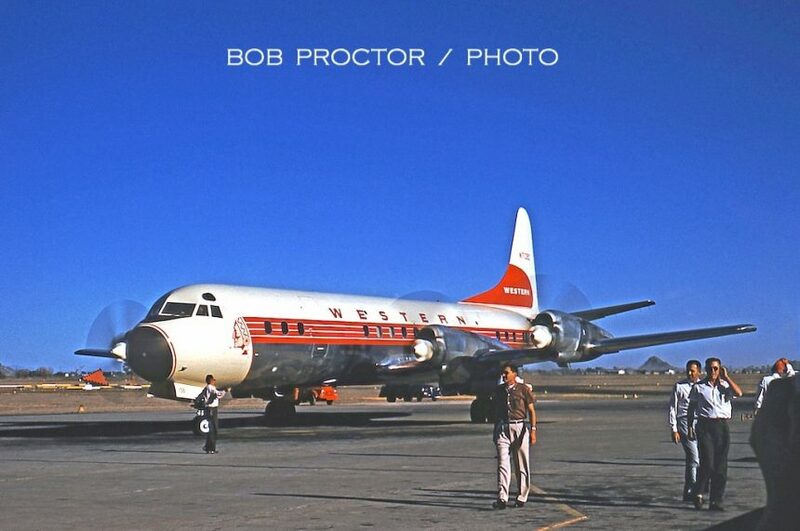 We jump ahead 14 years now, to 1965, when brother Bob did a little shooting at the airport. Fort Huachuca-based air-taxi operator Apache Airlines flew a mixed bag of small aircraft, linking Phoenix and Tucson to smaller destinations such as Bisbee-Douglas, Arizona. 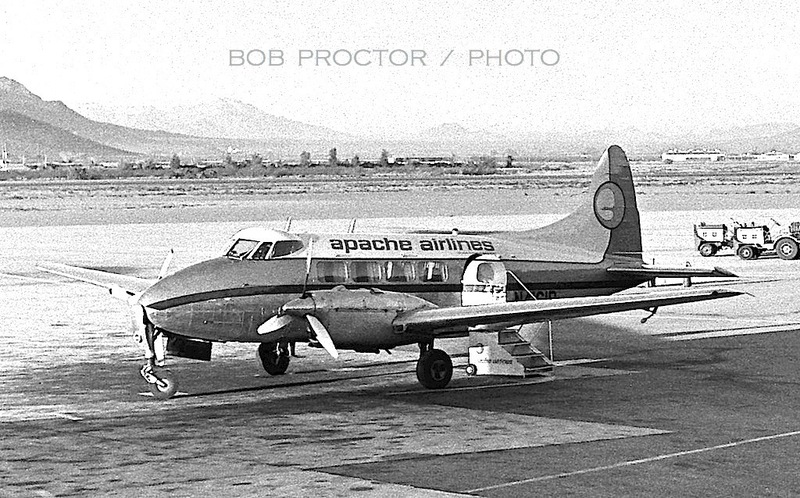 Even around this time it wasn’t easy to catch a ride on a Beech 18. N80047 rests between flights at the terminal. de Havilland Dove 104 N4161B sits at an adjacent gate, awaiting customers. 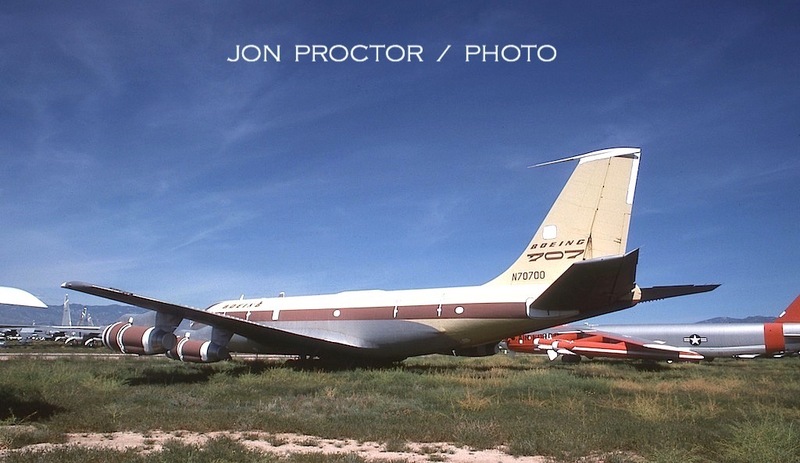 An outgrowth of the Dove, de Havilland DH.114 Herron 2B, N1420Z was substantially damaged during a ground collision with an other airplane at Tucson on April 20, 1966. 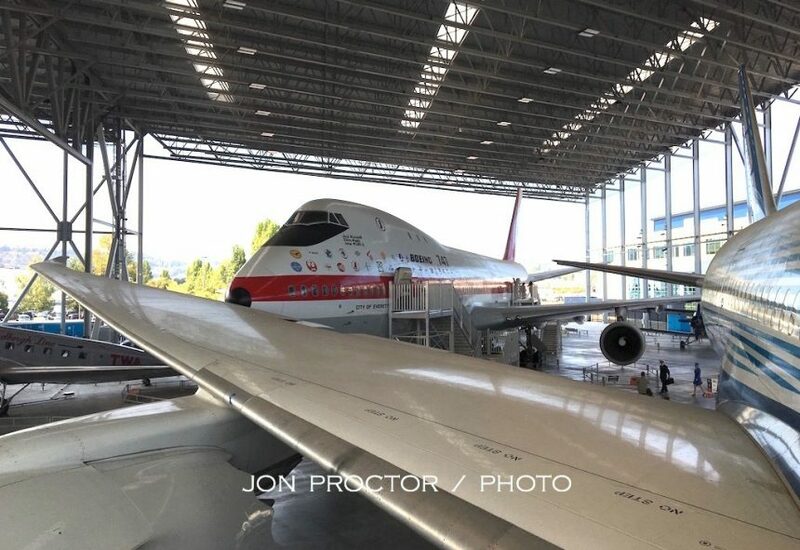 It was repaired and went to to serve with several carriers, including Aspen Airways and Swift Aire before being placed in storage at Scottsdale, Arizona, where it was scrapped. Bob photographed Herron N12333 in December 1966. It also went to Swift Aire, then Fischer Brothers as N25FB, flying under the Allegheny Commuter banner. 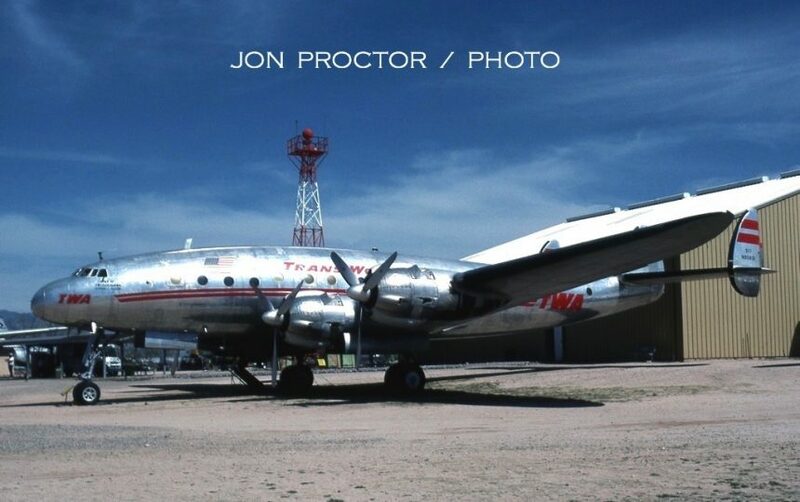 My first photo-op at Tucson occurred on October 26, 1969, and reflects in one of my favorite subjects. 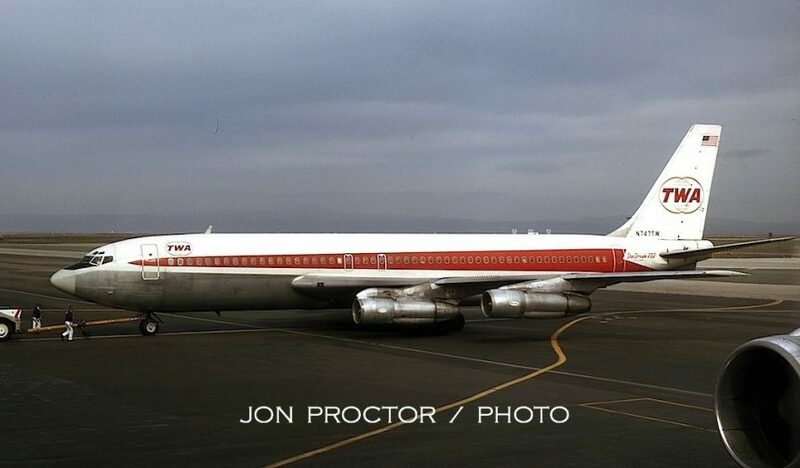 N871TW was actually the prototype Convair 880, later sold to TWA and converted to airline standards in-house. There’s a bit of confusion with its tail number, which was N801TW during the flight test program, but that number was later assigned to a regular TWA delivery airplane, hence the out-of-order registration. It looks to have just come out of a major overhaul, all buffed out with a fresh coat of paint. On the same day I caught Continental DC-9-15RC (“Rapid-Change”) DC-9 N8908 during a brief stopover, utilizing its own integral stairs, both forward and aft. 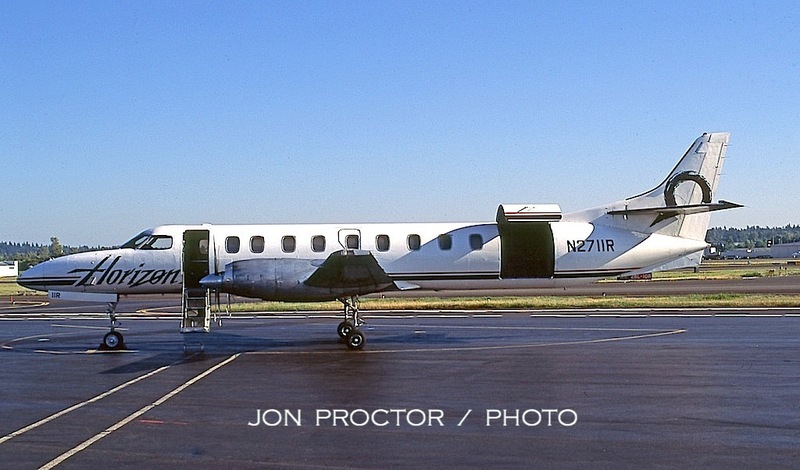 Following its sale to Air Canada, the twin-jet went to Air Florida and eventually to Ross Aviation as N166DE, where it was still flying for the US Department of Energy as late as 2011. Hamilton Aviation at TUS offered a variety of maintenance work. This immaculate Douglas C-54 was fresh out of their paint shop when I photographed it in April 1978. Registered C-GQIA, the airplane was originally delivered to the US Army Air Force in December 1944, then acquired and refurbished by Millardair in May 1976 for cargo work. The Toronto-based company was founded by Carl Millard, operating DC-3s as well. It has since gone out of business. 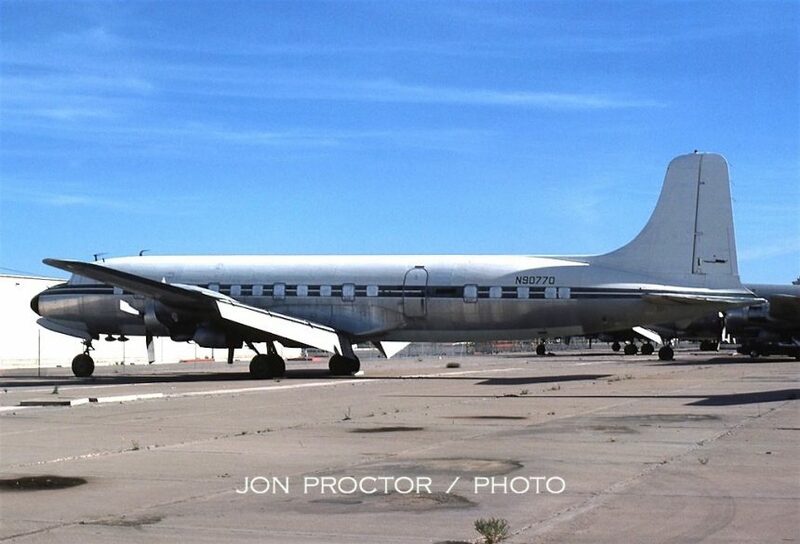 In the Hamilton storage area, DC-6B N90770 is still in the colors of Northeast Airlines, its last operator, having first flown for American Airlines as Flagship Arkansas. It also served with Saturn Airways. 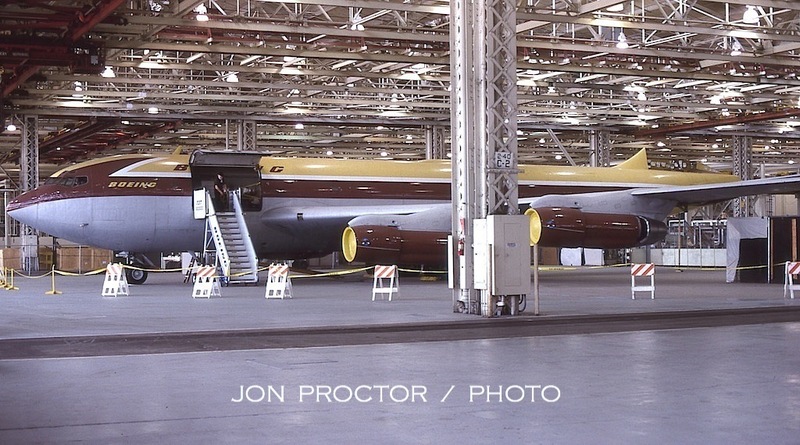 Seen here in storage, the propliner was scrapped on the spot a year or two later. Now to February 1984, where Jetways were still a year in the future and passengers boarded flights the old-fashioned way. Republic Airlines DC-9-81 N307RC awaits customers in the morning sun. 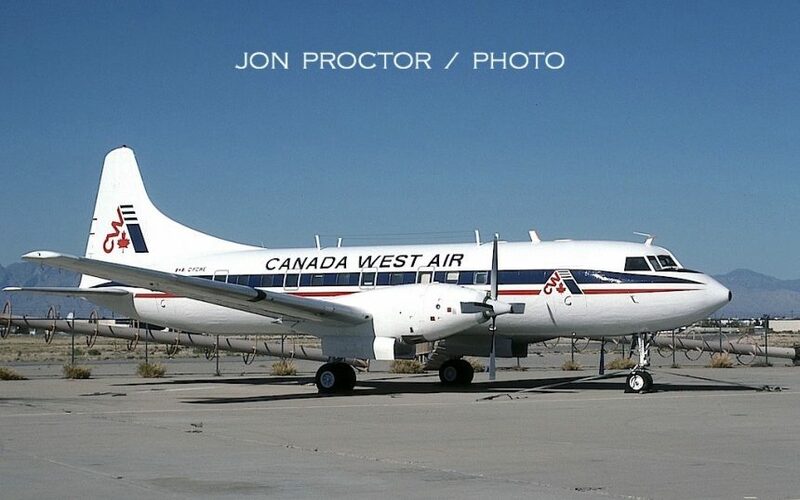 Back at Hamilton, freshly painted Canada West Air Convair 640 C-FCWE awaits a ferry crew to take her home on March 23, 1990, along with a sister ship. Perhaps that was in vain as records show that the Vancouver-based carrier ceased operation a few weeks later. First flown by Pacific Western as CF-PWT, this example stayed within Canada until sold to Camelot Consultants seven months after this picture was taken, reassigned N862FW. The airplane crashed on approach to Kafoutine, Senegal on February 9, 1992, while on lease to Gambcrest. On the same day I caught a pair of L-1011s just sitting. 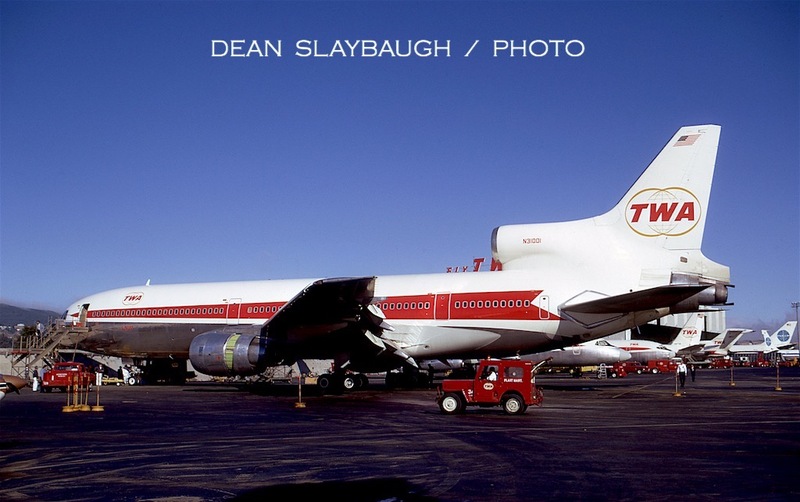 Total Air began flying contract charters in 1984, between the US mainland an Hawaii. Entering bankruptcy two years later, it emerged under the new name Air America. The company was sold in 1989 but went bankrupt yet again and ceased operations in January 1990; its operating certification was suspended right about the time I took these pictures. N303EA, an Eastern original, went on to fly for Air Atlantic Icelandic, then Rich International and Faucett before its demise at Miami in 1999. 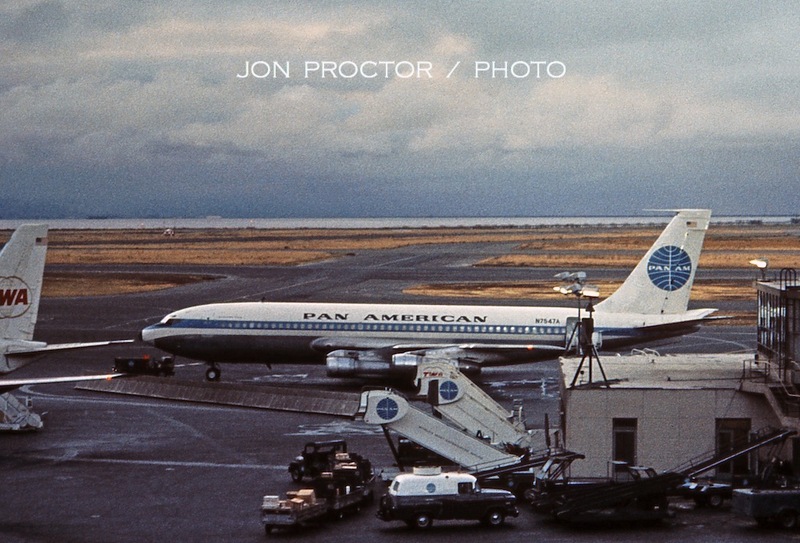 N304EA was painted up to look like Pan Am for a television film, Last Flight Out. Upon return from that assignment, titles were replaced and the tai logo painted over; it may or may not have flown again for Air America. 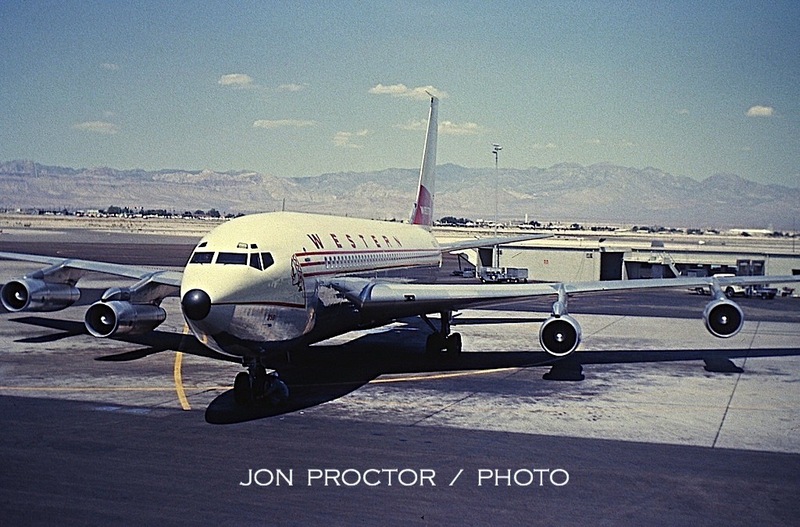 Above and below: I dodged rattlesnakes at nearby Davis-Monthan Air Force Base in April 1978, in order to photograph the prototype Boeing 707, designated 367-80. It was stored here after completing years of flight-test work, awaiting relocation to the Smithsonian Air & Space Museum, where it now resides in the Udvar-Hazy Annex at Dulles Airport, Washington, DC. Just a few pictures here, in March 1990. Above and below, a rare bird indeed. 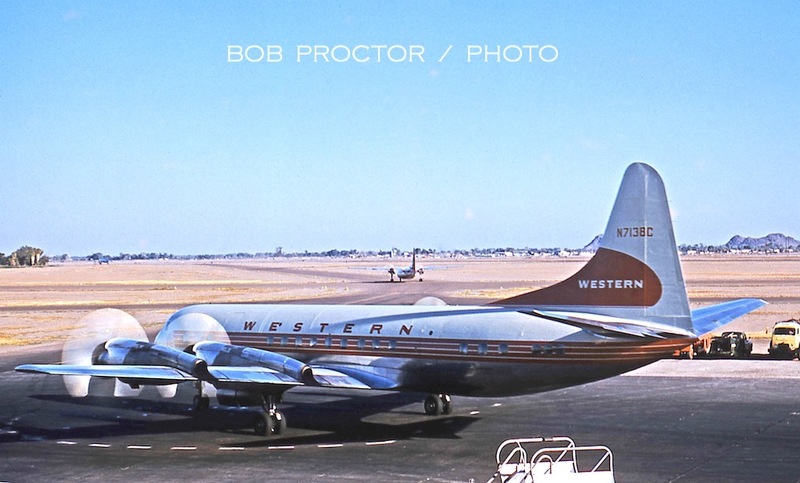 Boeing only produced 10 copies of the Model 307 Stratoliner, the first commercial airliner to incorporate cabin pressurization. 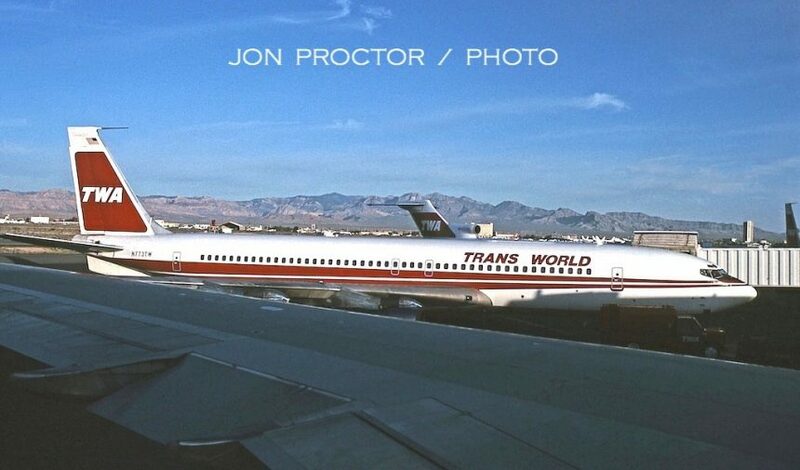 The prototype crashed during flight testing, Pan Am took three, TWA five and Howard Hughes one, for his own personal use. NC19903, the last built, became Clipper Flying Cloud with Pan Am. It was sold to a charter company in 1948 and after a checkered career away from the airline became the property of Aviation Specialties Co. in Arizona. 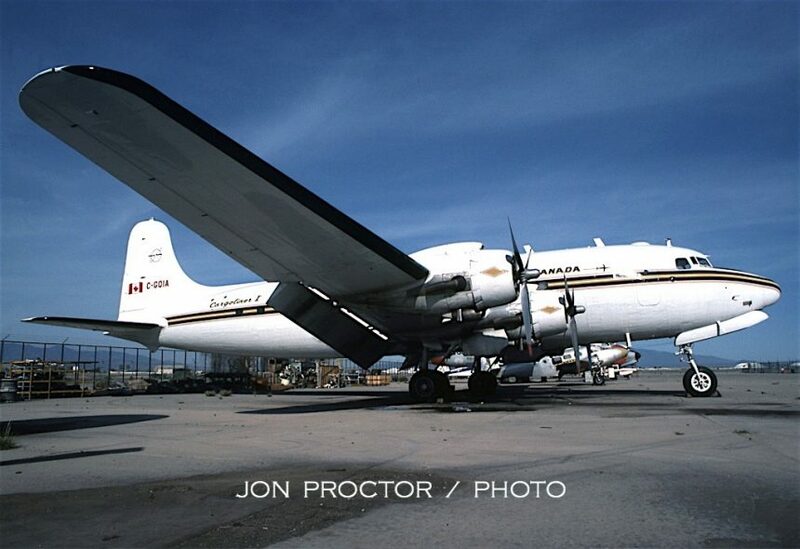 In September 1971 the Smithsonian Institution traded a Lockheed Constellation straight across for the airplane and placed it on loan here while awaiting restoration. We will see more of her shortly. 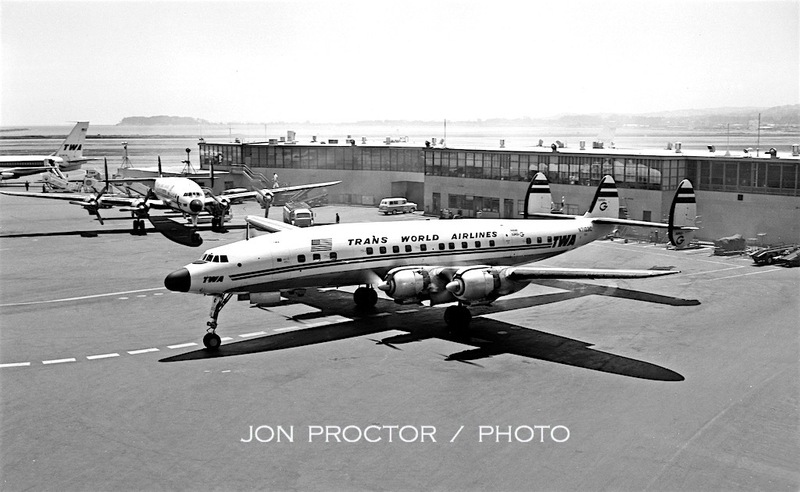 Another historic example is Lockheed 049 Constellation N90831, which entered service with TWA shortly after World War II, as Star of Switzerland, serving the airline until March 1961. 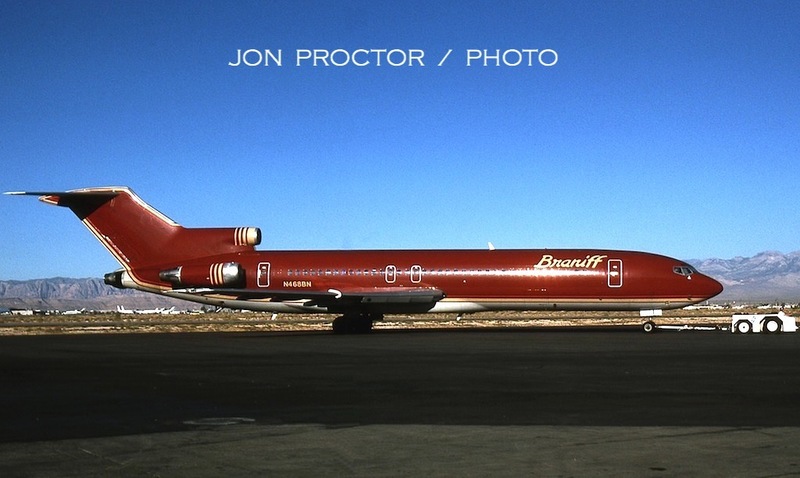 Like the Stratoliner, it took a circuitous route before acquisition by the museum. Dedicated TWA volunteers began restoring the Connie in 1977 and devoted more than 7,000 man hours to the project. Resplendent in full colors, it was dedicated in February 1980 and remains on display there today. 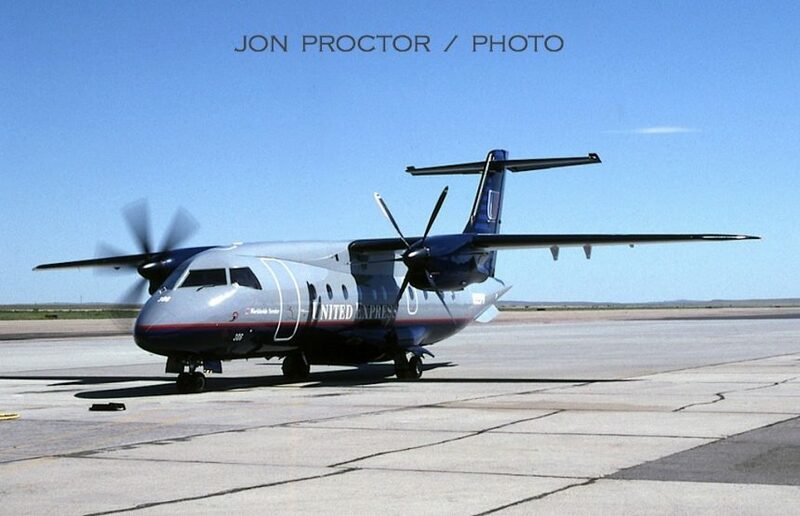 Albuquerque was another “Jetway-less” airport when I did my shooting there. 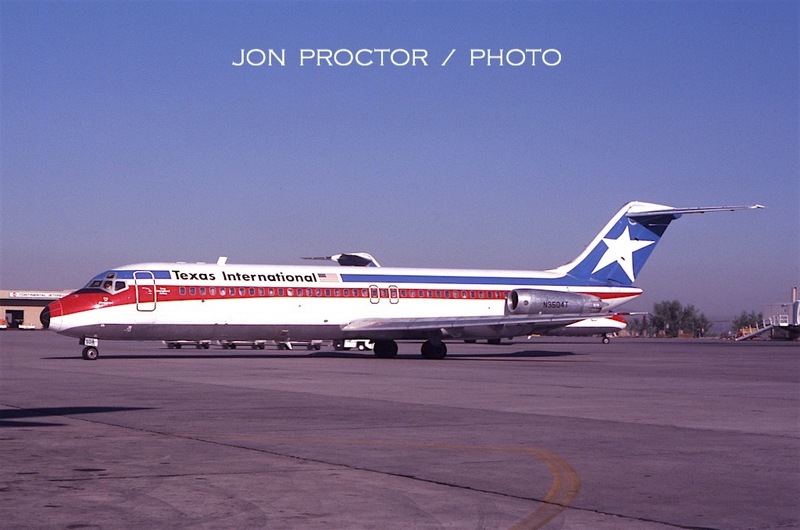 Passing through in January 1969, I photographed TWA Quick-change 727-180C N9515T departing from the gate. 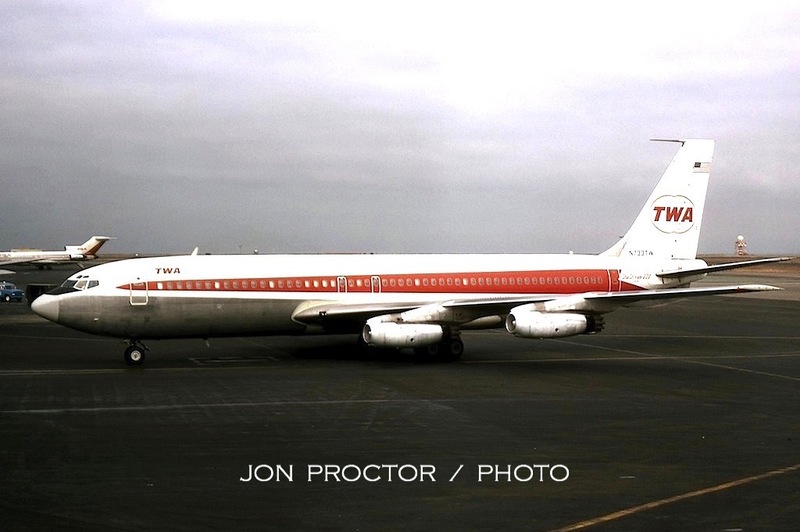 It was one of two “white tail” airplanes picked up new from Boeing, hence the departure from TWA’s standard “31” customer designation. 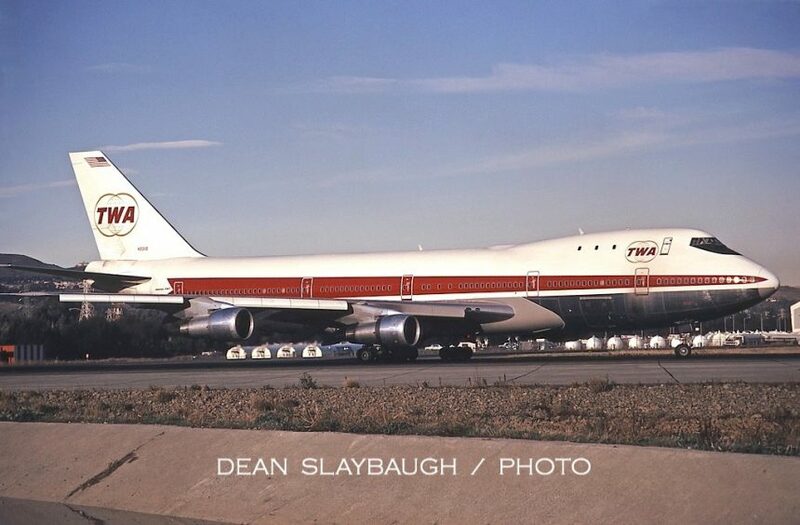 United and Eastern acquired large QC fleets but TWA only had eight and converted them standard cabin interiors after they did not prove worthwhile in the night freight business. But with the cargo doors they proved valuable on the used market. UPS bought them all in 1982. After a 5-year delivery hiatus, TWA began taking delivery of 17 additional 727-231s. N54344 turns into the gate in August 1979, less than 8 months after delivery and wearing the twin-stripe livery, reminiscent of Connie days. This particular Boeing served 21 years with the airline. 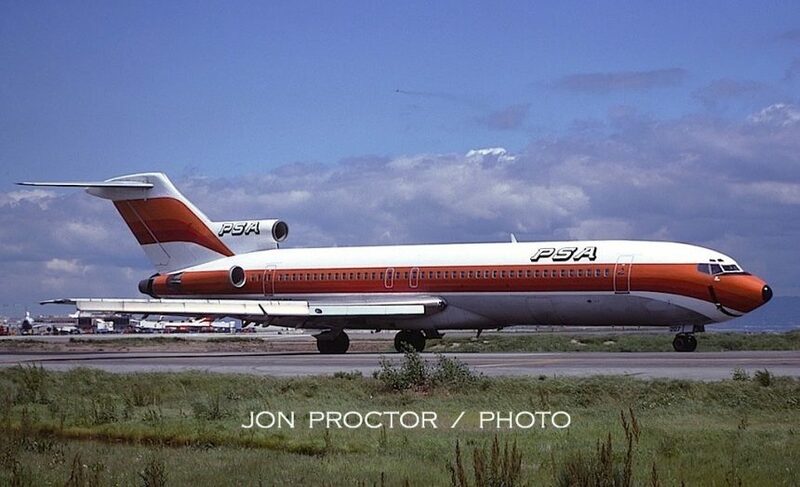 Across the ramp a month later, this 727-214 gives its lineage away with registration N550PS, first operated by PSA. 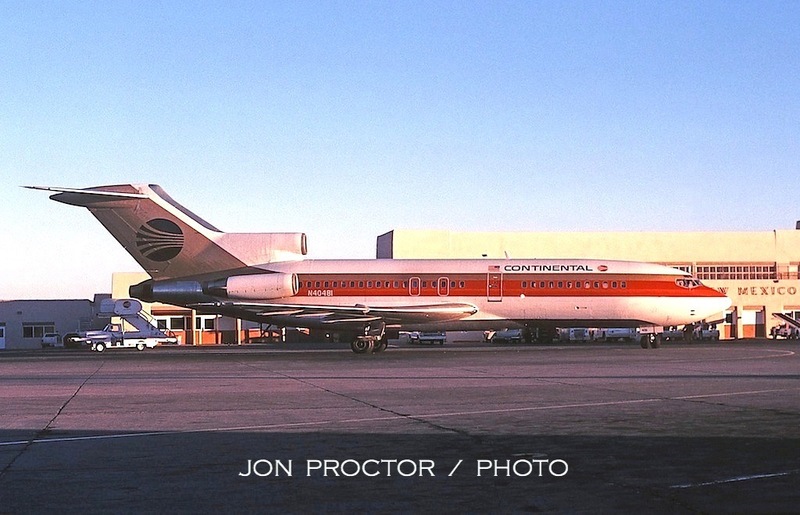 It flew on lease with Continental for 18 months. At an adjacent gate on December 9, 1979 sits 727-22 N40481. 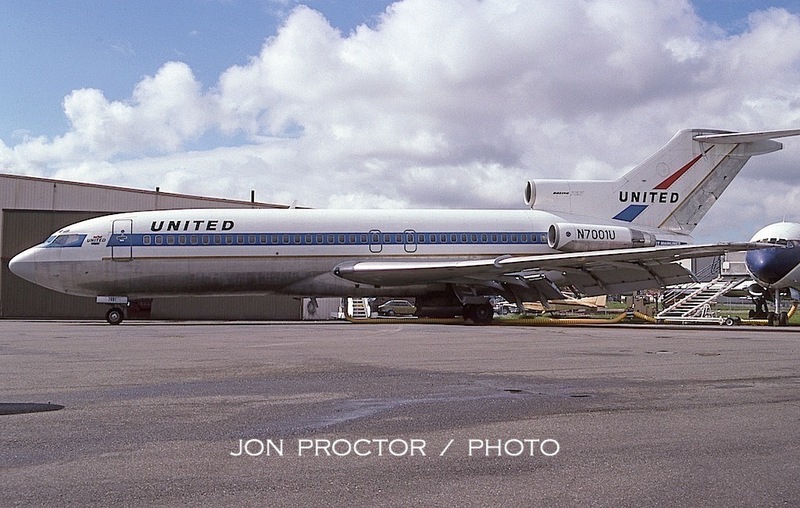 It was first N7037U with United. 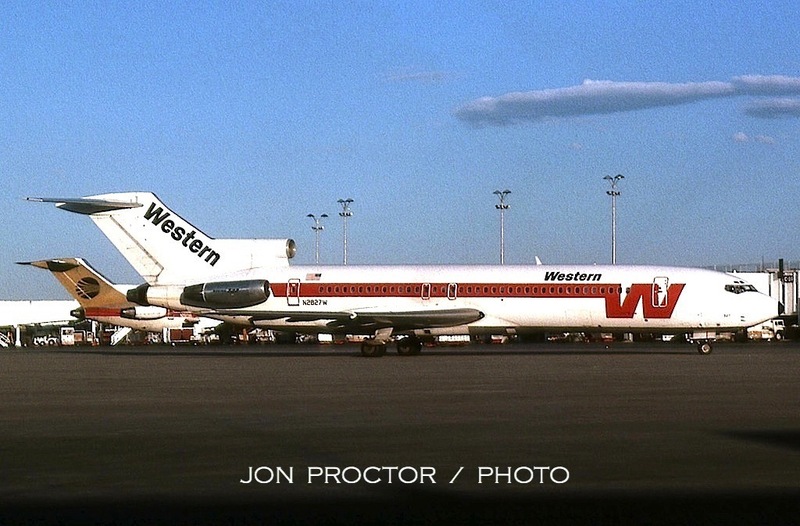 West Coast Airlines first operated DC-9-14 N9102, which was 65th off the assembly line. 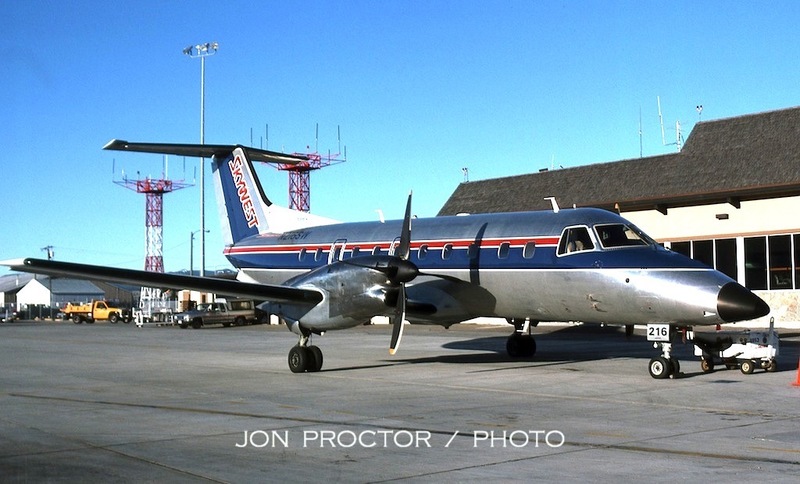 It became part of the merged Air West, then owned by Hughes Airwest and leased to Southern Airways in 1974. Texas International purchased it two years later. 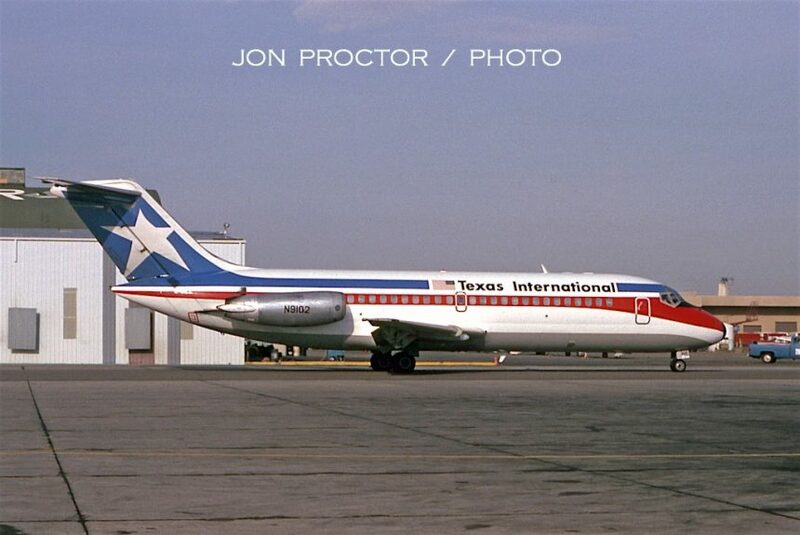 Texas International purchased DC-9-31 N3504T brand new and christened it City of Albuquerque in 1974. The last operator I could find was Air Aruba, which leased in in 1998. I rode 720-024B N57205 from Los Angeles to Denver on October 21, 1965, and hustled up to the observation deck for this picture before it flew on to Chicago. 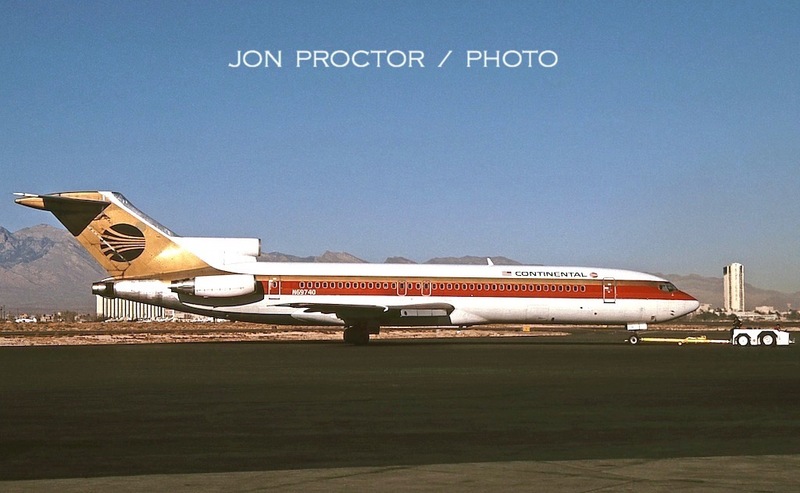 Continental introduced this modified Golden Jet livery on its fleet of eight 720Bs, then retro-painted the older straight-pipe 707-124s. Both were among my favorite color schemes. By July 29, 1968, 1968, the more modernistic, less-exciting (in my opinion) Continental black meatball colors were prevalent. Boeing 727-224 N88701 was the first of 25 factory delivered, barely two months before I photographed her, and served 25 years with just one operator. Only two more pictures at DEN, both caught in August 1979. 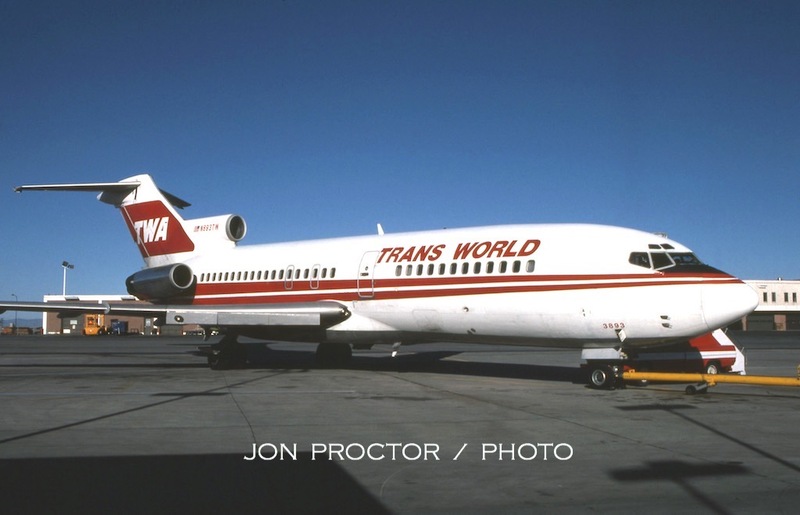 TWA 727-231 N12303 was another one-operator airplane, from its May 1968 delivery until retired in May 1994. 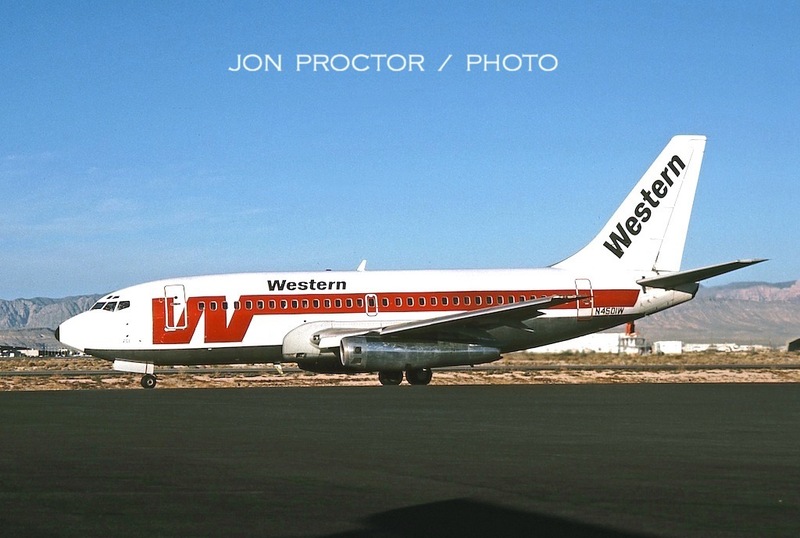 Denver was an original city on Western’s route map, and a major destination throughout the airline’s life. 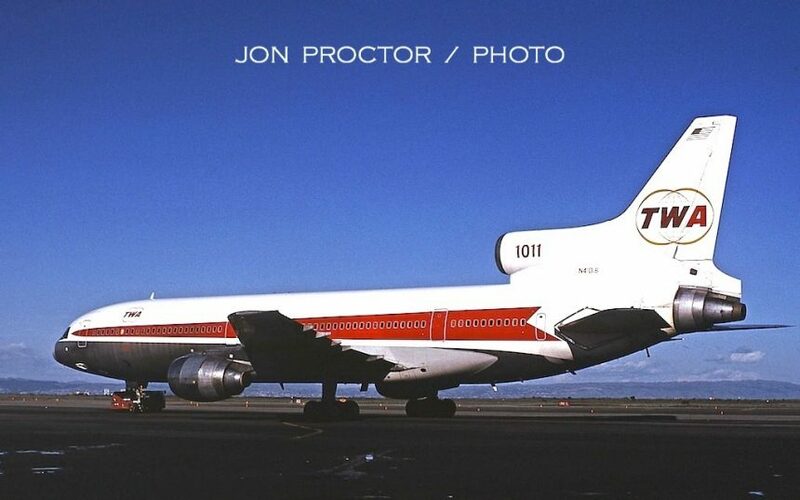 The carrier concentrated on Boeing 720Bs before turning to tri-jets later than most other operators, then built up a substantial fleet of 727-247s. N2827W arrived in December 1977. After only eight years it was converted for freight and sold to UPS as N212UP. Here’s my only shot at Salt Lake City. I worked 727-31C N893TW September 14, 19780, as Flight 572 to St Louis. 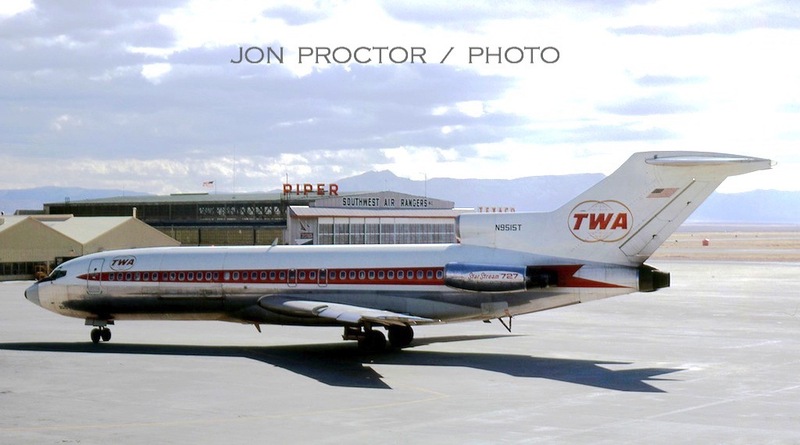 TWA, a relatively late-comer to SLC, was relegated to a non-Jetway gate. Playing “Name the Airport” with this image would be a bit cruel. It’s Casper, Wyoming. I was driving from Sandpoint, Idaho to Denver and took this picture July 11, 1994. My friend Phil Brooks came in on United Express Dornier 328 N329PH, and I talked the station manager into giving me ramp access for the a photo-op. A bit more recognizable, though not much, is Bozeman, Montana, where I stopped on June 10, 1998, en route home from Minneapolis-St Paul on a circuitous routing to accumulate frequent flyer miles. Horizon Air Dornier 328 N340PH is readied for a nonstop flight to Seattle, the longest segment I experienced on this aircraft type. Now to Butte, still in Montana. While with Airliners Magazine, I flew to St George, Utah with John Wegg, for a visit to Skywest’s headquarters offices. The Canadair CRJ200 was relatively new to the airline at the time. N403SW became first regional jet to gain entry into my logbook, on a flight to Salt Lake City. I caught Embraer EMB-120ER Brasilia N216SW as I walked out to the CRJ, in ideal morning sun. And here we are, right in my back yard, at Sandpoint, Idaho Airport (SZT). 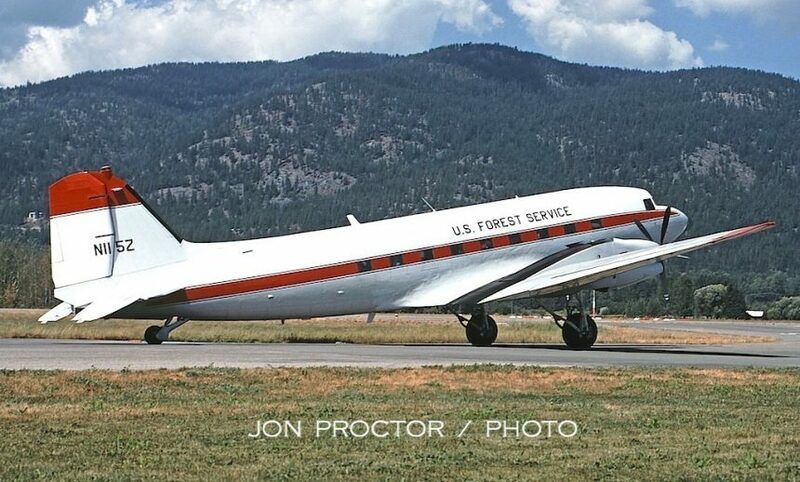 In August 1994, US Forest Service Turbo DC-3 N115Z brought in smokejumpers for a break from firefighting, just across the border in Montana. This venerable Douglas is still active with the same owner. 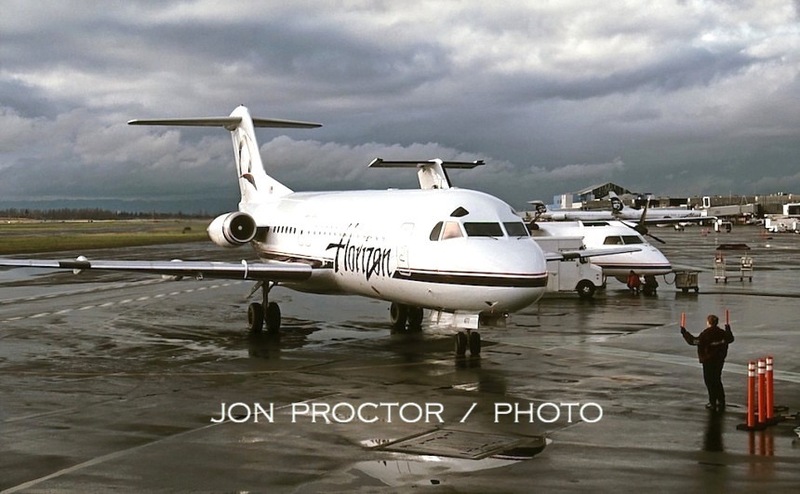 I did a lot of flying through PDX while editor of Airliners Magazine, but rarely had time to stop for pictures. Here are a few exceptions. 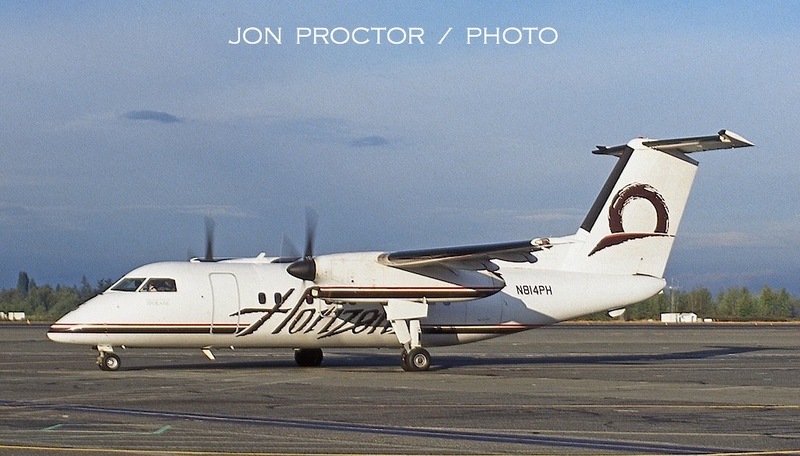 The attractive colors of Alaska Airlines’ subsidiary unit Horizon Air appear on SA-2270AC Metro N2711R, seen taking a quick break between assignments. 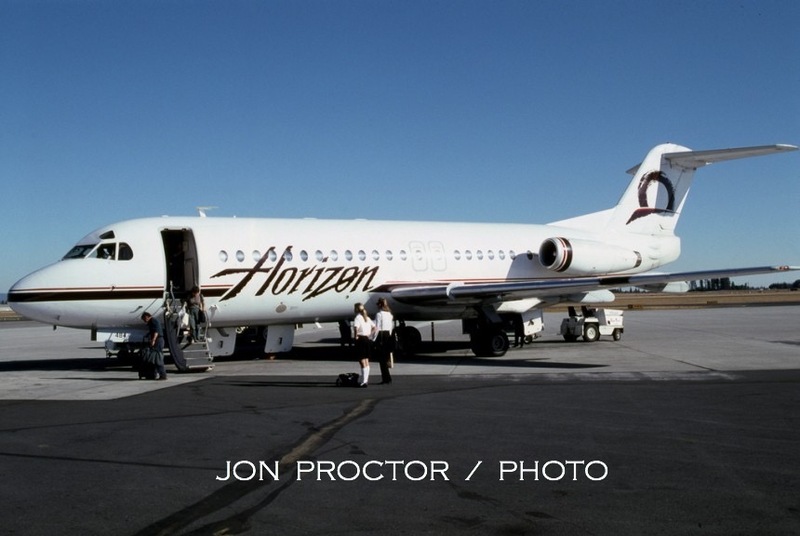 On February 10, 1998, Horizon Air retired its last Metros; at one time, more than 30 flew for the carrier. Above: The final service, Flight 2420 from North Bend, pulls into the gate during a rain shower. 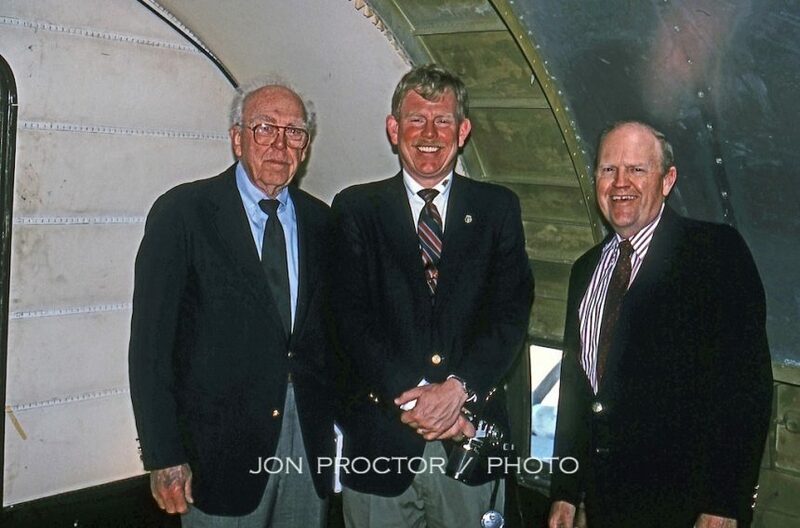 Below: First Officer Derek Hughey and Captain Mike Roy pose with co-founders Bruce McCaw (left) and Milt Koult (center). 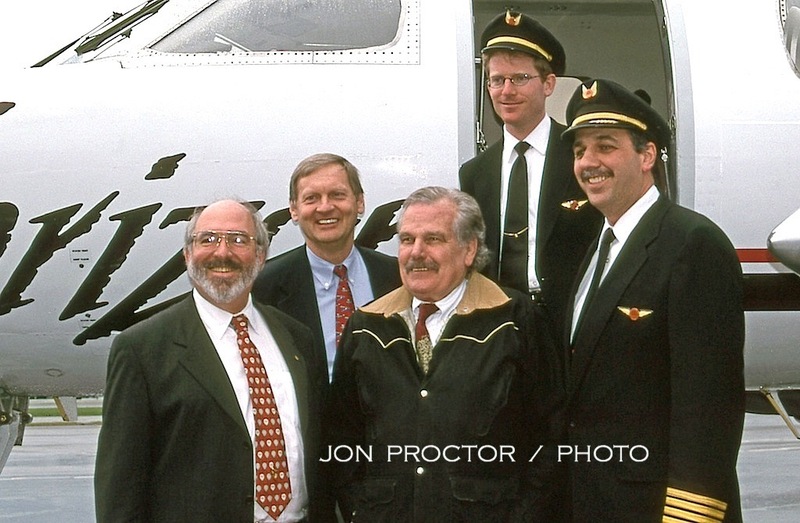 Horizon CEO George Bagley is second from left. On the same afternoon I snapped Fokker F.28 Mk. 4000 N477AU on arrival, from a vantage point aboard another F.28 that took me back to Spokane. 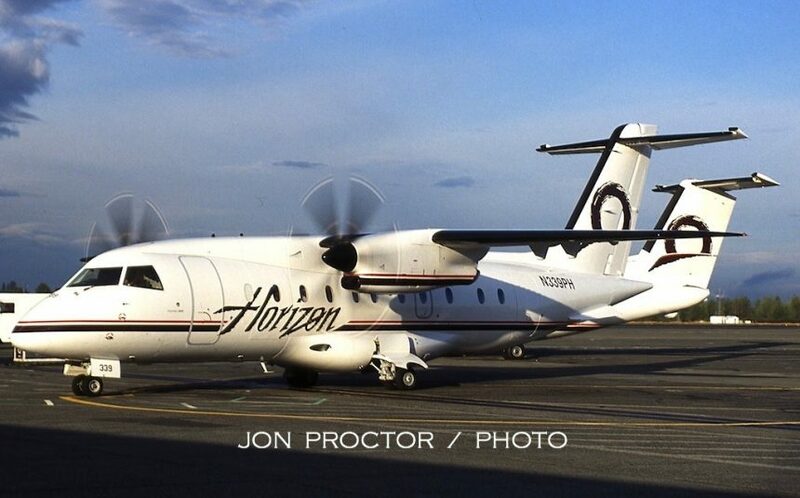 Another Horizon Air F.28 Mk. 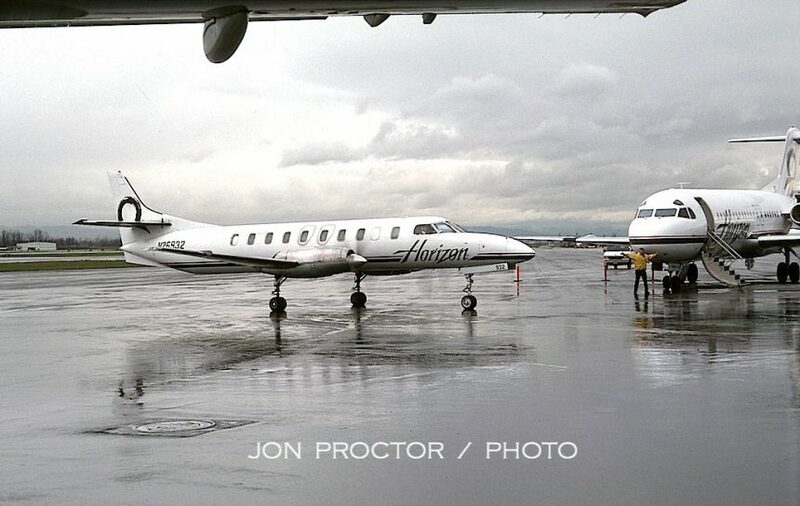 4000, this time N484US, is being serviced at Spokane (GEG, for its original Geiger Field name) on March 29, 1998. After operating a dozen smaller F.28 Mk. 1000s, the type was replaced by 17 Mk. 4000s starting in 1996. 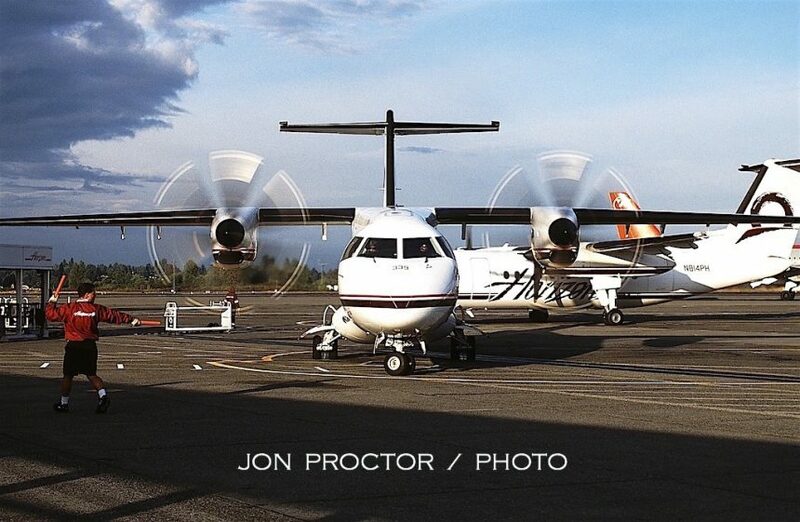 Right behind the Fokker, on the same day, De Havilland DHC 8-Q202 N350PH, The Great City of Pendleton, will quickly turn around for a service to Seattle. The larger, faster Dash 8-Q401 is now the sole type flown by Horizon Air, but when the pictured N403QX brought me to Spokane from Seattle on May 16, 2001, it had only been in service for a few months. I was able to loiter around long enough to snap a photograph before passengers began boarding for its next flight, back to Seattle. 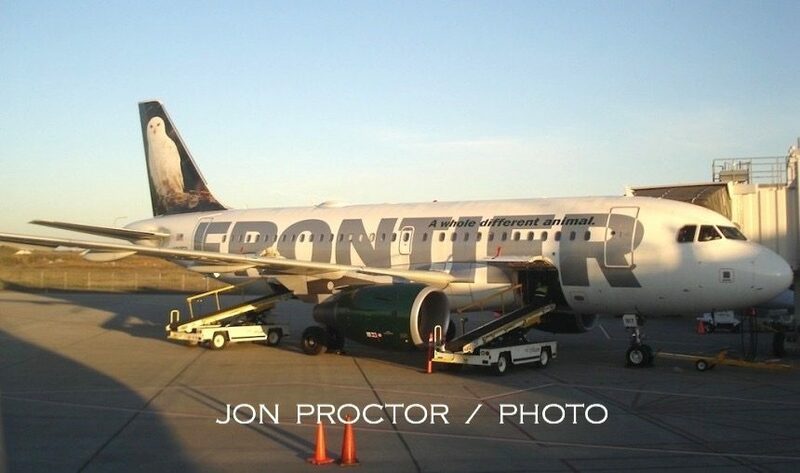 In May 2007 I was departing on an Alaska flight and from my window seat got this shot of Frontier A319 N917FR, with its distinctive animal tail, this one a white owl. 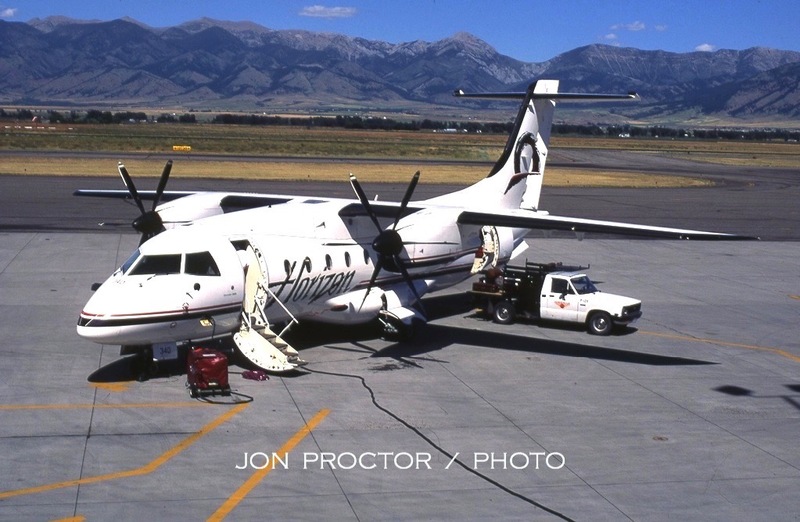 “The New” Frontier operated out of Alaska’s terminal, with flights to Denver. This particular Airbus was sold to a leasing company in 2008 and became VP-BIQ with Rossiya Russian Airlines, where it still serves. Northwest Airlines was the airline of choice, at least for me, when it came to East Coast trips, with convenient connections at Minneapolis-St Paul. On March 21, 2008, I was waiting at the gate for my flight to the Twin Cities, and photographed the airplane as it arrived. 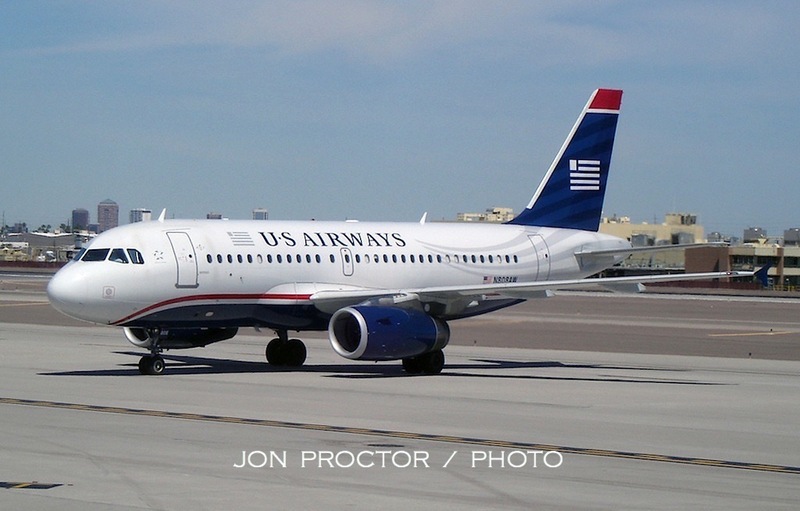 A320-211 N305US was already 19 years old, 46th off the Airbus assembly line. 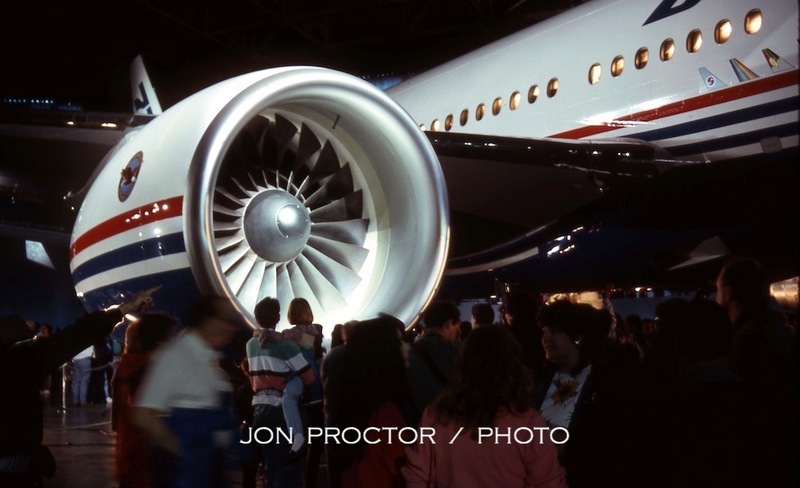 It was sold nine months later, to Goodyear, Arizona-based AeroTurbine, and scrapped. I gained brief access to the manufacturer’s ramp at Boeing Field, on January 17, 1980; check out the snow in the lower righthand corner! The setting sun limited my shooting opportunities. 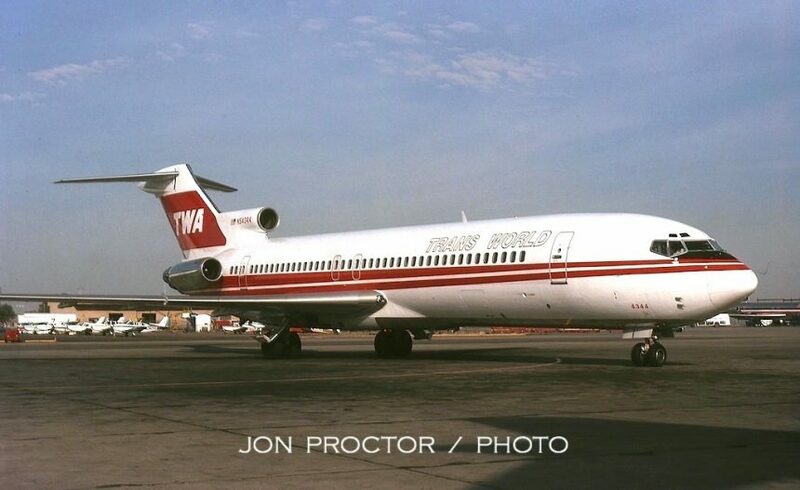 TWA was taking delivery of its last batch of 727-200s, as evidenced by N54350. 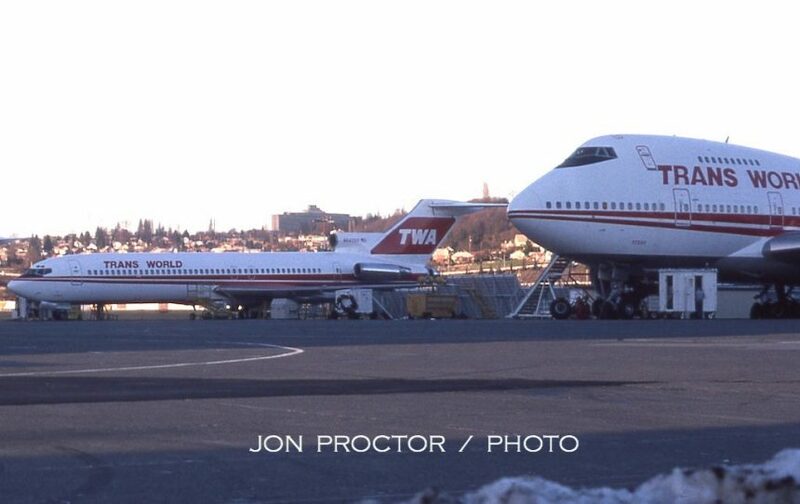 On the right, 747SP-31 N58201, the first of three for TWA, is still two months from delivery. For those who believe Ozark never operated 727s …. you’re right! 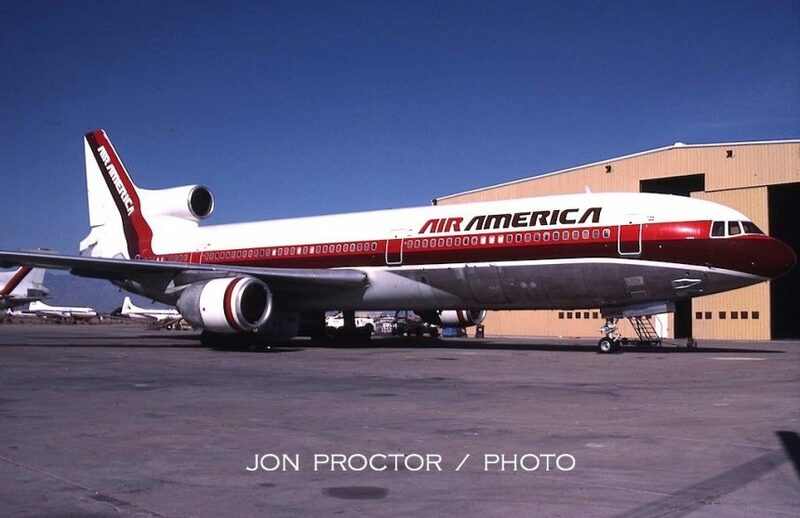 Two were so ordered but instead sold to Pan Am before delivery. 727-2D4 N721ZK became N362PA a few months before this picture was taken, and was leased back by Boeing for flight-testing of some kind. 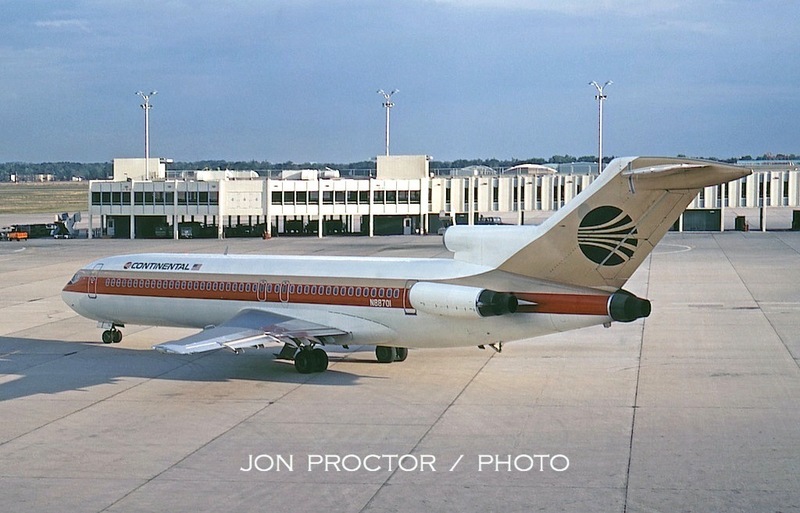 It actually joined Pan Am in April, as Clipper Frankfurt, assigned to the intra-German service. Eighteen years later N362PA was applied to a different 727, but that’s another story. 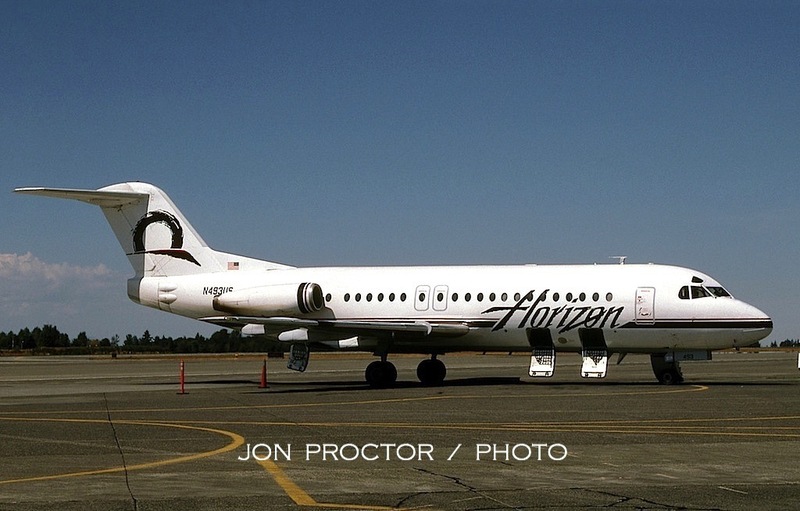 Skipping ahead to October 1994, we find the Stratoliner pictured earlier, following its delivery to Seattle for refurbishment. 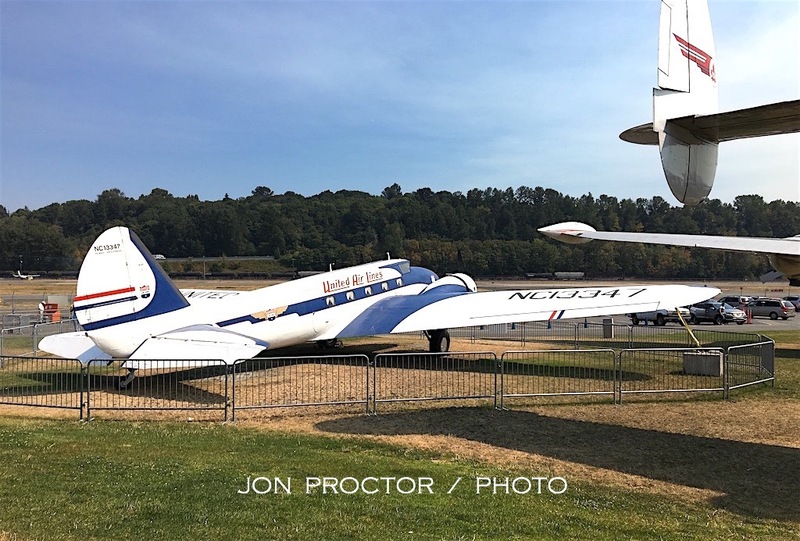 I photographed it in front of the Museum of Flight, were it was parked for a Boeing management club meeting, which I attended as a guest. That’s me on the steps, about to get an interior tour. One of the meeting speakers was retired TWA Captain Bob Buck, well-known author, who flew Statoliners when they first began carrying passengers. 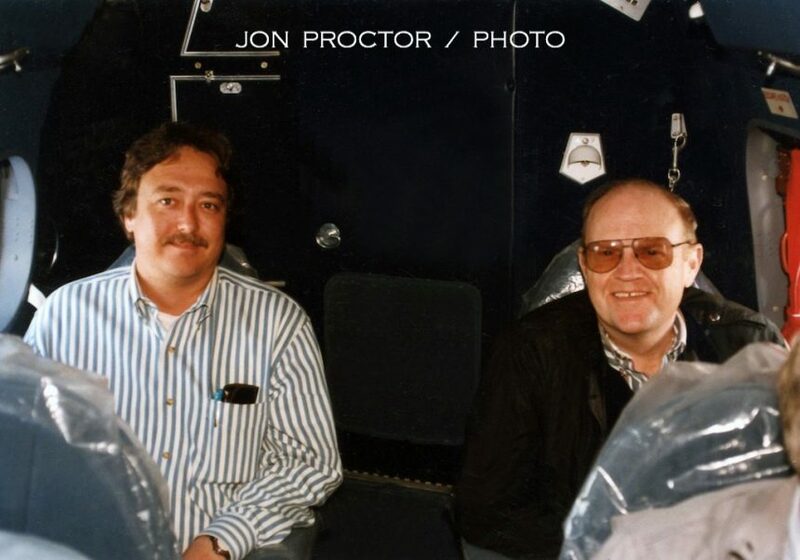 In the center is Bob’s son, Rob, a Delta pilot (now retired). I’m on the right. Among Bob’s books is North Star Over My Shoulder, his autobiography. It’s a truly great read and still available for purchase. It’s hard to believe this is the same airplane, rolled out of the same Boeing hangar in which it was originally built, on June 23, 2001 and resplendent in Pan Am colors. 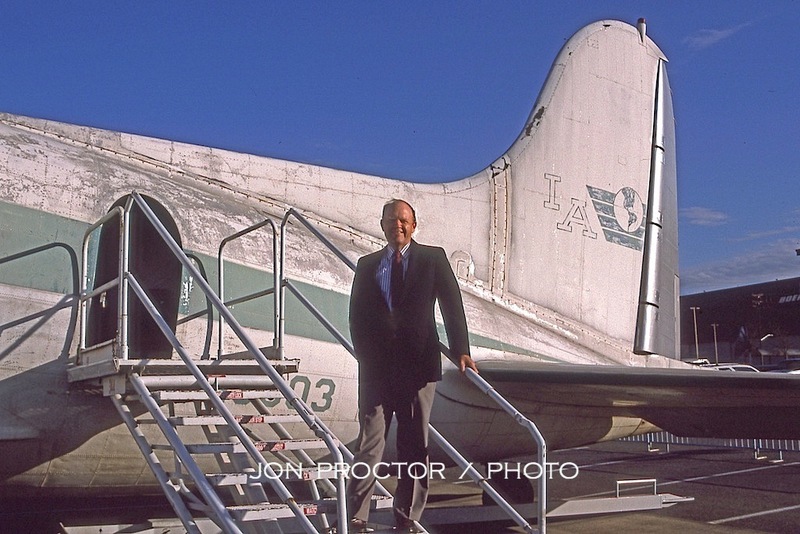 Clipper Flying Cloud was painstakingly restored inside and out by dedicated Pan Am and Boeing volunteers. Its original tail number is visible, with the “C” included for authenticity. 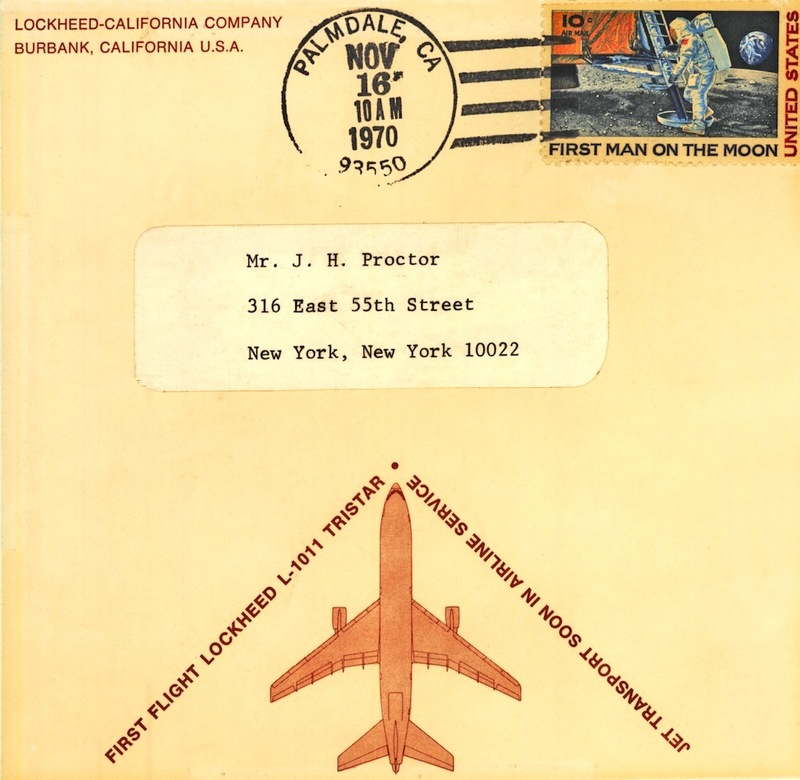 Even the Boeing logo and Stratoliner markings were included. Following a rather embarrassing March 2002 ditching in Elliott Bay, the airplane was again refurbished and now resides at the Steven F. Udvar-Hazy Center, companion facility to the National Air and Space Museum, in Washington, DC. 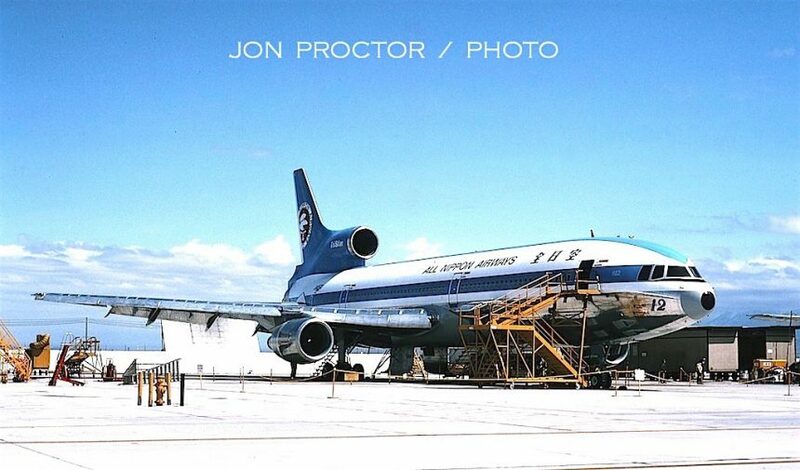 Dropping back to my 1996 visit, here’s the prototype 707 seen earlier, in Arizona, after a fresh coat of paint and loving care at Boeing Field, as it was prepared to eventually join the Stratoliner in Washington, DC. Its interior still held various test layouts. Five-abreast was as much as could be accommodated in the narrow fuselage that was widened for production models. 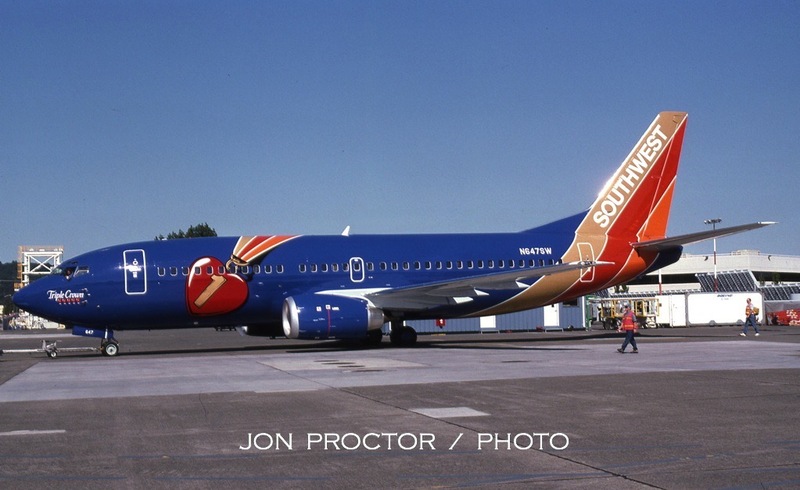 Boeing delivered 737-3H4 N647SW to Southwest Airlines on June 9, 1997, in this special Triple Crown One livery, recognizing five consecutive years of ranking first in the categories of on-time performance, baggage handling and lowest customer complaints. I was there for its delivery ceremony. On the same visit, I managed to avoid Boeing security police and squeeze off a shot of Alaska 737-490 N788AS, being readied for delivery. 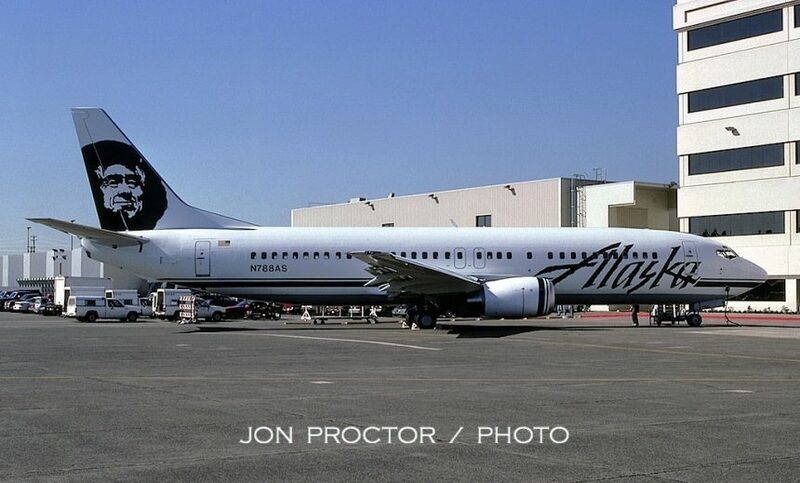 The newest type for Alaska’s fleet is now in its twilight years, soon to be replaced by new 737-900ERs. 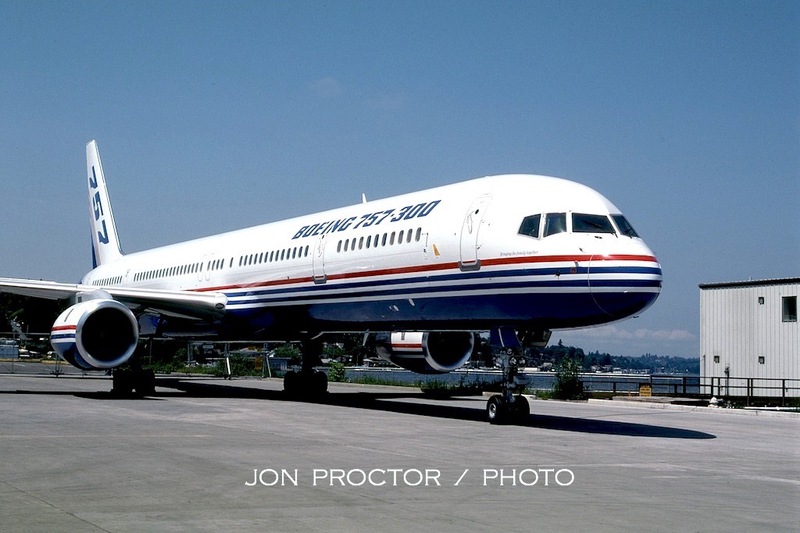 The prototype Boeing 737 was flown for the last time on September 21, 2003, to Boeing Field, where it was built more than 36 years earlier (737 production was later moved to Renton). 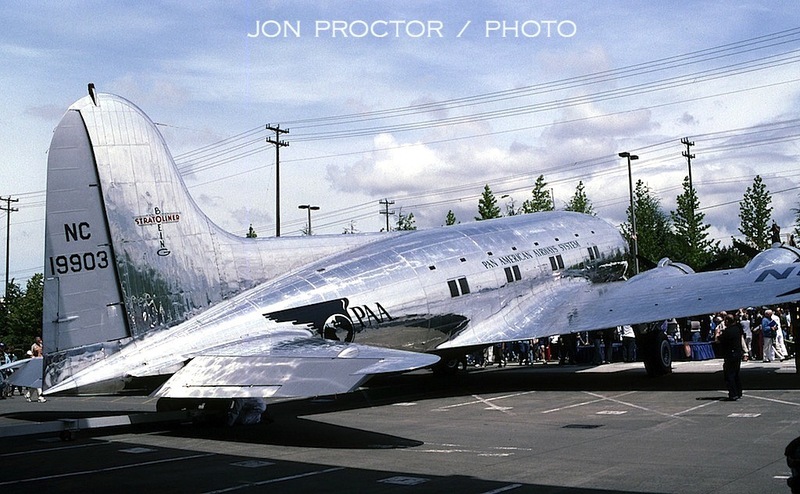 It is seen here on the Museum of Flight ramp in May 1997, and remains part of the museum’s collection. The historic Boeing twin will be housed in a new facility across the field, when it is completed by the end of 2015. Also in the museum’s collection is VC-137B 86970, one of three heavily modified Boeing 707s that first served President Eisenhower. 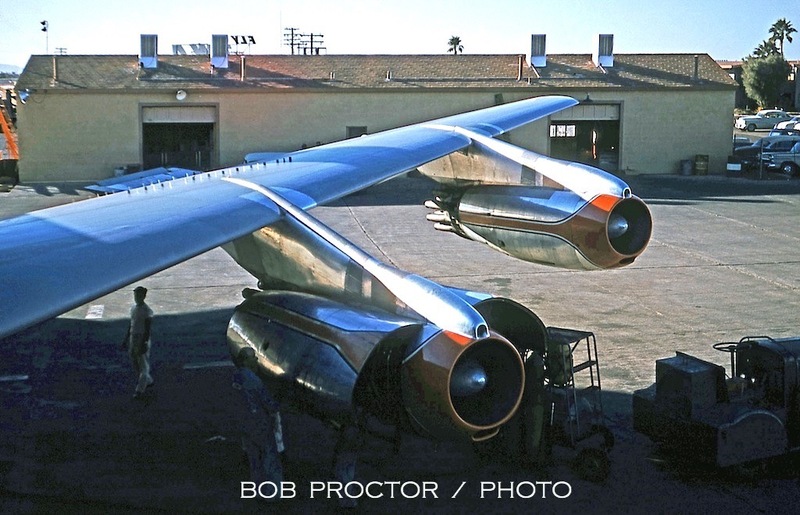 Delivered with “straight-pipe” turbojet engines, the trio was upgraded to turbofan power. 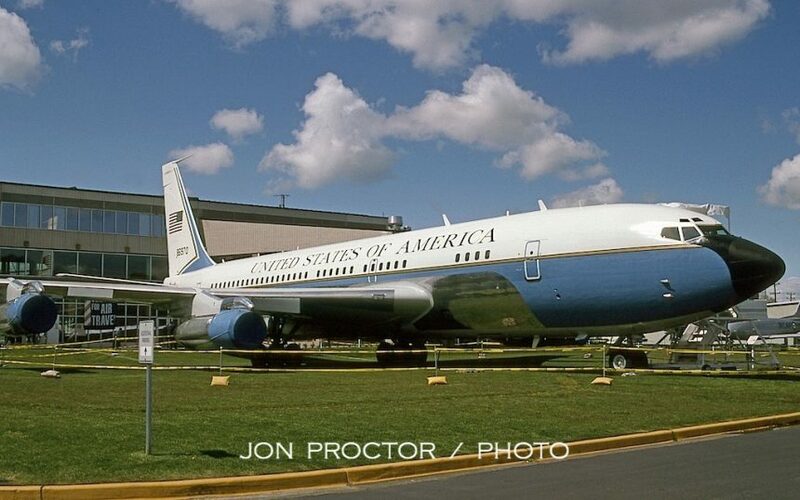 SAM 970 served as Air Force One during the Lyndon Johnson administration and flew other diplomatic missions after the longer-range VC-137C took over for Chief Executive duties. 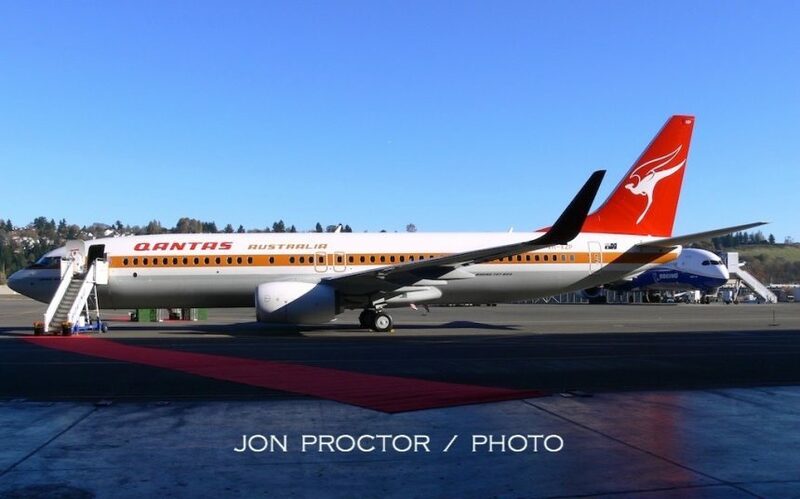 On November 16, 2014, I attended the rollout of Qantas Airways’ first “retro-jet,” the 75th and last 737-338 delivered to the airline, all decked out colors first worn on the carriers initial 747. The airplane took off for Sydney, via Honolulu and Fiji, a day later. Across the ramp sat Air China 747-89L B-2487, awaiting delivery. 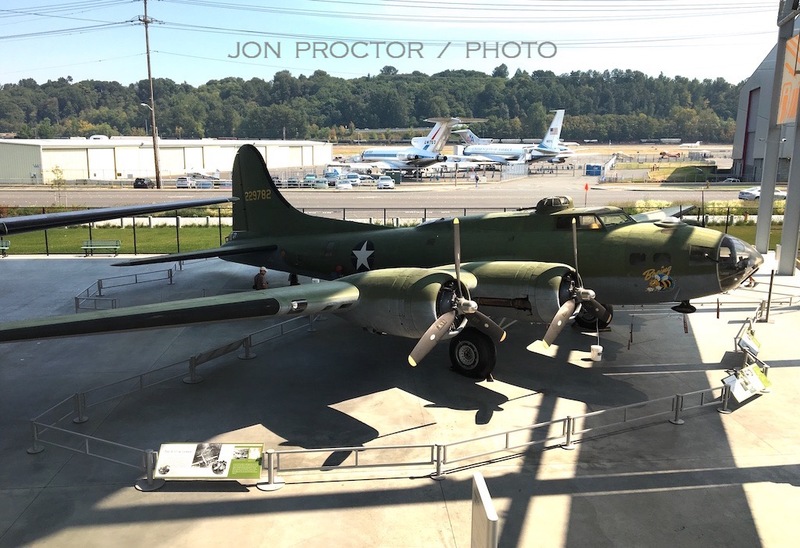 On August 20, 2016, I visited the Seattle Museum of Flight’s new Aviation Pavilion, across the street from the main facility. Although an open air facility now, it was designed to eventually be completely enclosed but for now it at least shelters the historic aircraft from much of the weather. During the visit I was guest of my good friend Geoff Thomas and www.airlineratings.com. Naturally I was attracted to Douglas DC-2 N1934D, which I rode in 1994 from St Louis to Long Beach. Owned by the Douglas Historical Foundation at the time, it was later acquired by the Museum of Flight and placed here on permanent display. 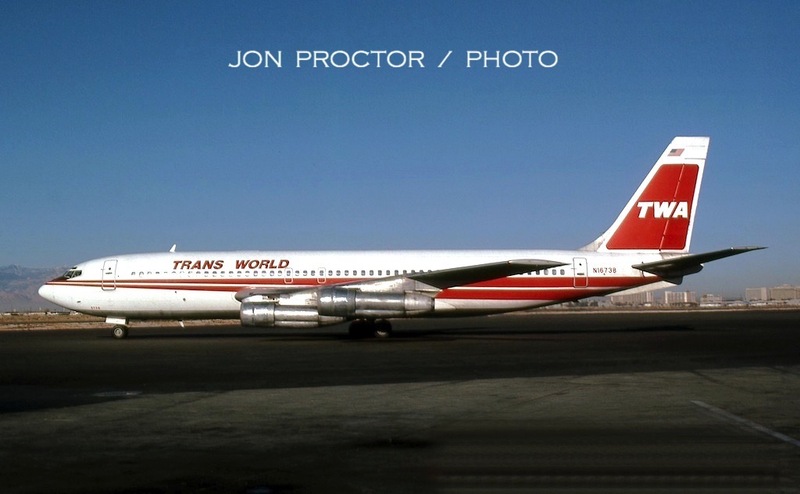 Resplendent in TWA colors, the NC13711 registration was applied, although the airplane was an original Pan Am delivery. 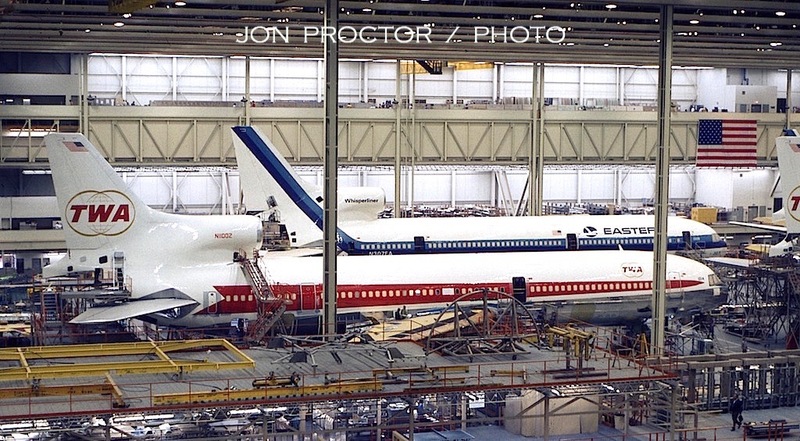 The Boeing 747 prototype was repainted prior to movement to its new home. Used as a testbed for many years, it never flew for an airline. The museum now allows visitors to take interior tours. 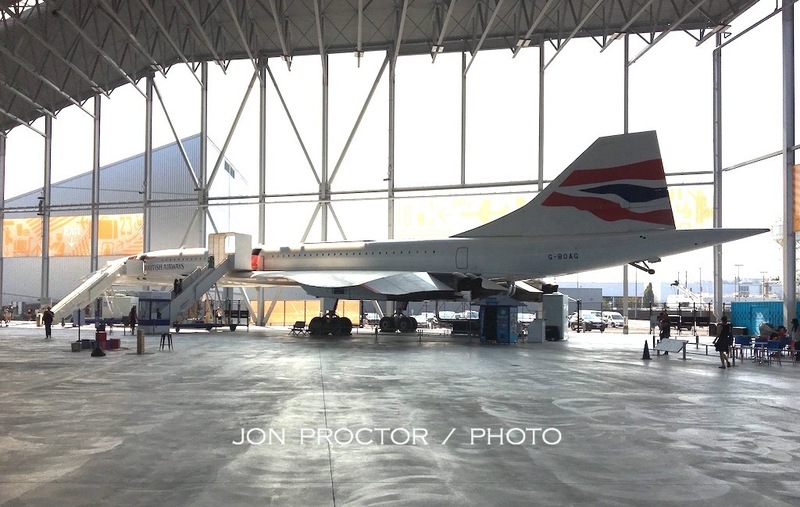 British Airways Concorde G-BOAG is also available for interior visits. This beautifully restored B-17 sits next to a B-29 and B-47. During my tenure with Airliners Magazine, I managed a few invites to other Boeing rollout functions. The 1,000th Boeing 747 made its debut on September 10, 1993, and became 9V-SMU with Singapore Airlines. Boeing converted the jumbo to a freighter in 2010 and it was last reported with Southern Air, registered N400SA. 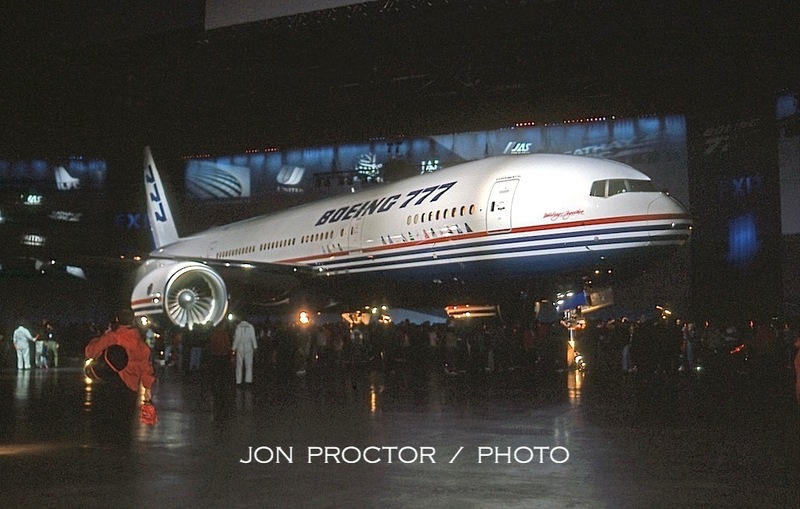 The Boeing 777 was unveiled inside, on April 9, 1994. In fact there were multiple presentations for Boeing employees, airline representatives and the media that day. The below picture is one of my favorites. Look at that Boeing worker holding his daughter as they gaze at the massive Pratt & Whitney power plant. 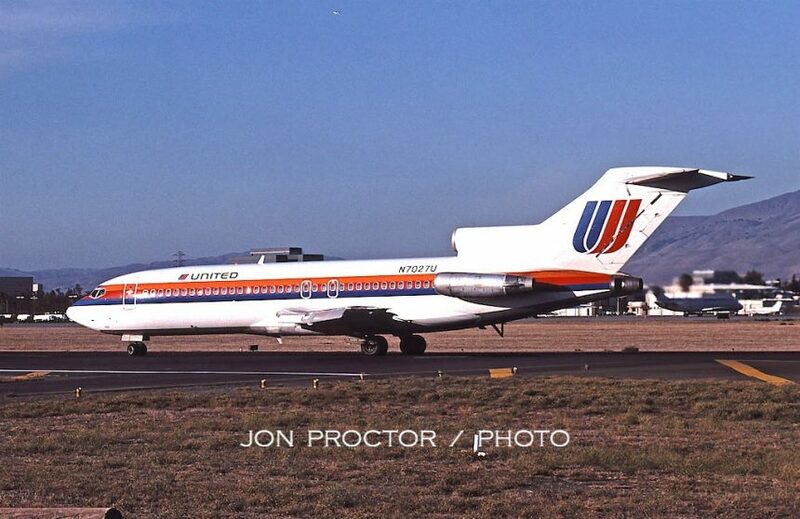 The prototype Boeing 727, N7001U, spent its entire flying career with United Airlines. 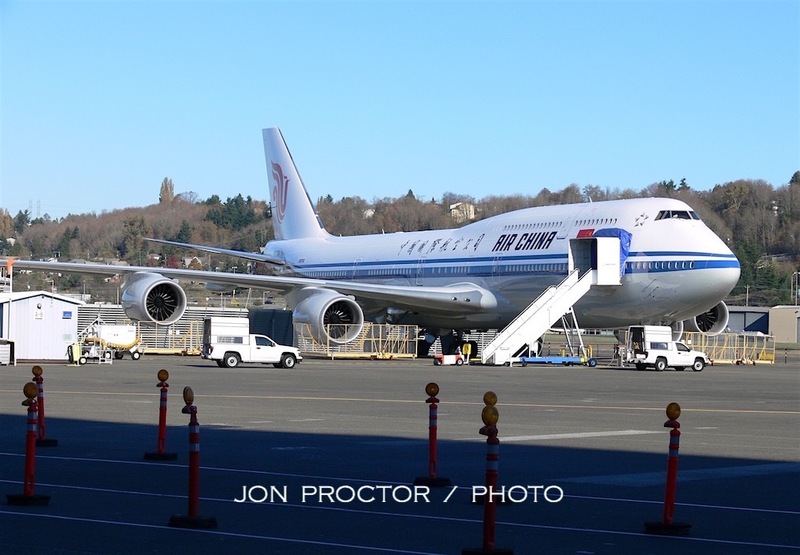 It still rests at Paine Field, with plans afoot to relocate the historic trijet to Boeing Field for display at the Museum of Flight. Note the historic de Havilland Comet 4 off to the right. 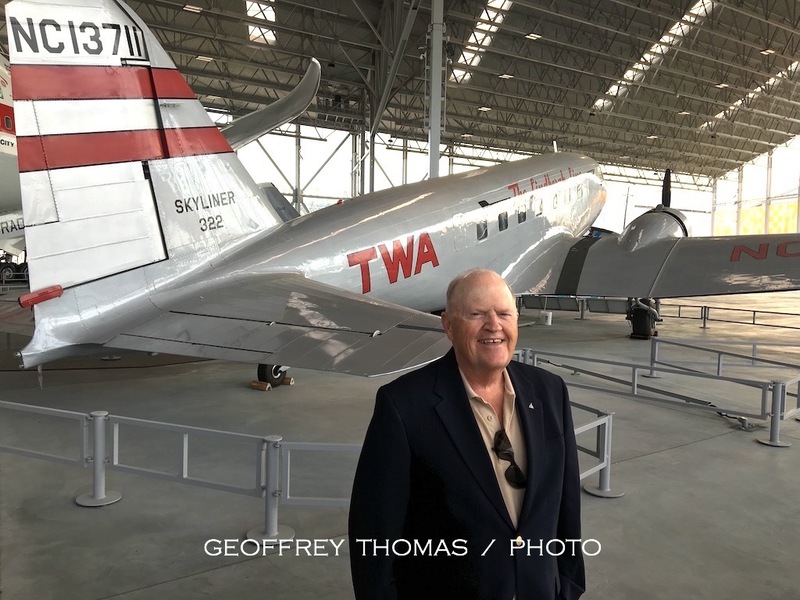 Thanks to my good friend Brian Baum, I was invited to take a ride on the historic Boeing 247 owned by the Seattle Museum of Flight. The above was taken before our departure from Paine Field. 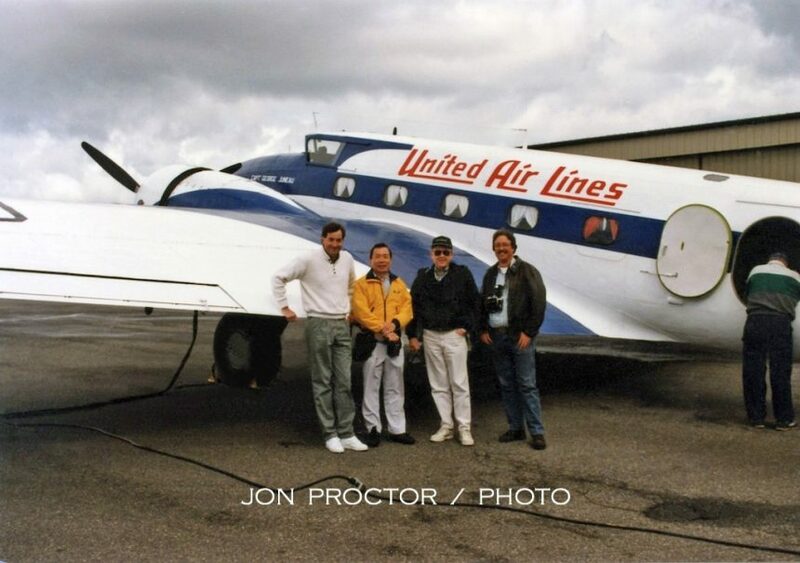 That’s Brian on the right, then friend Fred Chan, myself and Nick Veronico, who I worked with at Airliners Magazine. 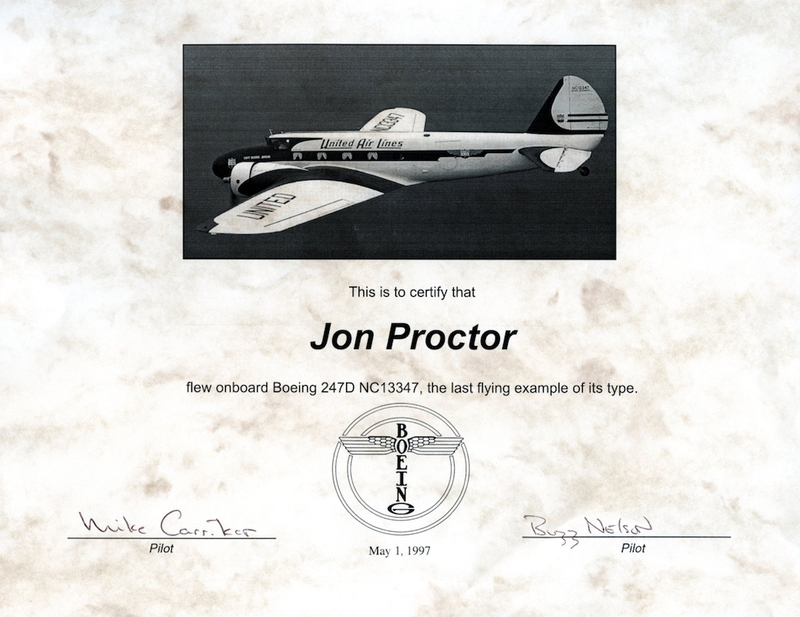 We flew over to Boeing Field, executed a touch and go, then landed there. Nick and I posed during the short flight. The 247 rests at Boeing Field in August 2016, before being moved into the Aviation Pavilion. A relatively small number of 767-400ER (extended-range) variants were built for Delta and Continental Airlines. 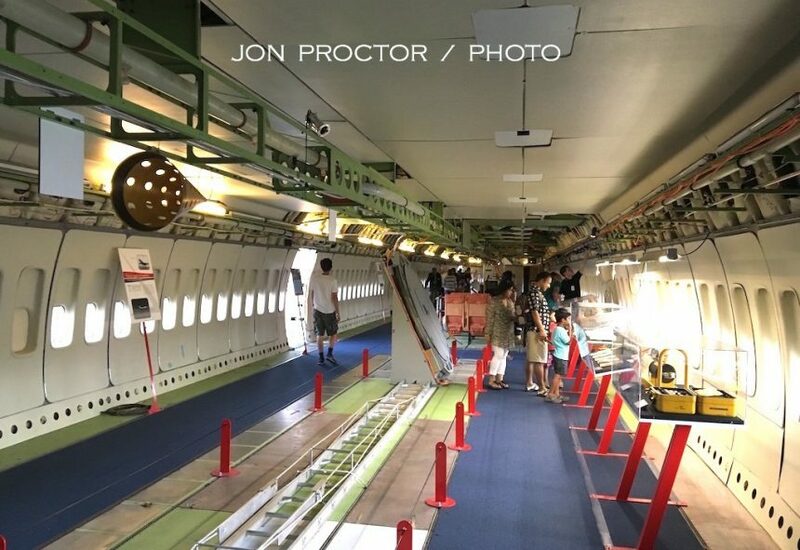 Twenty-one feet longer than the -300 model, it features raked wingtips and slightly larger windows identical to the Boeing 777. The rollout ceremony took place on August 26, 1999. In the end, only thirty-seven -400ERs were produced. I made two visits to the Renton factory. 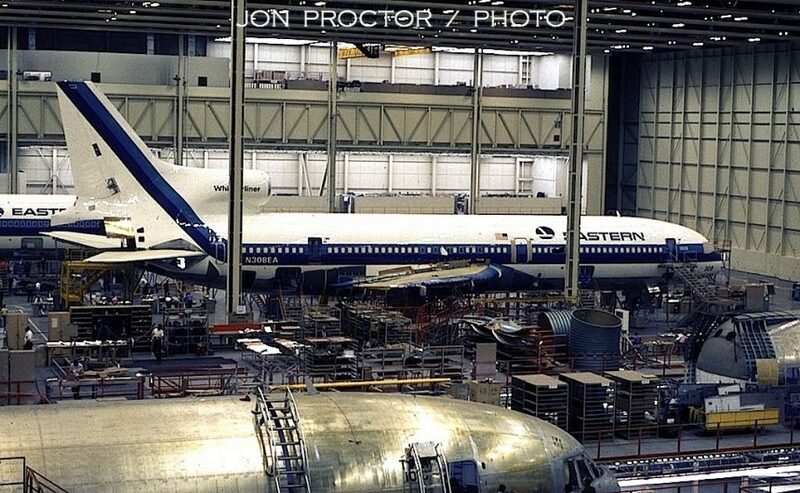 Except for a small batch, all the Boeing 737 have been built here. 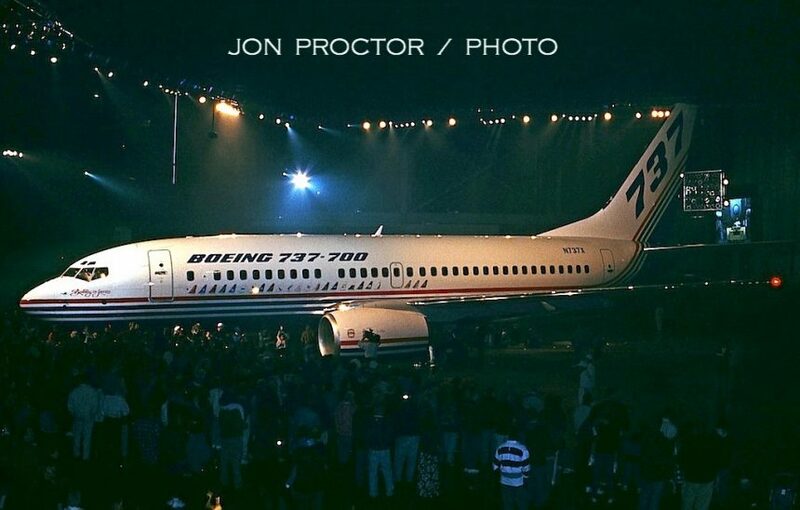 The prototype 737-700 made its debut on December 8, 1997. I’m afraid the lighting left much to be desired. 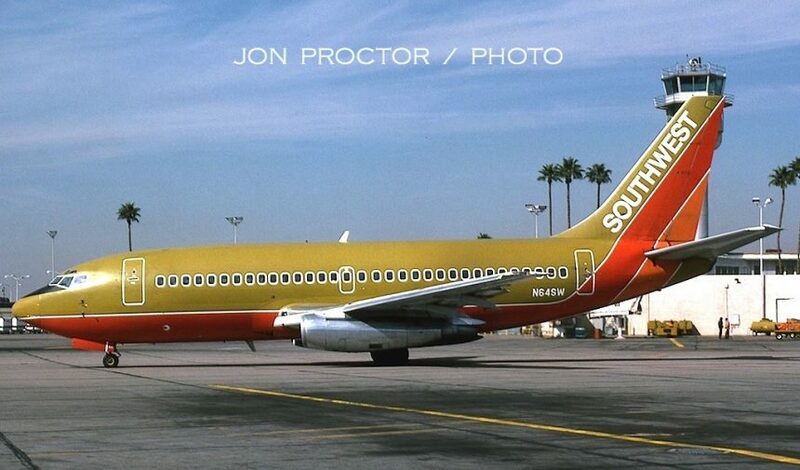 N737X eventually became N707SA for launch customer Southwest Airlines, where it is still in service. 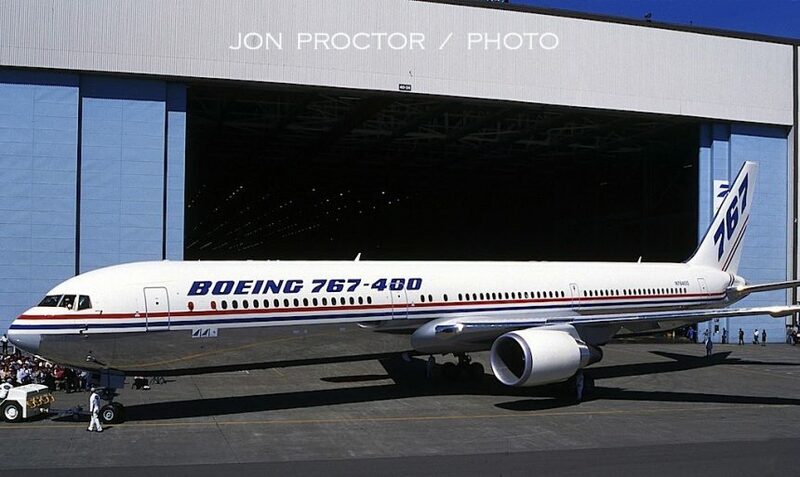 Another short production run involved the Boeing 757-300, seen here on its rollout day, May 31, 1998. Fifty-five were built for seven customers. Today Continental and Delta operate the lion’s share, Delta having inherited its fleet from Northwest. Twenty-three feet longer than the 757-200, the type is still a desirable airplane, seldom seen on the second-hand market. Leaving the gate on another Pan Am 707 headed for London, I caught 707-321B N417PA, Clipper Winged Racer, on April 30, 1971, my only early picture at Sea-Tac. Two years later the Boeing crashed into the sea shortly after takeoff from Pape’ete, Tahiti. One passenger was found alive, floating on some of the wreckage; everyone else died. The accident’s cause was never determined. 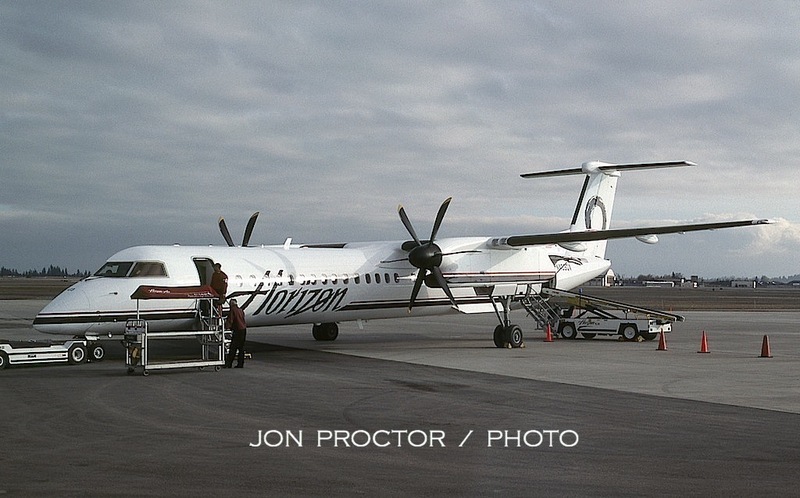 Years later much of my flying through Sea-Tac was on Horizon Air. Here are three types no longer in its fleet. First, a venerable de Havilland-Canada Dash 8-102, N814PH, photographed on September 9, 1994. On the same day, I caught Dornier 328 N339PH pulling out of an adjacent gate. I miss the comfortable Fokker F.28, which was the flagship at Horizon Air for many years. N493US sits between assignments, on August 17, 1997. Tom Norwood’s Deregulation Knockouts books provided information for several of these photo captions. 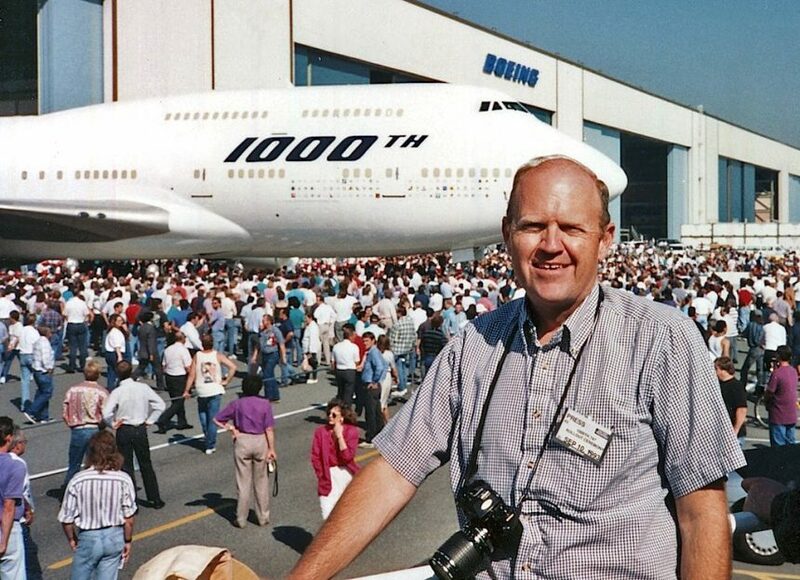 In addition, Tony Eastwood’s Airliner Production Lists gave me detailed histories used to formulate what you have read here. Many thanks to both these gentlemen. 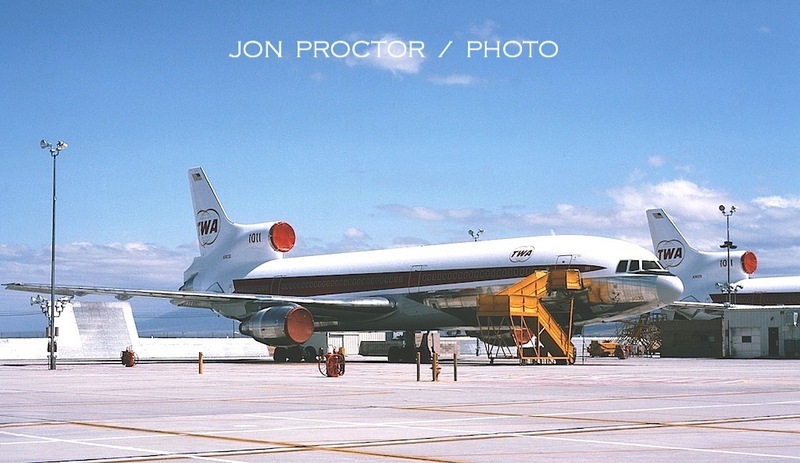 Congratulations, Jon, on another outstanding collection of your airliner photographs. Absolutely fabulous! There are so many wonderful images that it is impossible to comment on all of them. 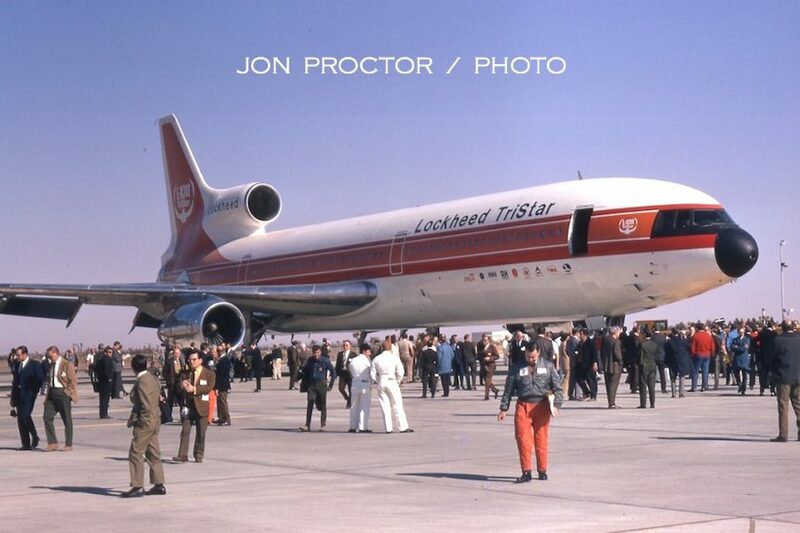 But I found the series depicting the Lockheed L-1011 TriStar’s first flight very interesting. What a sense of satisfaction it must have been for everyone involved to witness that maiden voyage … and how neat that Lockheed had B&W prints available for the guests before the aircraft landed! 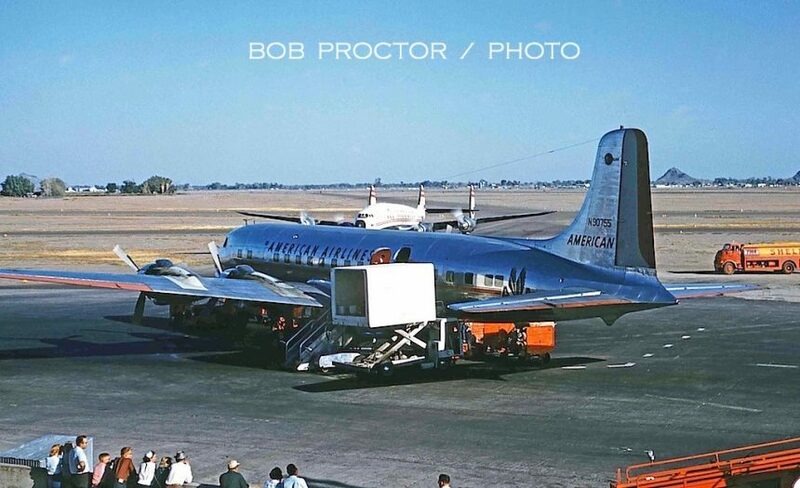 Likewise, your shots of the Boeing 307 Stratoliner and “Dash 80” 707 prototype were very interesting. Love all the pics. Makes me sad that so much of all this is gone. Thank you for keeping the memories alive!! Wow. Just wow, Jon. this is an awesome collection. thank you! Jon, this is an incredible collection of photos. I’m wondering about the first photo, the UA DC7 that the caption reports as at SFO. Please note that the old SFO terminal was on the west side of the field adjacent to 101, which was not yet a freeway. The “new” terminal opened in 1954, the year the photo was taken. Plus, the hills in the background don’t look right for the hills to the west of SFO. A local friend suggests that this is HNL, not SFO. Any chance your brother was in HNL that year? This is fantastic as usual, Jon. Thanks. Please keep doing what you do! Painted-on PAX windows? Who knew! Great trip down memory lane. Only one aircraft could make it more complete “La Belle Caravelle” in United livery. 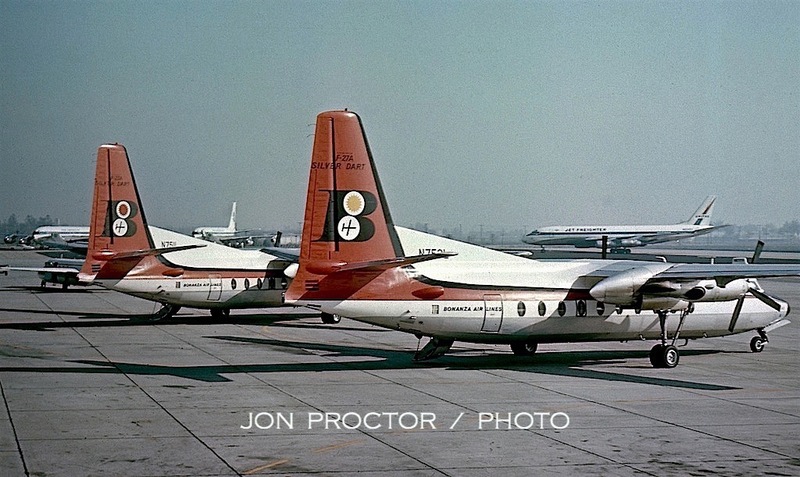 UAL Caravelles used to make touch and go passes at the CYS municipal airport during training flights out of DEN back in the early 60’s when I was an Instructor in Field Training and Stewardess Training at CYSED before everything moved to Elk Grove Village in 1961. But I may have spoken too soon, because I seem to remember that the Caravelle spent its short life with UAL mainly in the Midwest. Perhaps there is a photo of it one of your other folios. Excellent web site, and a big thanks for sharing your photos. I d=found a couple of mistakes…. 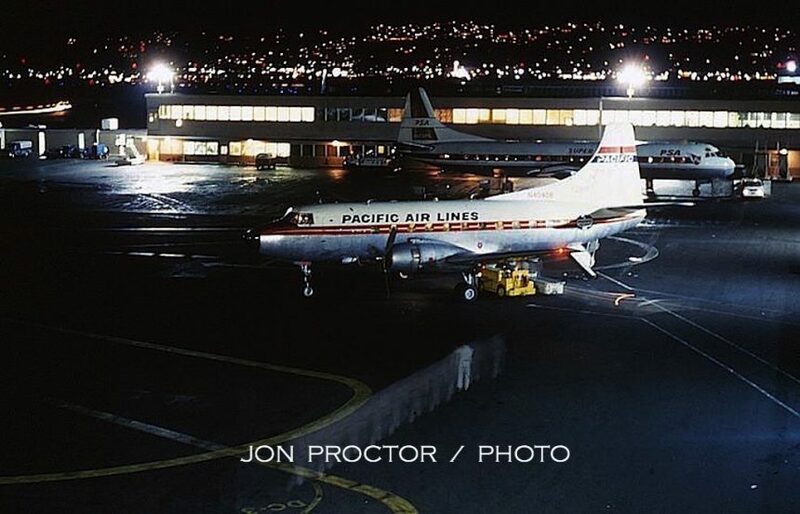 Pacific Airlines M404 photos (5th and 6th from top) are duplicated. 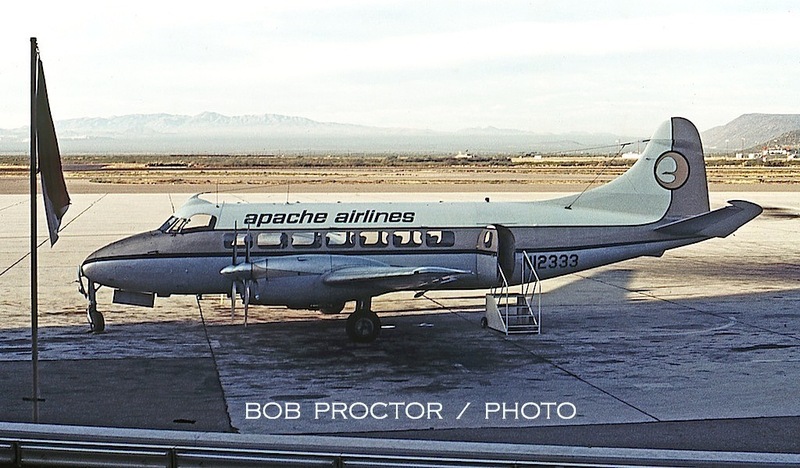 Same for the Apache Airlines Dove…. same photo twice. Again, thanks for sharing !!! Many thanks for the catches; I had to reinsert most of the pictures and wound up with those dupes; since corrected. I appreciate the feedback! 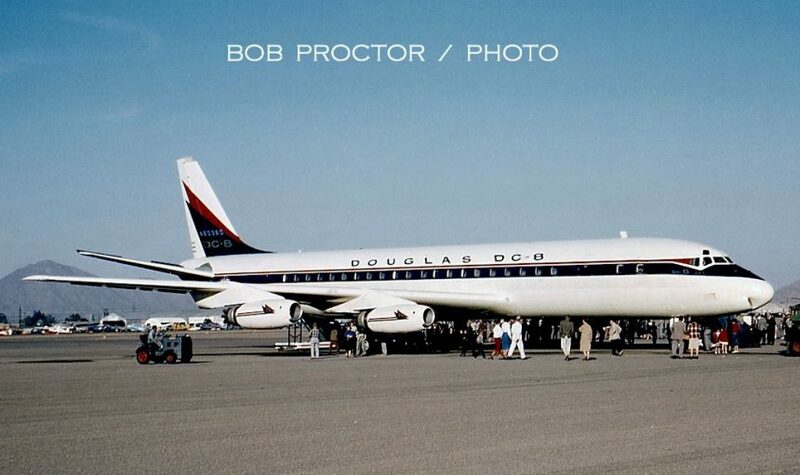 Many thanks for the pictures of the “older” aircraft! 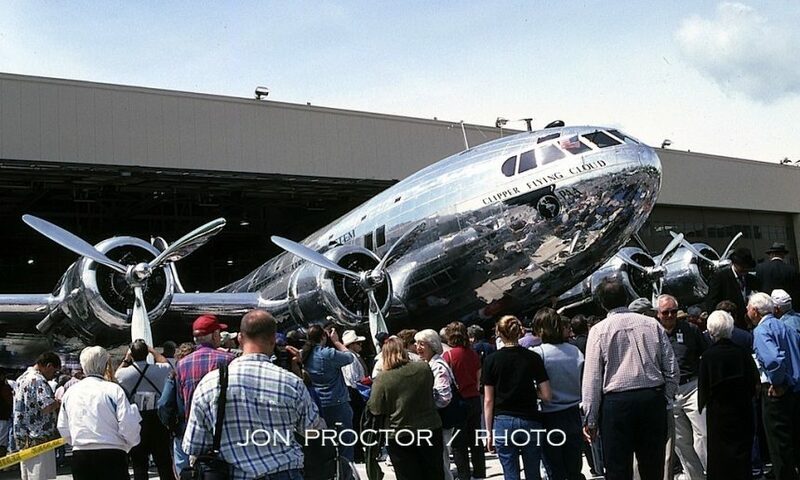 Having seen that first picture of the Lockheed Electra, it brought back memories of the crash in Tel City, IN. I was working in flight ops at Midway Airport for NWA at the time. It was horrid to post DELAYED next to the flight number on the Arrival/Departure board. Then we had to gather some of the clergy/chaplins to help with talking to the next of kin that were arriving. As they approached, we escorted them to a private room……. 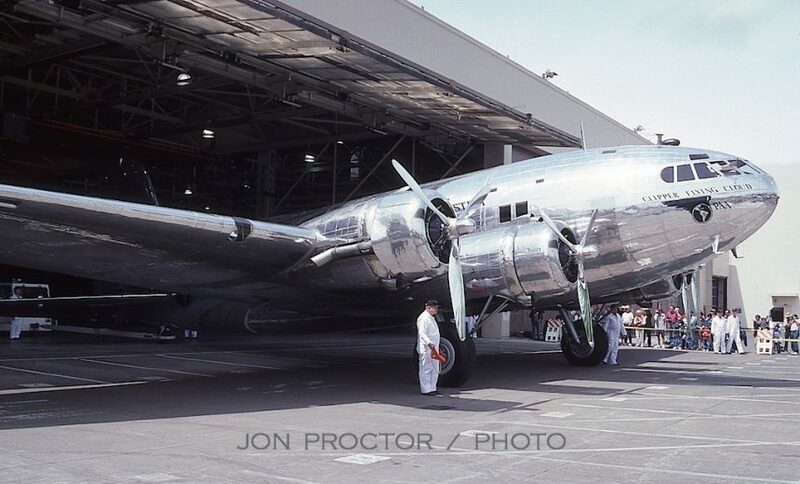 After that crash, the Electra being the newest and technologically newest turbo-propped engines, were grounded and eventually put in service again with severe limits on the engine power. I just Googled tel city indiana air crash northwest airlines and they have a website with video showing how the last few minutes must have felt like in the cockpit! 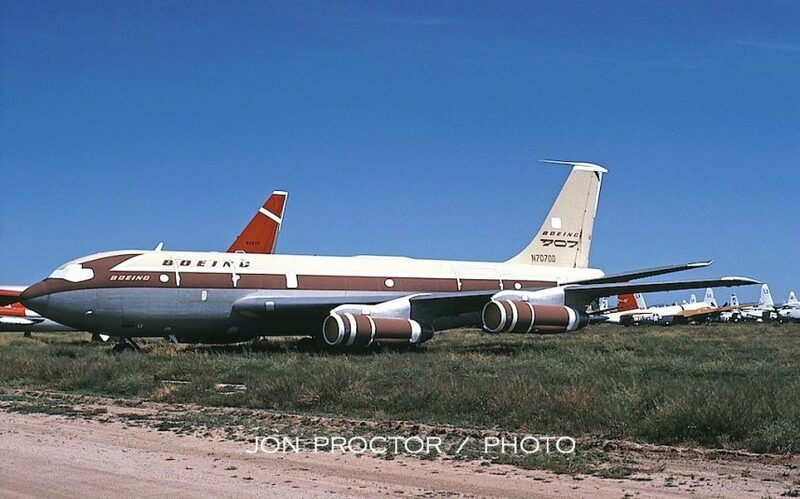 The memories of the B-377 Strato-cruiser that NWA flew had a different set up and held 83 passengers. I mention this as the just arrived RUAEA newsletter is showing a picture of the same aircraft on the back page. It lists the passenger total carried as 55. Do you remember if UAL seated passengers in the lounge are below? NWA did, 14, and 69 upstairs. Of course, going first class also gave you the ability to get a overhead bunk for sleeping…those were the days!! Lots of other things came to mind, but I must show discretion! Wonderful collection! Thanks for sharing. 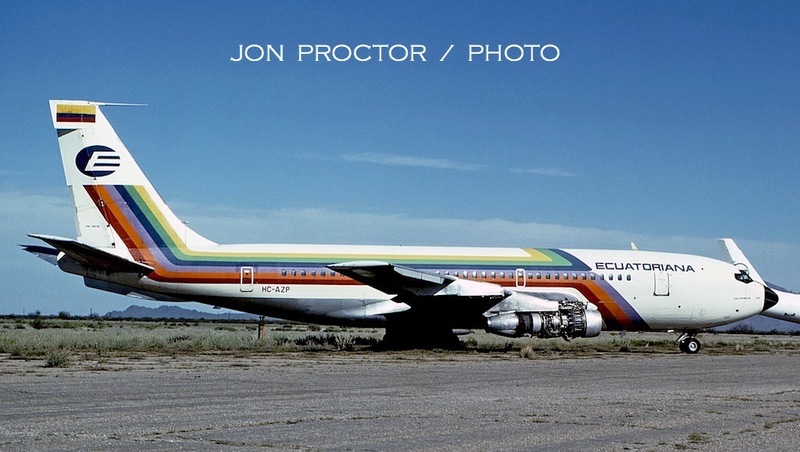 Jon fabulous photos I worked for many of these airlines starting with Western and ending with Continental and retiring after 52 years in aviation you brought back many-great times and memories. Loved the pictures. 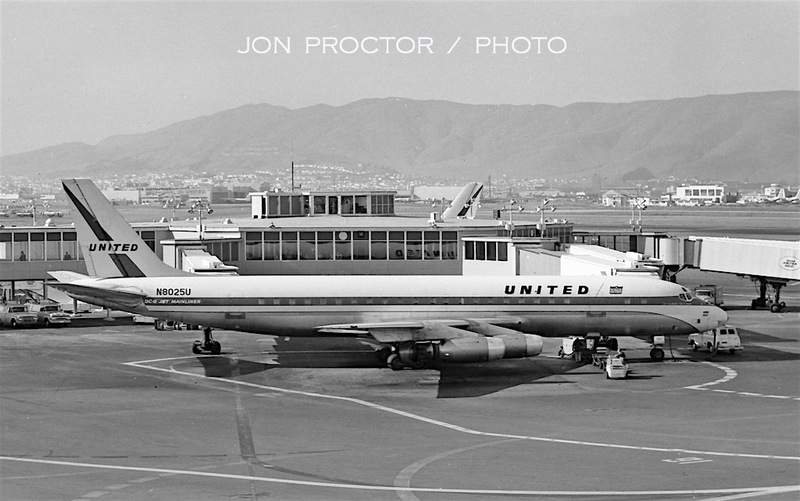 Re the first one, I transfered to SFO with United in Feb. 1961 just before this was taken. It really brought back memories.. Your stories and pictures are a time capsule for all involved in the Aviation industry, thank you for sharing your life’s work. Many thanks for your kind words, Anthony; much appreciated. Remarkable photos with insightful comments. Thank you for taking the time to prepare and submit these. 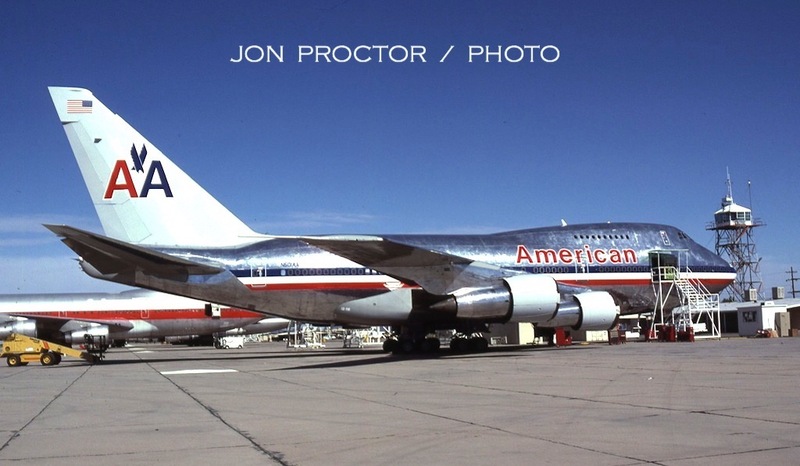 I liked your photos of jets used in 1970s and most of them still look brand new ,when you look at shining metal glare of American airlines. Do you have interior photos of 747,DC 10.Tristar with passengers inside it (from 1970s if possible). Thanks for the kind words; no interiors sorry to say.